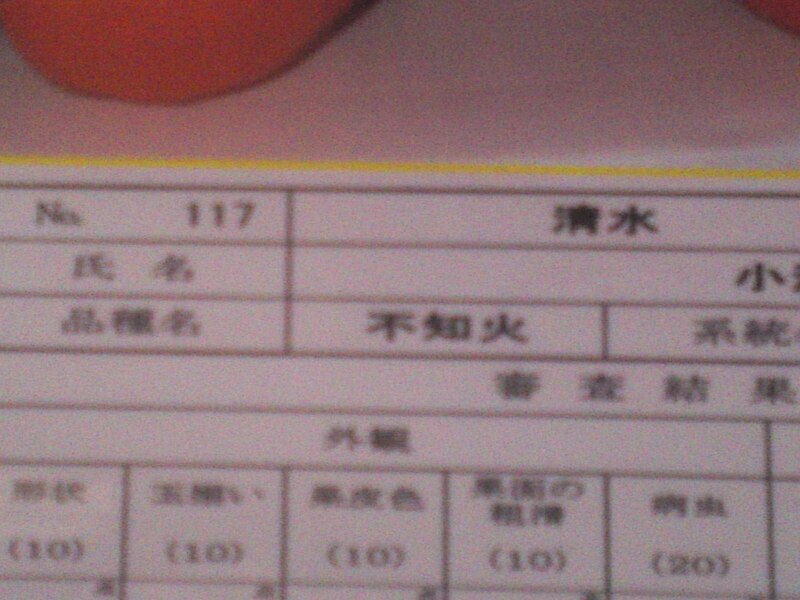 Nobuhiko Onuma/小沼宣彦 between his daughter/睦代, and wife, Yoshiko/良子! Dekopon (デコポン?) 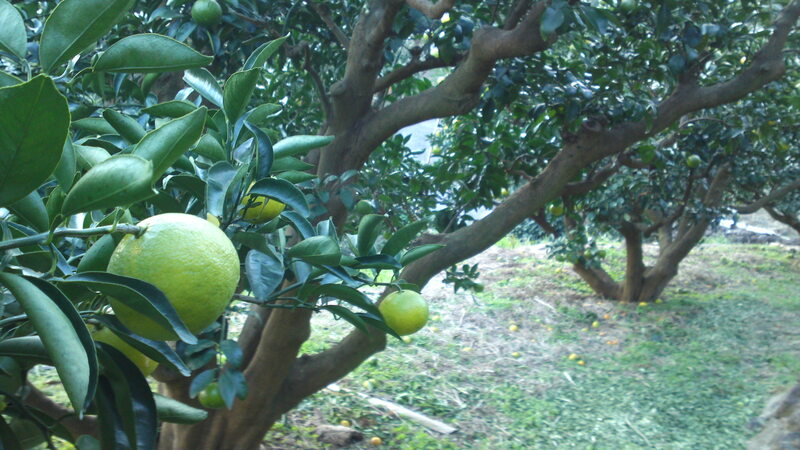 is a seedless and very sweet citrus fruit, a hybrid between Kiyomi and ponkan (Nakano no.3), developed in Japan in 1972 starting from Kyushu Island. 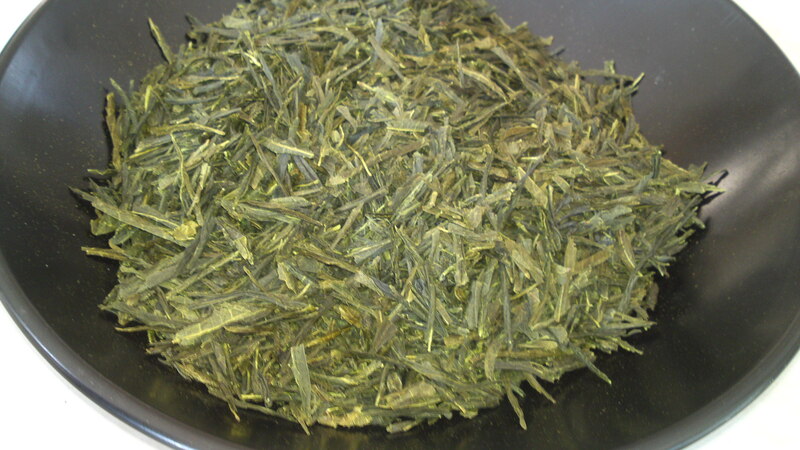 Originally a brand name, Dekopon has become a genericized trademark and it is used to refer to all brands of the fruit; the generic name is shiranuhi or shiranui (不知火). 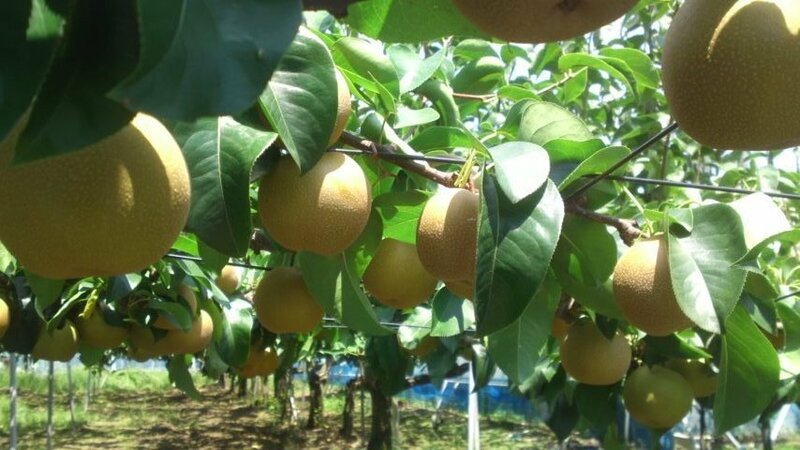 Dekopon is distinctive due to its sweet taste, large size and the large protruding bump on the top of the fruit. 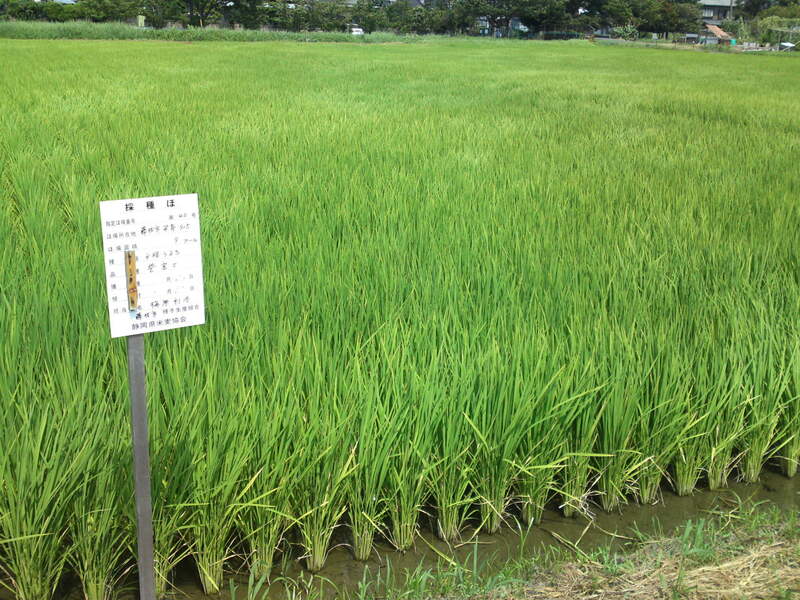 Shizuoka prefecture has become a major producer thanks to its ideal climate. Okitsu Mountains under a glaring sun. 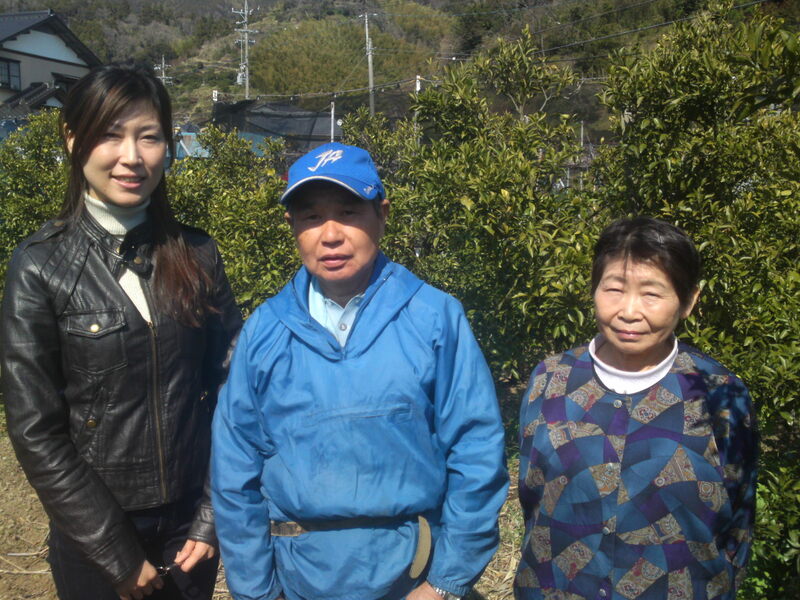 I recently had the chance to make a new friend, Ms. Chikayo Onuma working as a nurse at the Shizuoka Children’s Hospital, whose parents are producers of Dekopon and other oranges in Okitsu, Shimizu Ku, Shizuoka City! 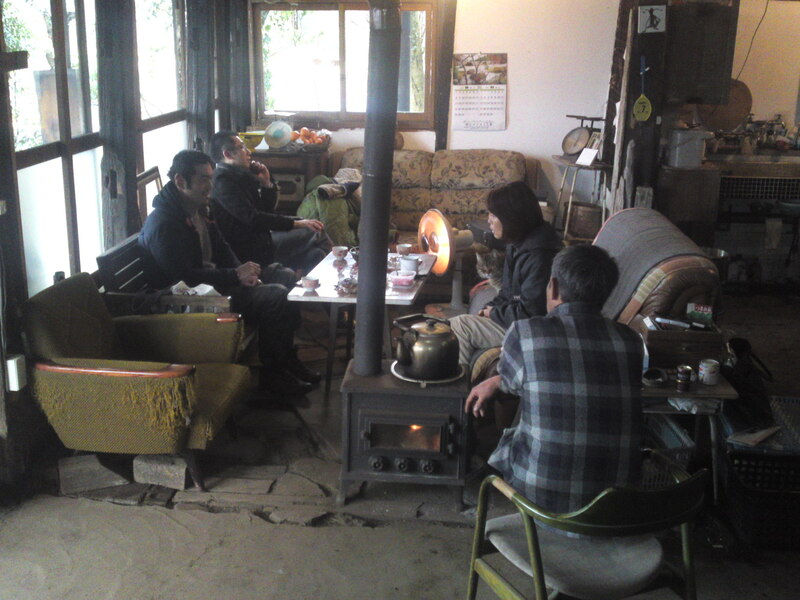 Her parents were very kind to accept this foreign resident to visit and interview them! 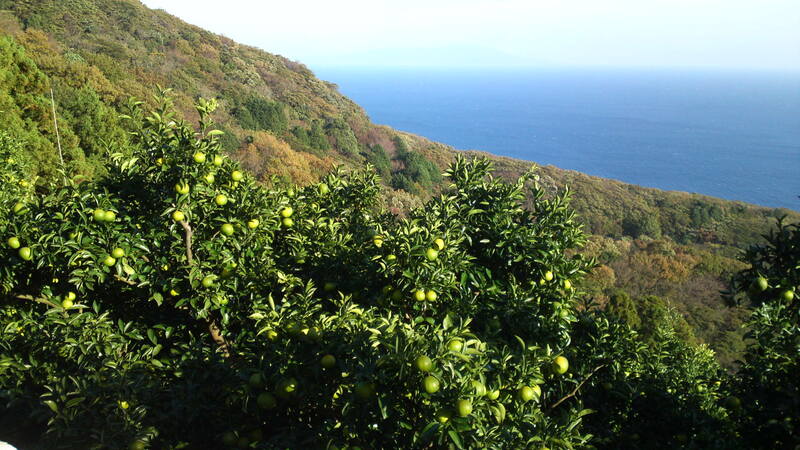 Okitsu in Shizuoka Prefecture is nationally famous for its citrus fruits thanks to an ideal sun exposure and wide differeneces of temperature between day and night contributing to an extarordinary sweetness of the fruit. 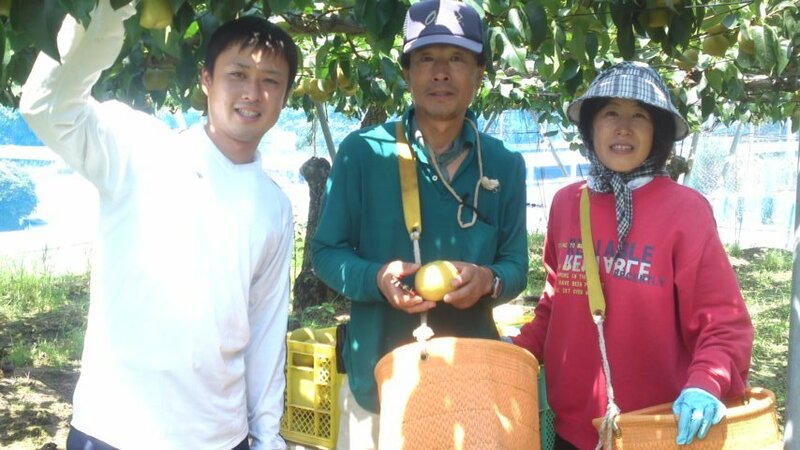 Unfortunately the picking season was finished but we still had a lot to talk about before moving to the ozawa’s home to have a look at their crops. 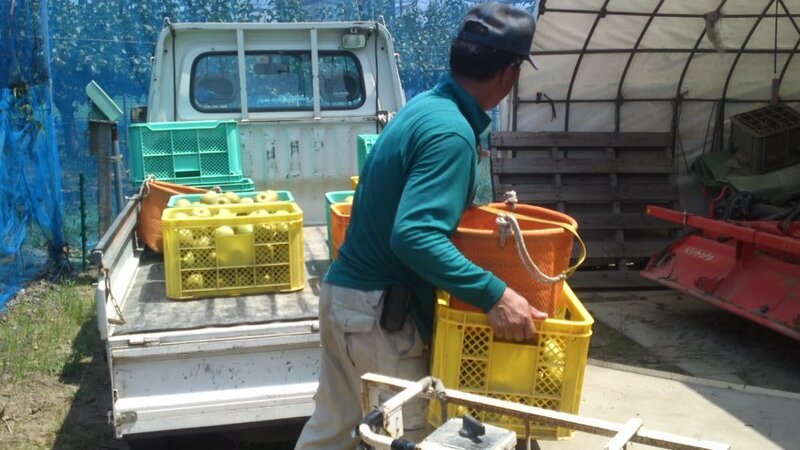 Mr. Onuma produces an annual crop of 3,000 kg of Dekopon, 1,000 kg of Aoshima (Aoshima Shutarou) Oranges, as well as Kiyomi and Suruga Elegant varieties. 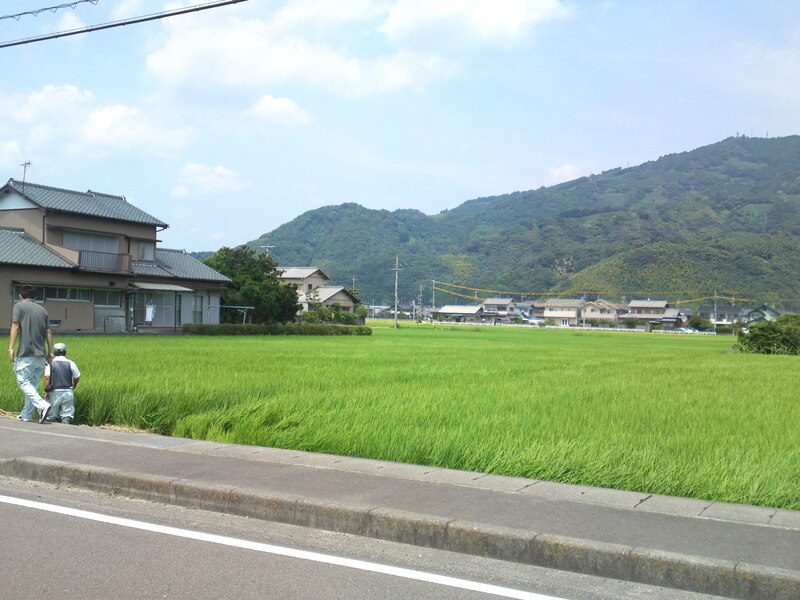 A typical farmhouse in Shizuoka Prefecture! 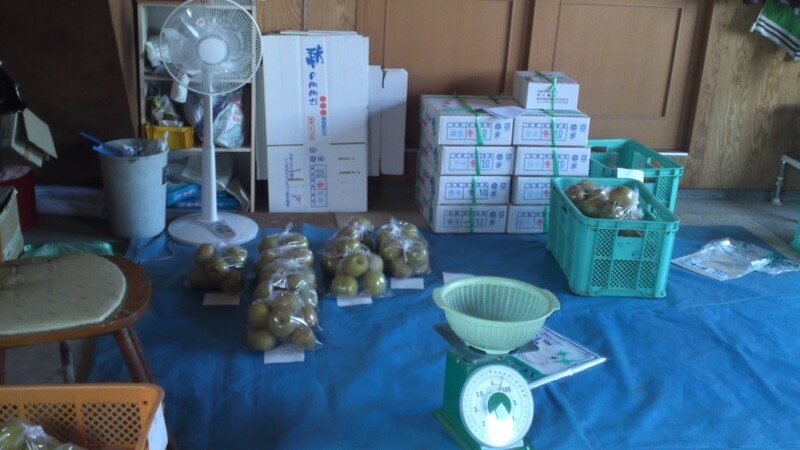 Mr. Onuma sells some of his crop through the JA but mostly deals with a network of private customers and accepts orders through the phone/fax as long as there are any fruit left. You had better hurry as they will disappear soon! 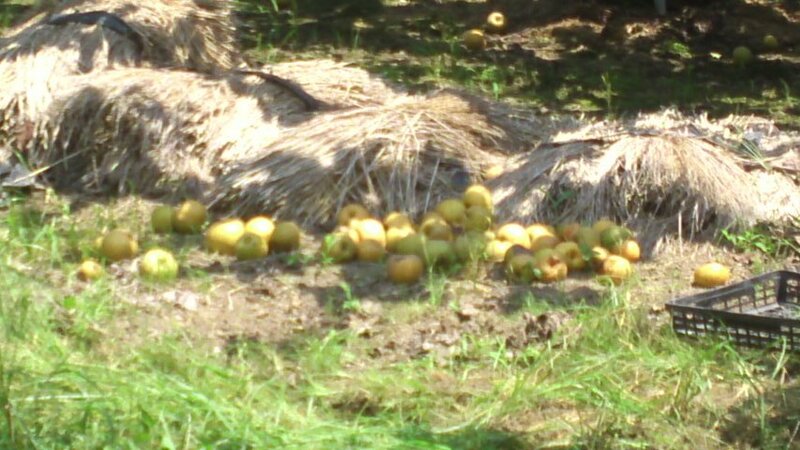 July~August: Pruning and thinning the trees to keep only the best fruit. A neck braking work! 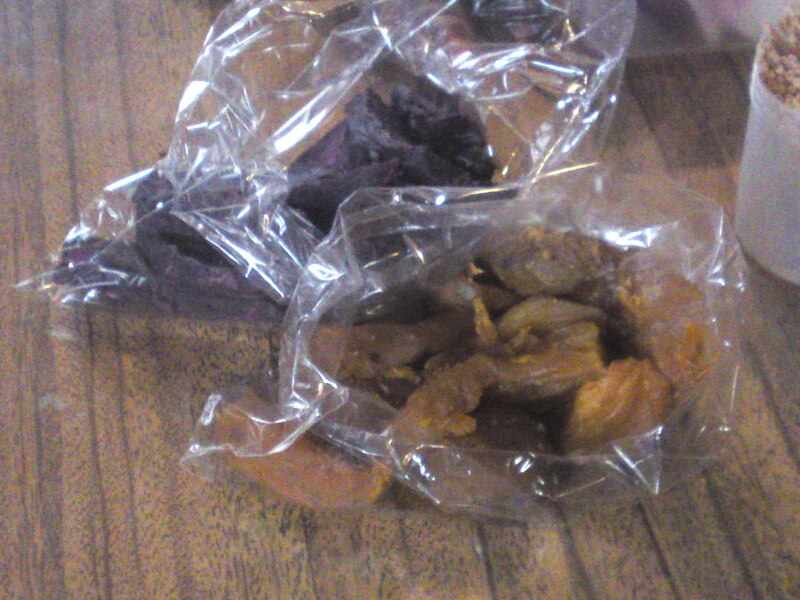 About the 20th of November: Each fruit is individually protected with a paper bag. More neck-breaking work! 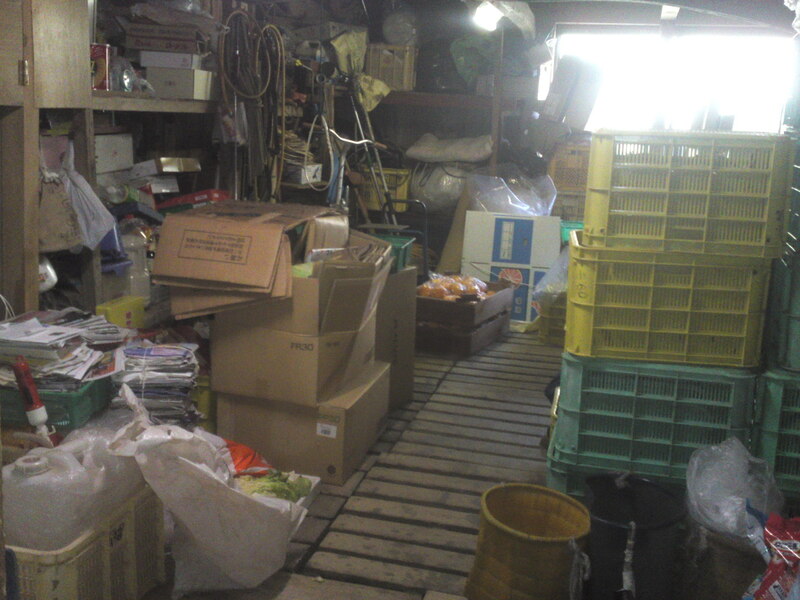 But the work is far from being finished as I will explain later! 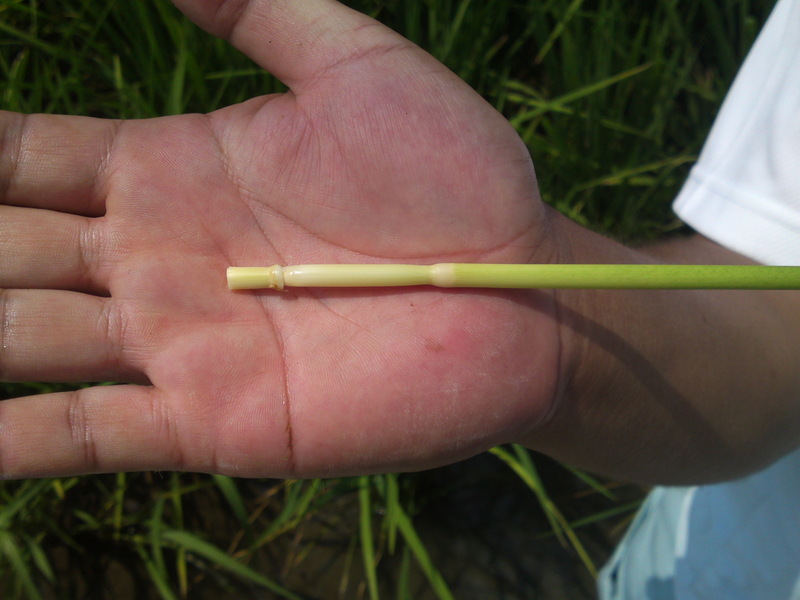 Moreover, fungicide has to be spread 12 times a year. 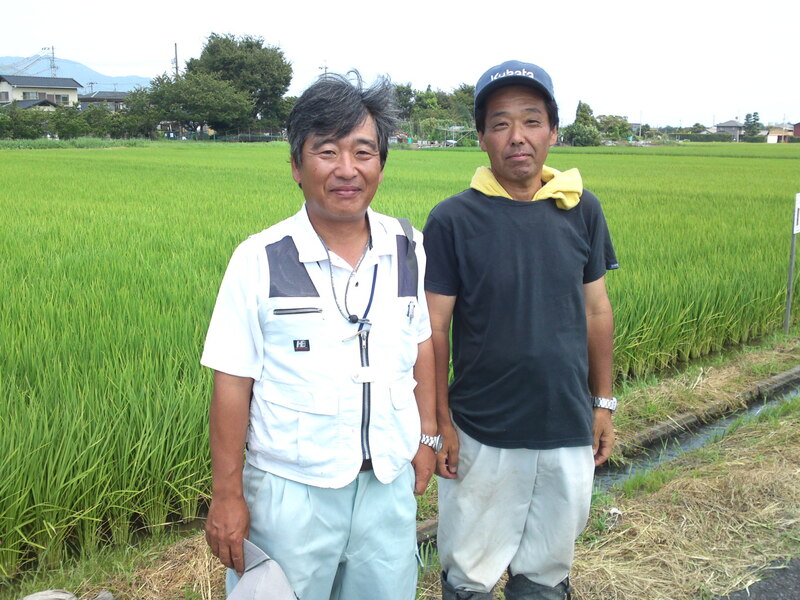 Mr. Onuma told me that he keeps any such fungicide to a minimum and does not use any other agrichemicals. 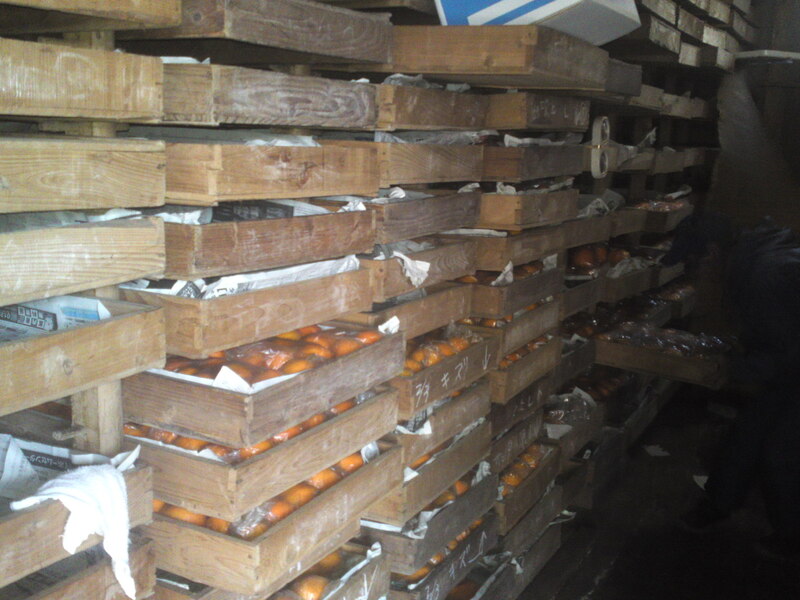 More work is to come as the fruit will be stored in a dark cool shed to mature. 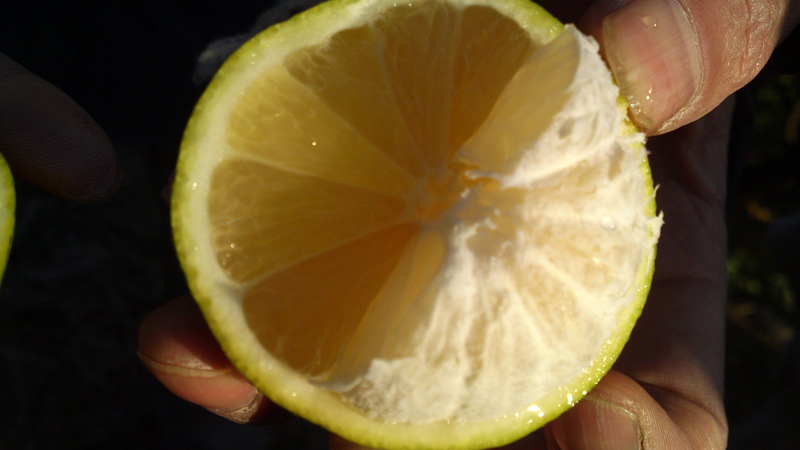 The fruit must attain a level of 13 on the official sweetness scale before they may be called Dekopon. 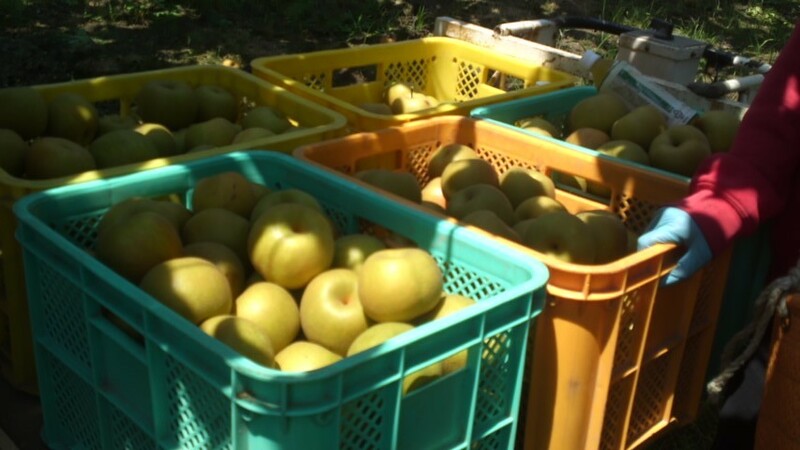 Mr. Onuma’s crop of Dekpon has been awarded the special appelation of shiranuhi (不知火) by the Prefecture, as a sure mark of its excellence! 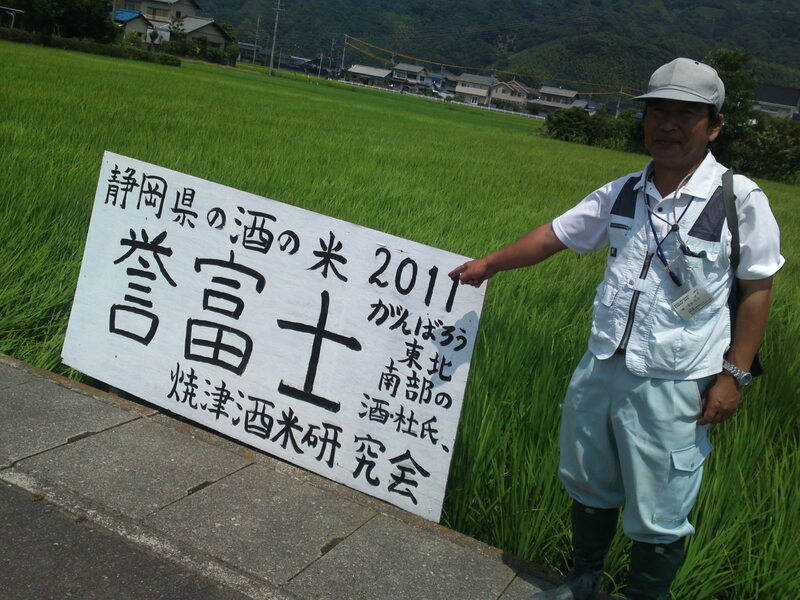 Mr. Ozawa’ shiranuhi have even been prized in spite of the fierce competition! 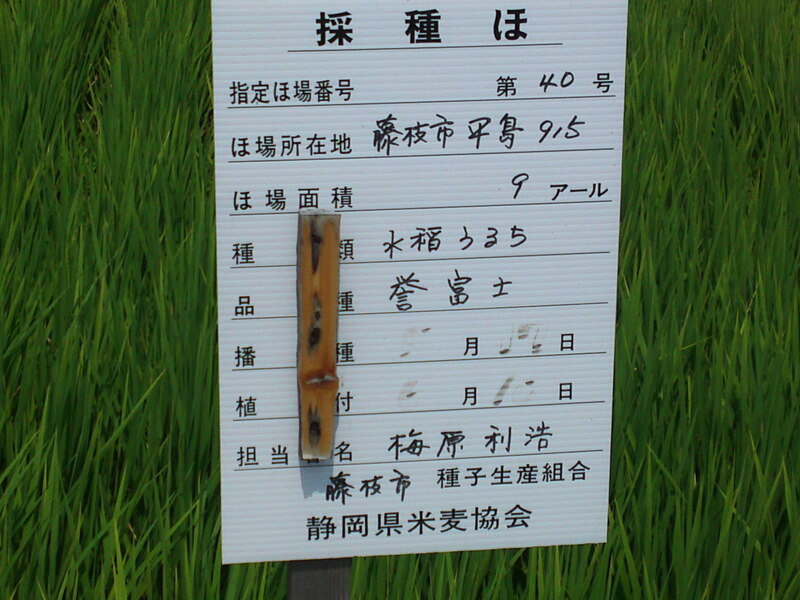 Even Japanese nationals will be hard pressed to pronounce the Kanji for shiranuhi (不知火) properly! 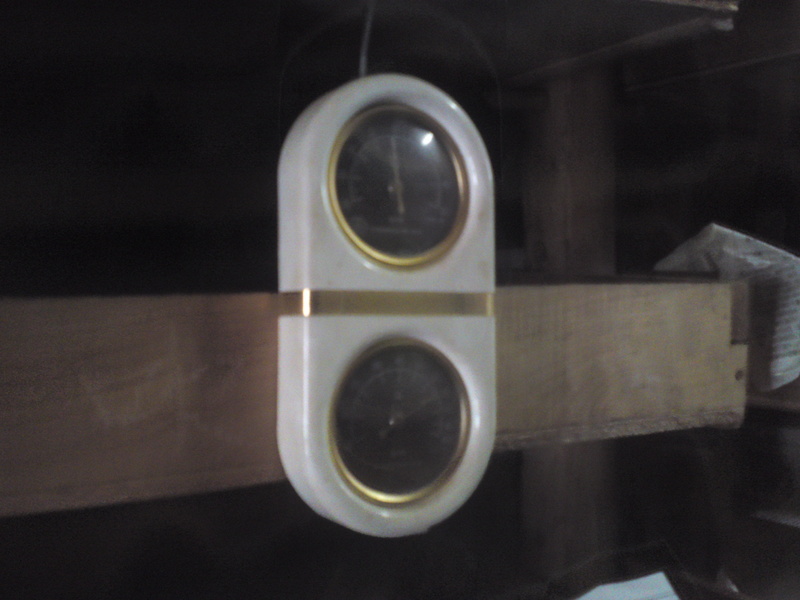 Temperature inside the shed is strictly regulated! And the place is also kept dark at all times! 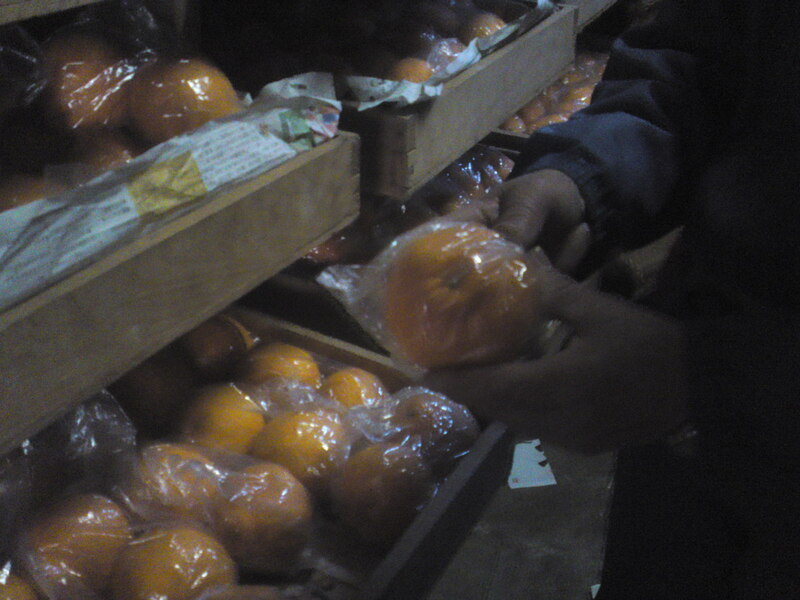 Moreover, each fruit has to be individually wrapped in an open vinyl pouch! I can’t start to imagine all the work and time spent! 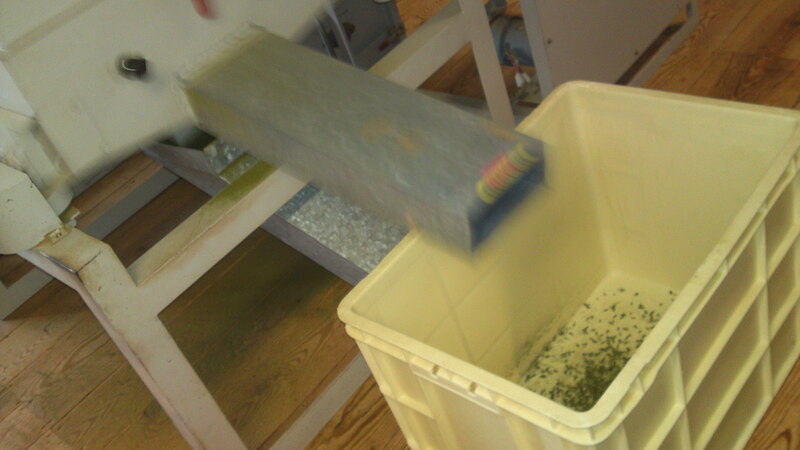 Not to mention all the back-breaking work carrying 10 kg trays out and preparing orders! 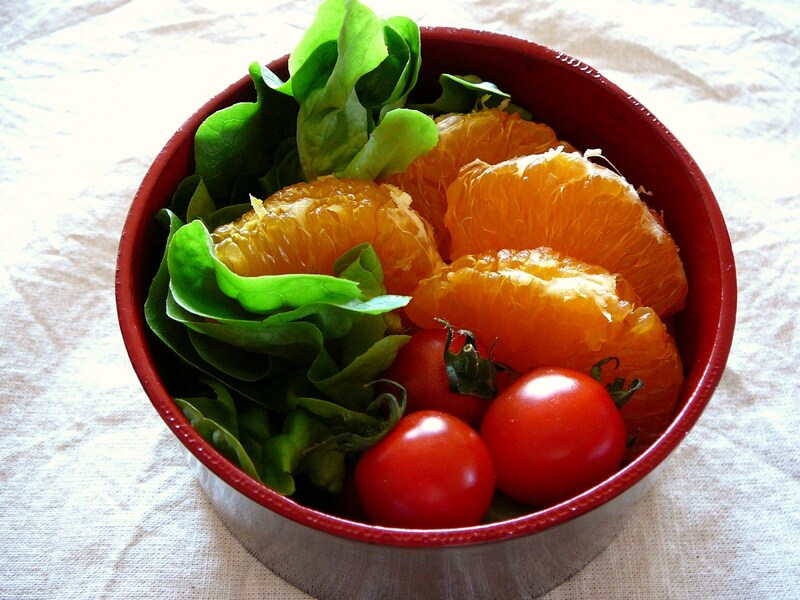 Mr. Ozawa’s dekopon in my bento! 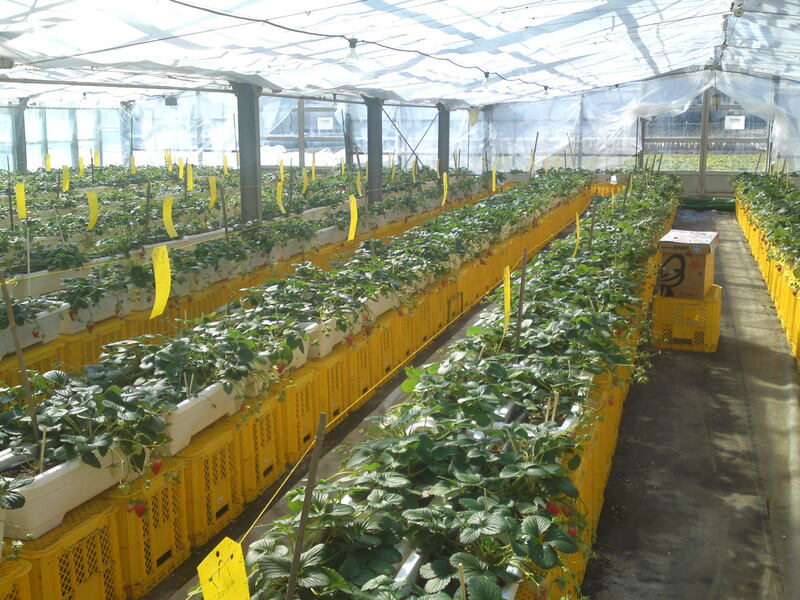 All this to make sure that all the fruit reach customers in the perfect state! Thank you so much, Mr. Ozawa! 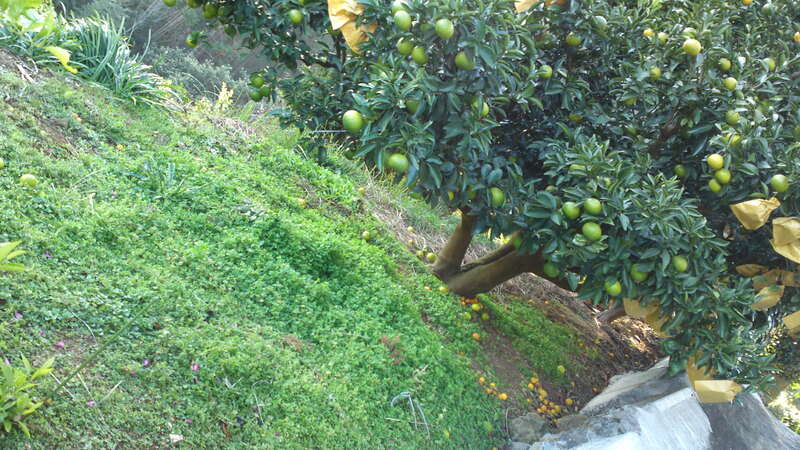 Healthy Oranges in a Healthy Environment! Last Monday I somehow managed to get a full day free (and I certainly needed the whole of it!). 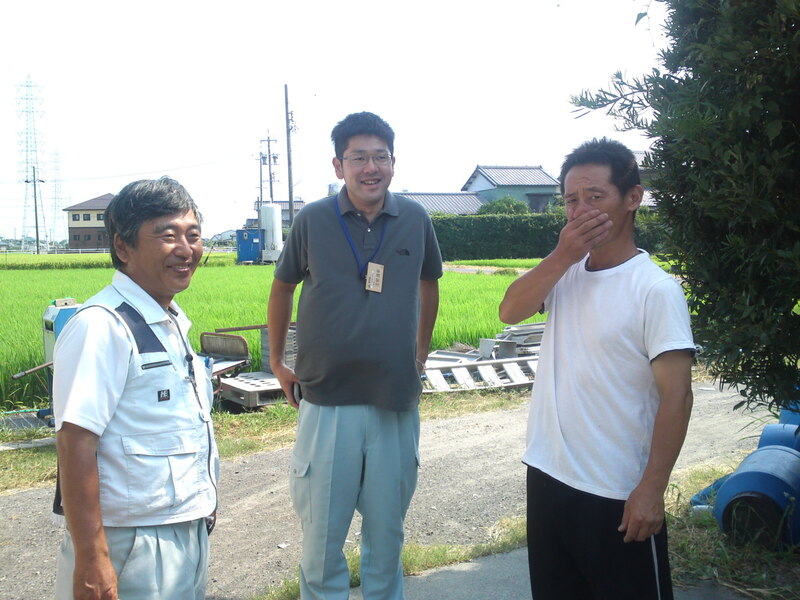 My good friend Yasushi Imaizumi/今泉康 drove me on a grand tour of the Eastern part of Shizuoka Prefecture. 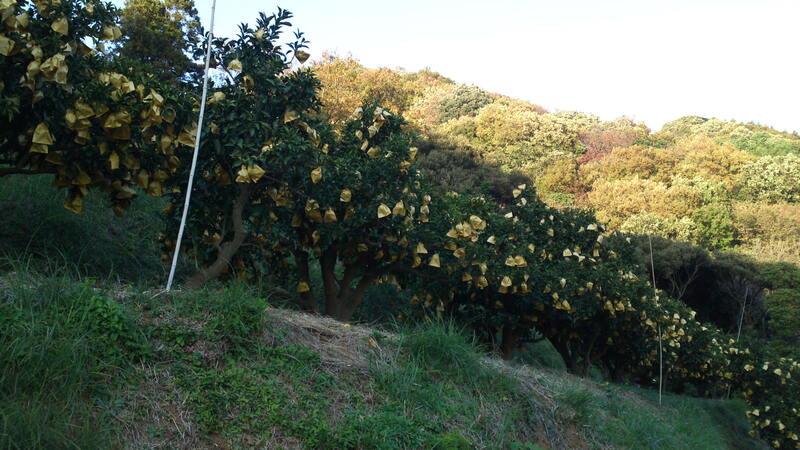 Our destination was a remote place deep south the eastern coast of Izu Peninsula. The day was just gorgeous! Absolutely blue skies and mild temperatures. 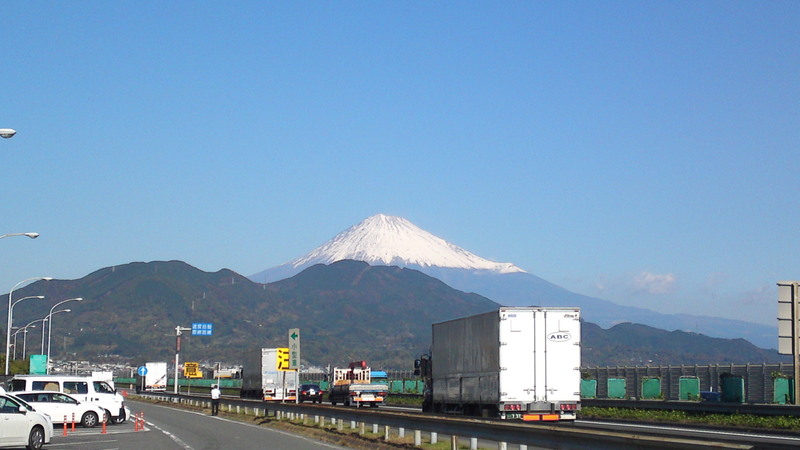 We just couldn’t help taking pictures of snow-capped Mount Fuji on the way! 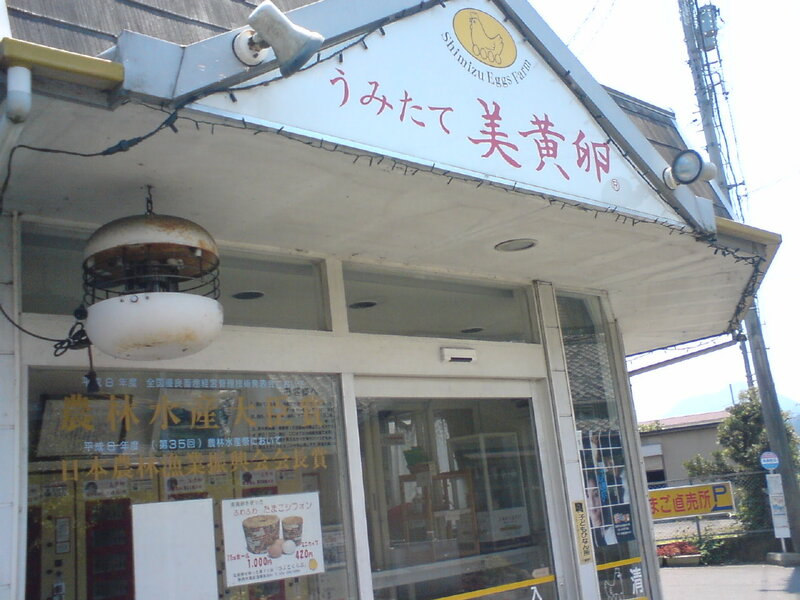 It took us (Yasushi) three hours to drive down to Shirata/白田, near the minuscule fishing harbor of Inatori/稲取, in Kamo Gun/賀茂郡, only a short distance from Shimoda City/下田市. 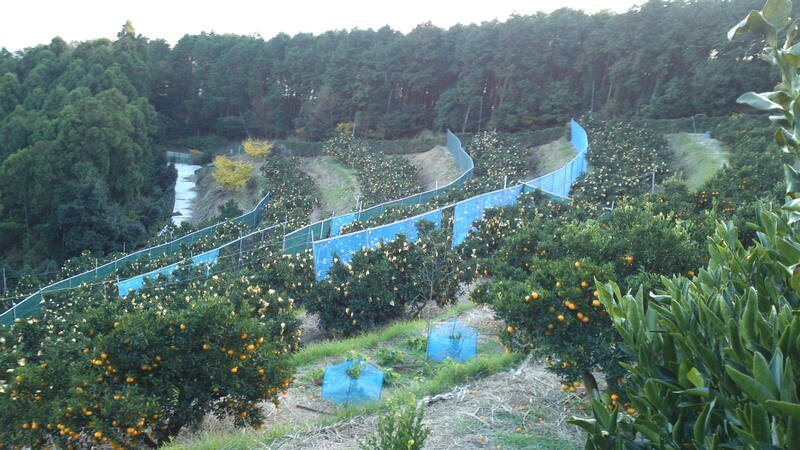 There, we discovered the oranges orchard of the Shiratori Family with an incredible view over the ocean. By clear weather you can see as far as Oshima/大島 Island! Miyoko Shiratori/白鳥美代子, a live-in student, her daughter-in-law, Hiroko/弘子, her son, Takehisa/岳寿 and her husband, Ryuusaku/龍作. 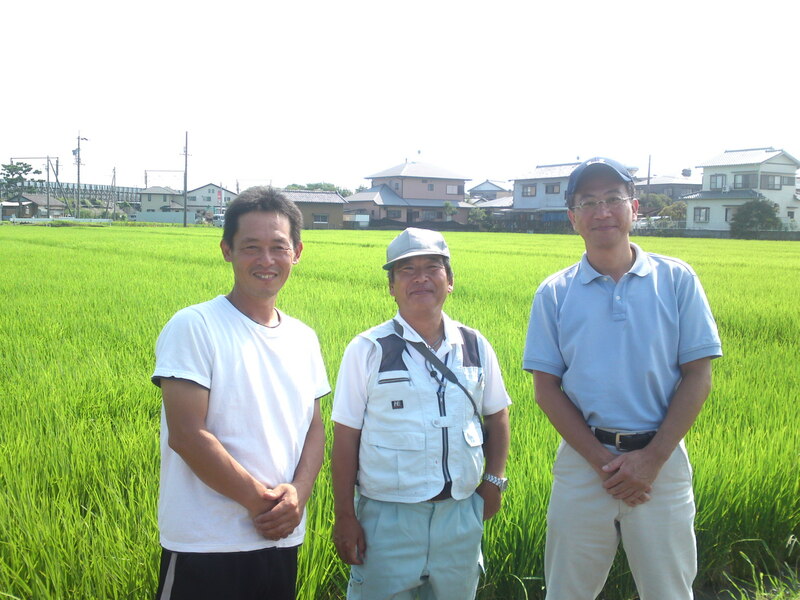 Mr. Ryuusaku Shiratori/白鳥龍作 (82), was a seventh generation of growers of rice, tea, oranges and wasabi back in Shizuoka City until he decided to move there 40 years ago to become the first of three generations of orange growers. This must have been the right choice as he and his wife Miyoko/美代子 could pose in any magazines as models of incredibly healthy longevity! 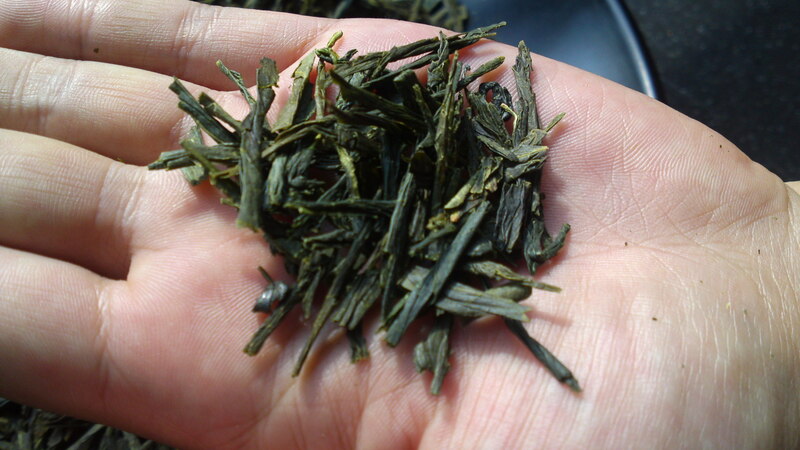 Having bought those 2 ha of steep terrain, he had it buldozzed into shelves within three days! I can tell you that you need good feet and good eyes to move through the orchard! He has never looked back since then! 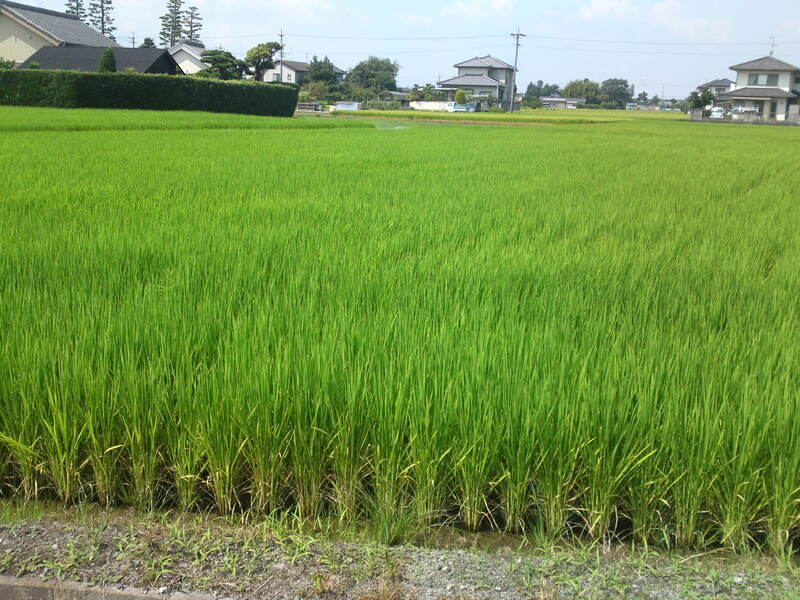 He is presently helped by his son Takehisa/岳寿　(54), his daughter-in-law, Hiroko/弘子 (49) and his grandson Tatsumi/達巳 (26). 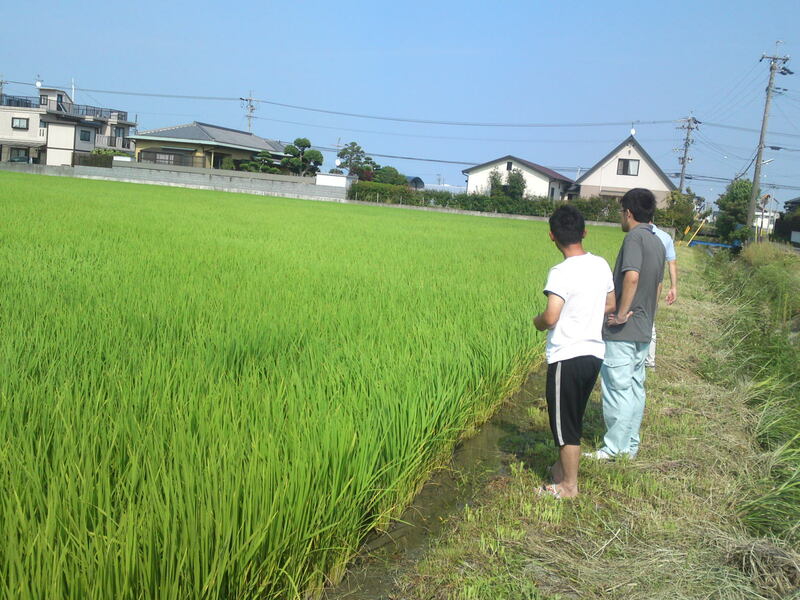 They also get the very much needed hands of a live-in student from Shizuoka City. 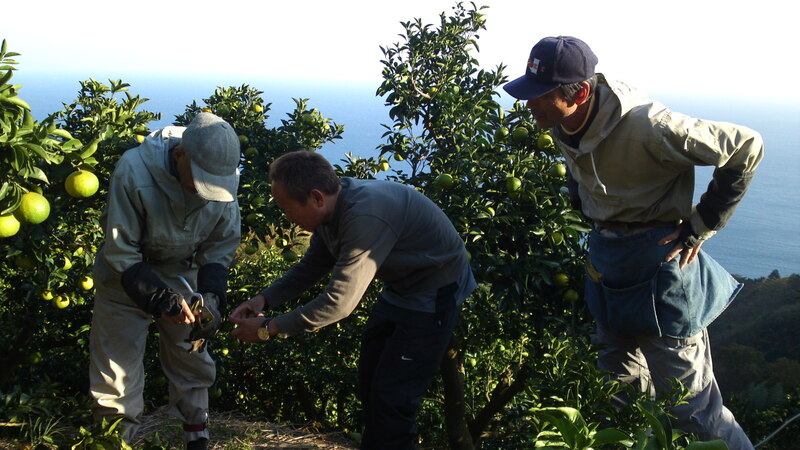 Ryuusaku Shiratori demonstrating cuttings to my friend Yasushi. 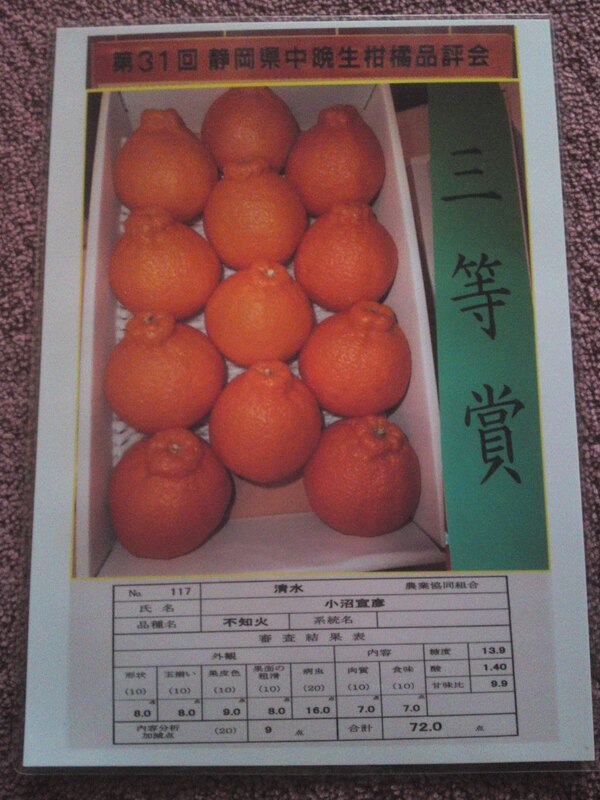 They do grow many varieties of oranges and one of them, a hybrid developed by Ryuusaku, Shiratori Hyuuga/白鳥日向 (developed from Hyuuga Natsu/日向夏 from Miyazaki Prefecture in Kyushu Island) has been registered with the Japanese Agriculture & Forestry Ministry! Actually, he is quite well-known as no later than a week before a whole Tokyo HHK TV crew of 10 staff and 2 cameras spent a whole day there! 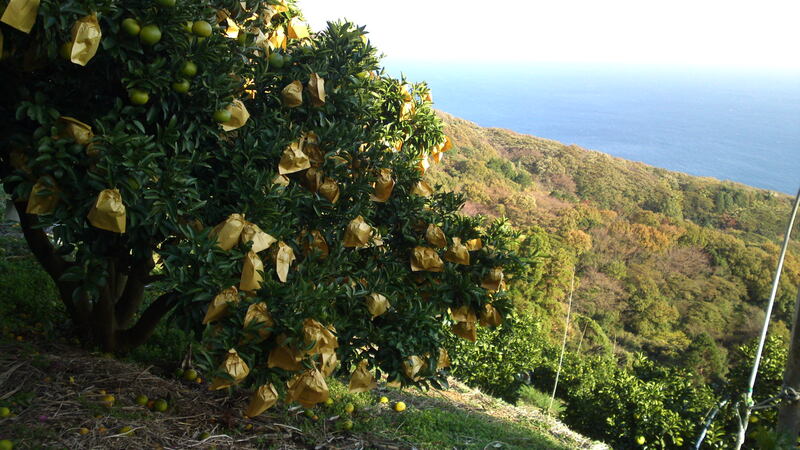 These Hyuuga Shiratori oranges are carefully pruned away to leave only the best fruit which are wrapped in paper for better fruition! Another view of the trees! The wrapping takes days and days! 40-years old trees! 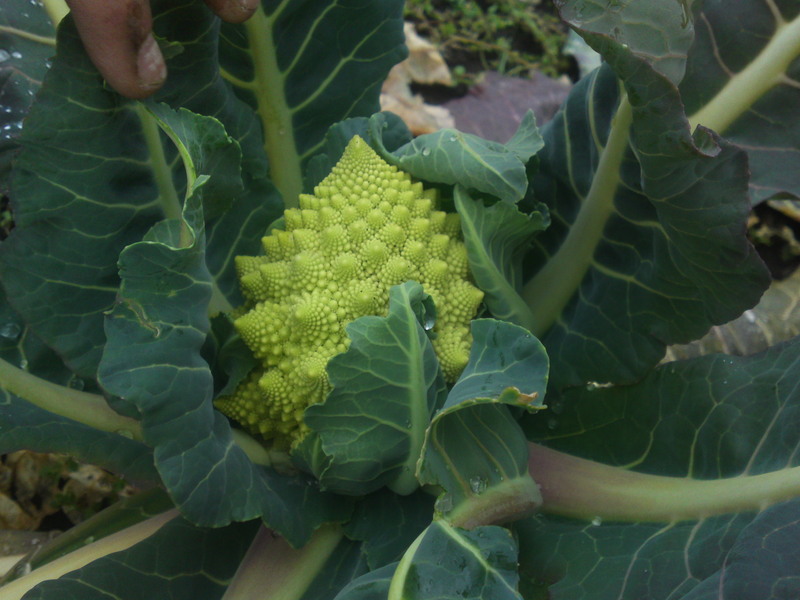 They can be harvested until the grand age of 60 years! 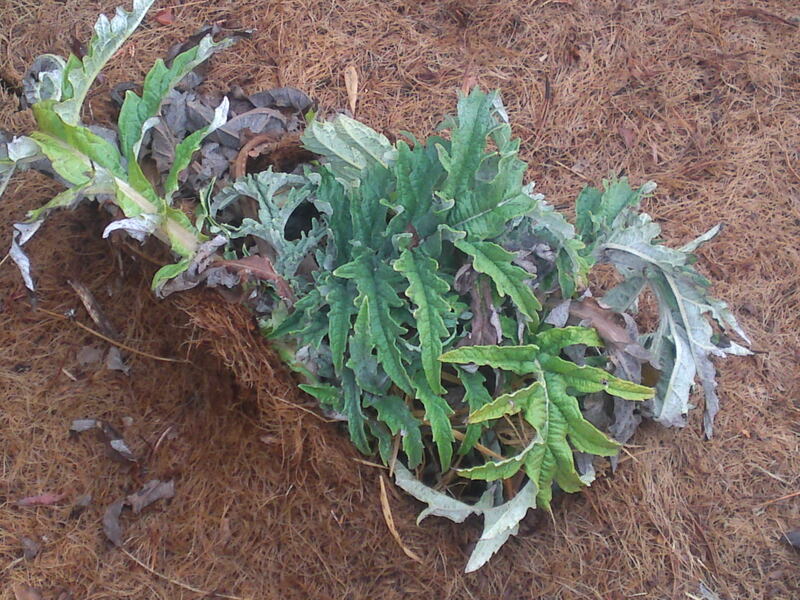 Trees are propagated with cuttings planted directly into the soil. 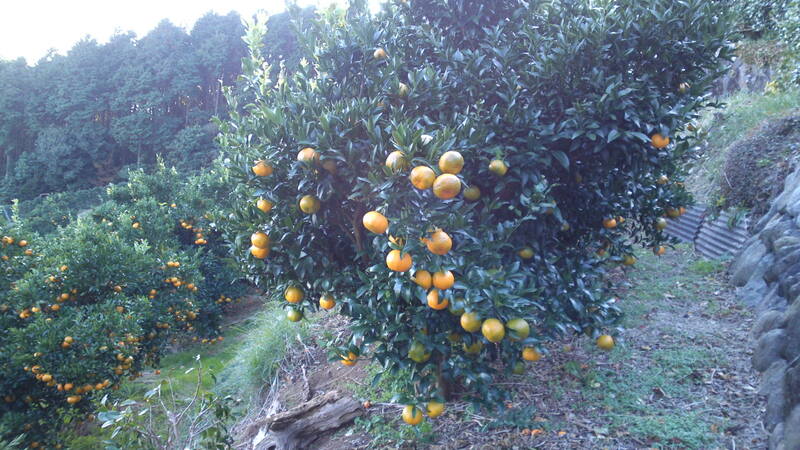 These new trees will be completely pruned for 4~5 years before harvesting the first oranges. 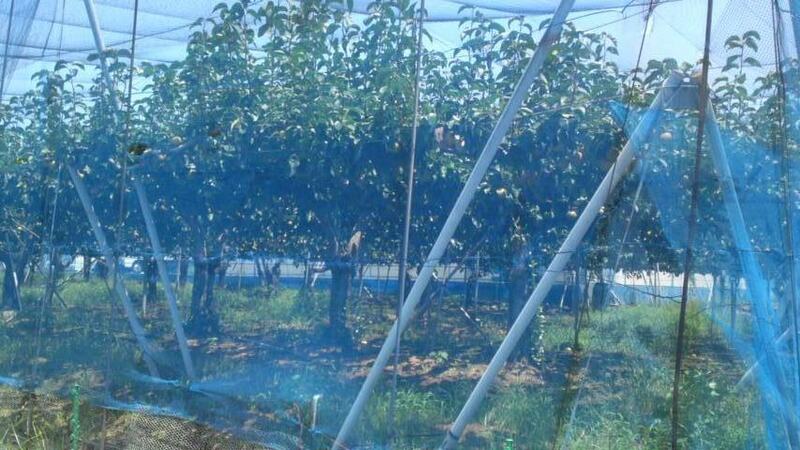 100% organic culture is impossible, but the Shiratoris reckon that their orchard is more than 90% organic. 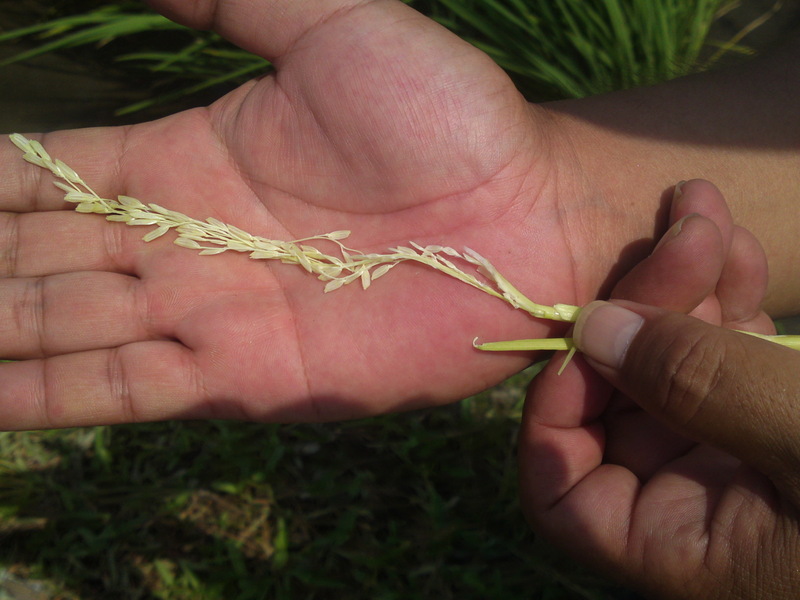 The second and third generations have actually been awarded the title of Ecofarmers by the Government! 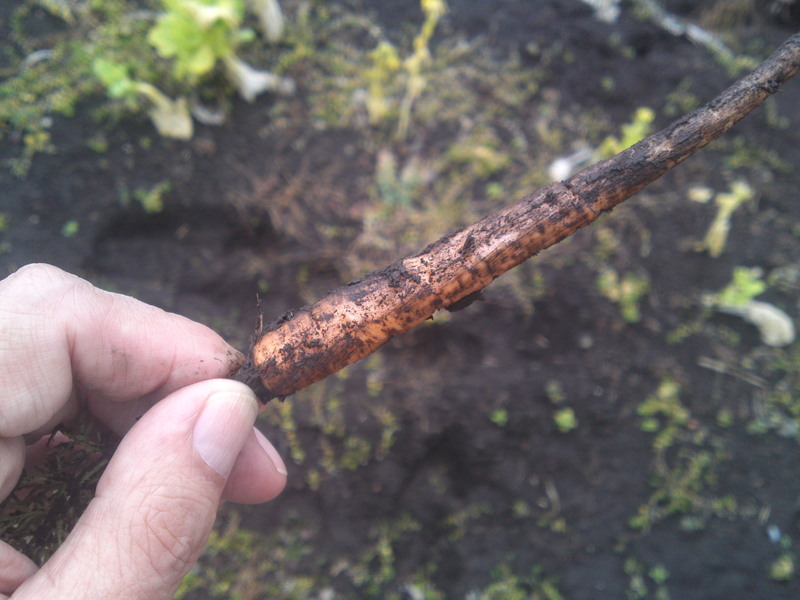 Fertilizer is practically organic. 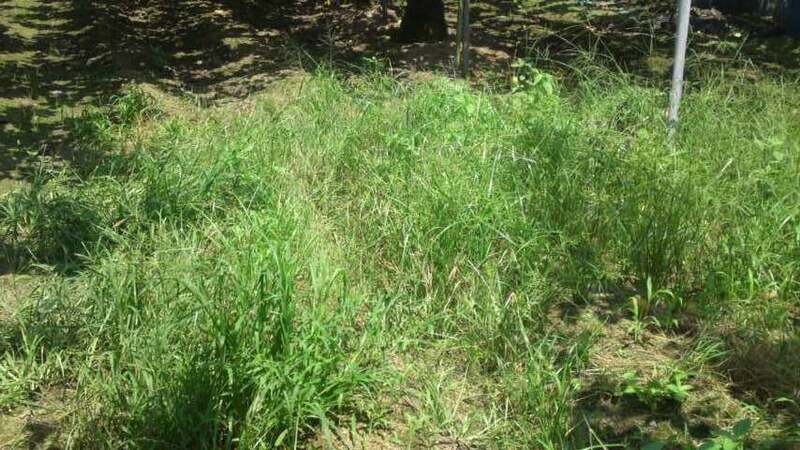 You understand it when you see the beautiful grass growing between the trees. 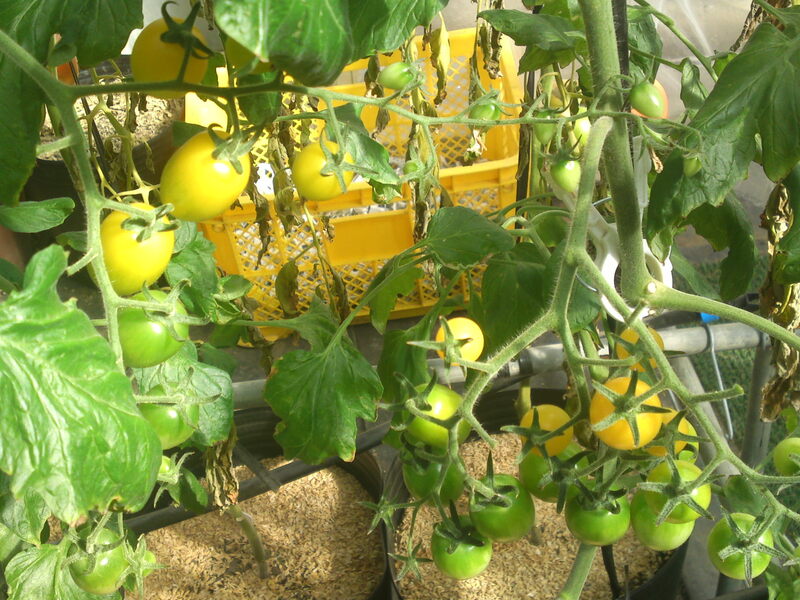 As for pests, they use the very minimum of pesticides and introduce natural enemies of such pests such as ladybugs and other carnivorous insects! 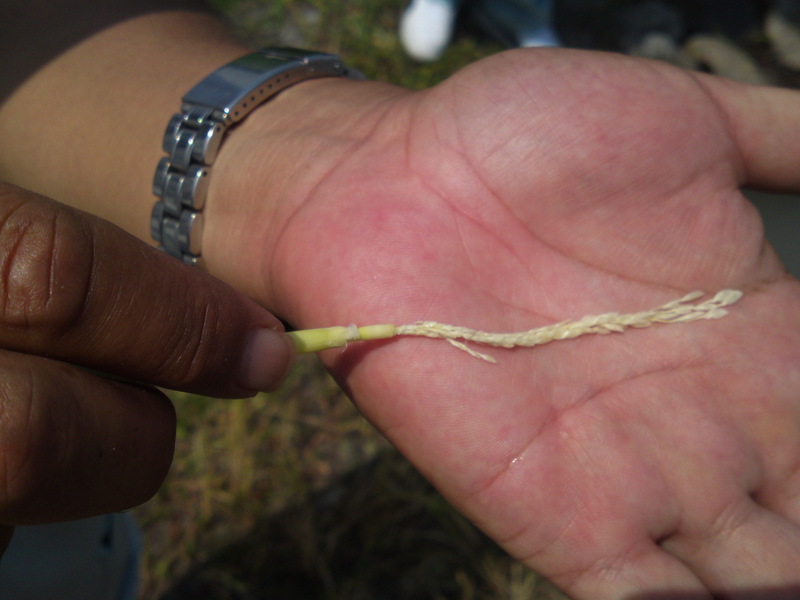 Pollination is done either by hand, with the help of the wind, or with rented bees! 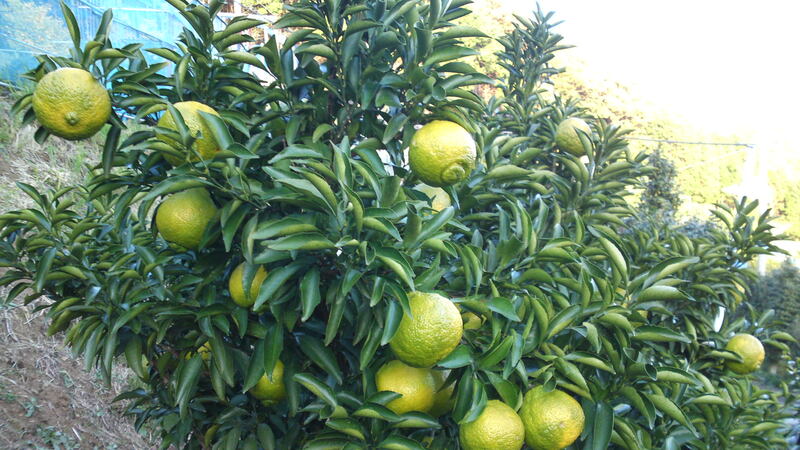 Their Shiratori Hyuuga oranges, although seedless and full of juice, will take two more months to mature to a tasty and sweet juice. This beauty is not ready yet! 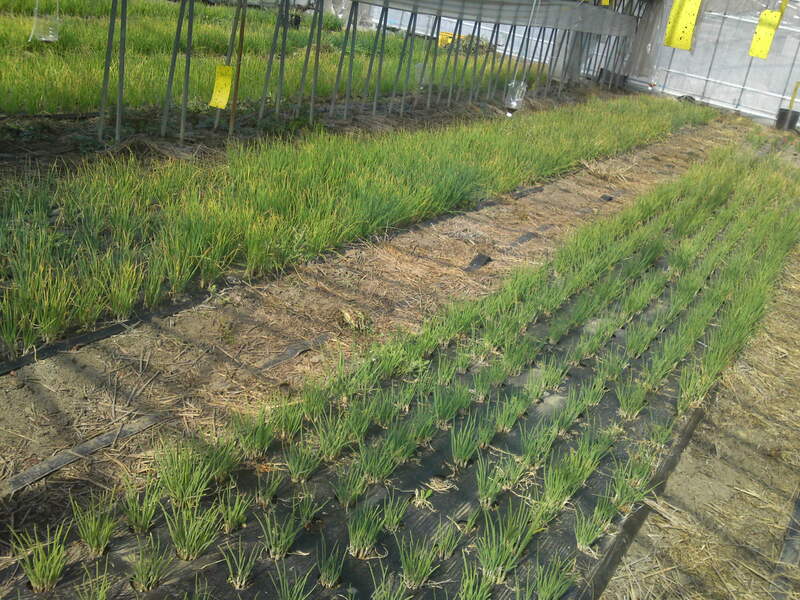 As I said, they grow many varieties to organize a constant harvest and delivery. 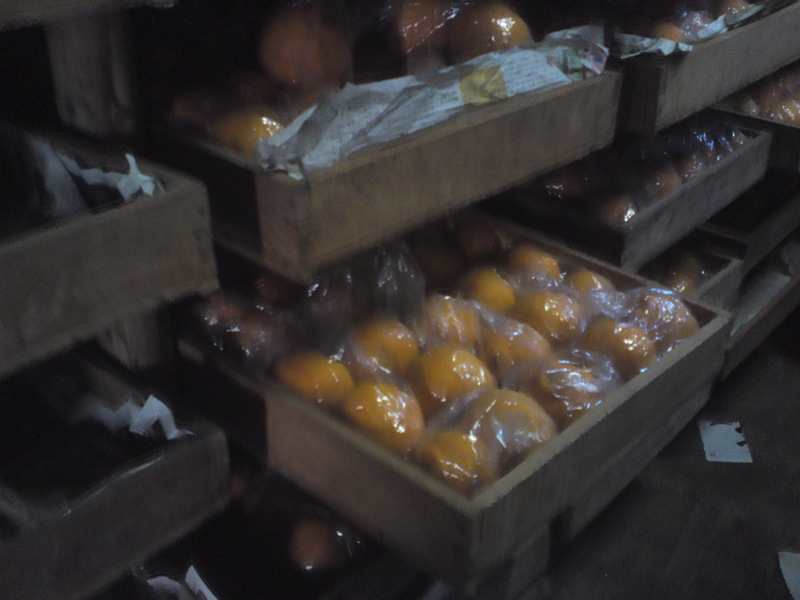 Among them Haruka/晴香, Ponkan/ポンカン, and New Summer Oranges are extremely popular. 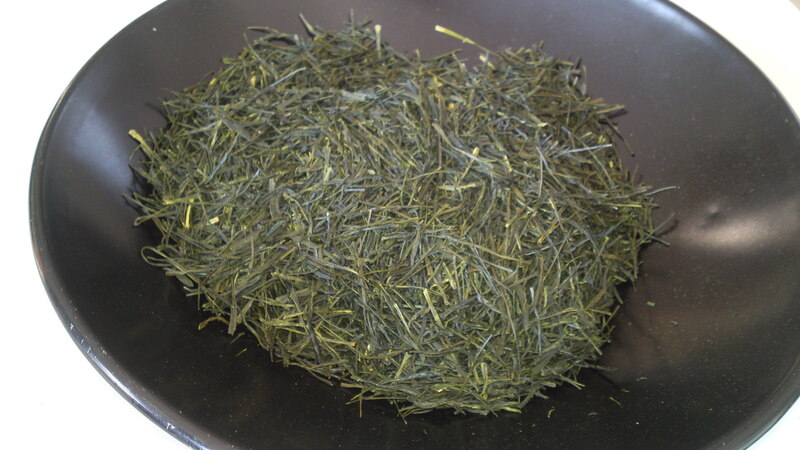 Ponkan ready for harvest and delivery! 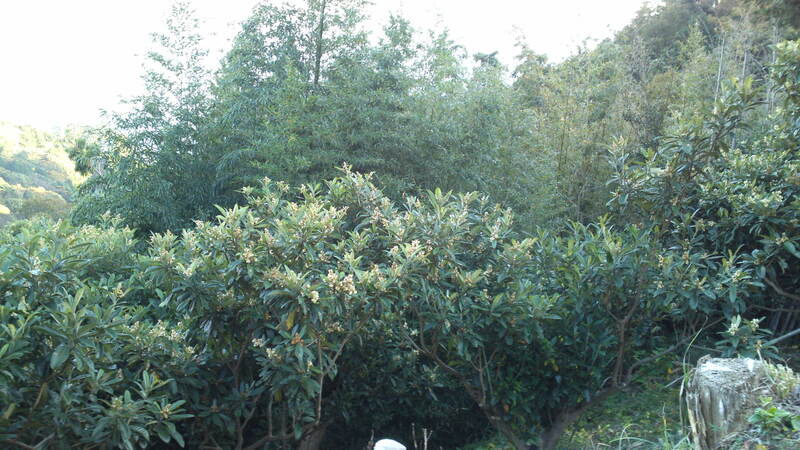 They do grow and experiment with other fruit such as loquats/biwa/琵琶! Although great exposure to the sun and big differences of temperature between day and night are welcome, the wind isn’t! 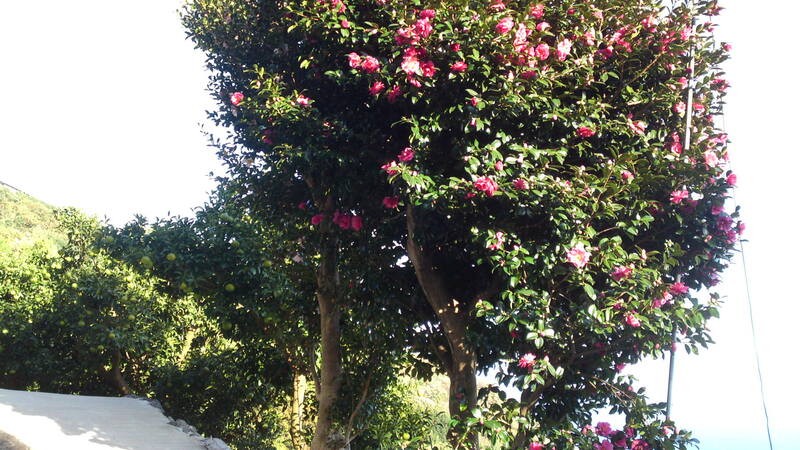 To fend off the wind, Ryuusaku planted hedges of camelias/tusbaki/椿. 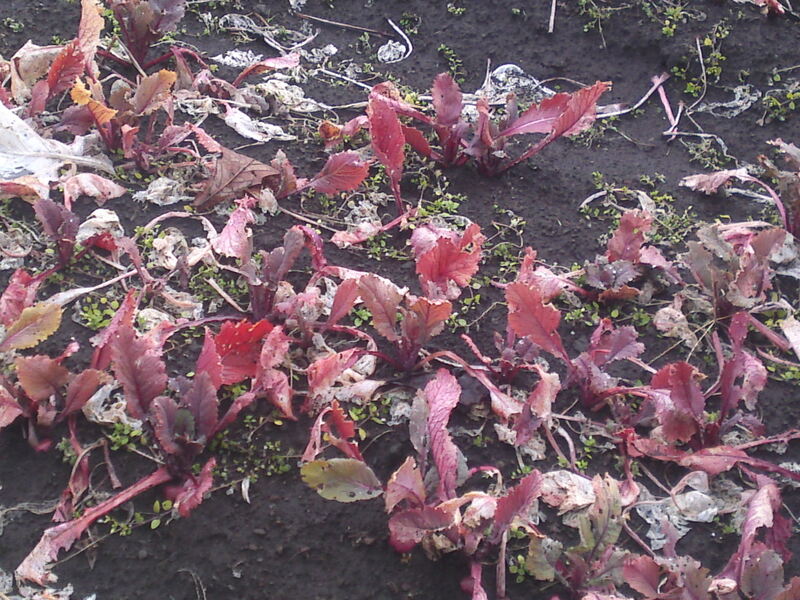 He likes them so much that he made a point to plant as many varieties as possible. He invited me to admire them next February! 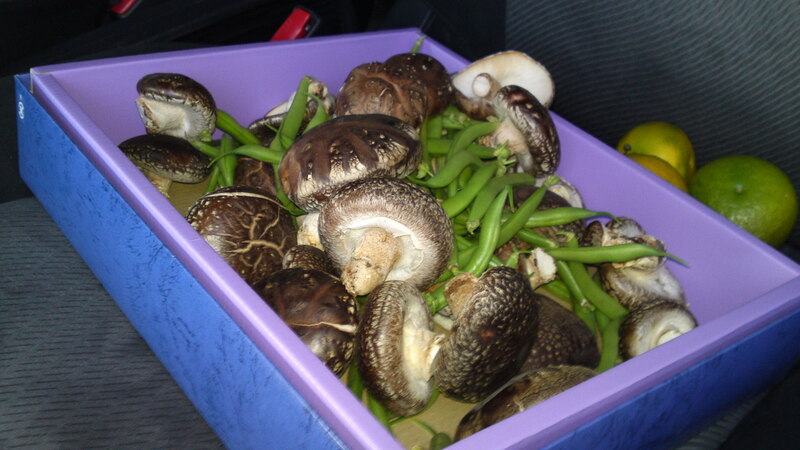 They do also grow a lot of their own food, such as these shiitake mushrooms and string beans I was offered to take back home with a whole bunch of ponkan! Since I have to make at least two more trips expect more pics and explanations! 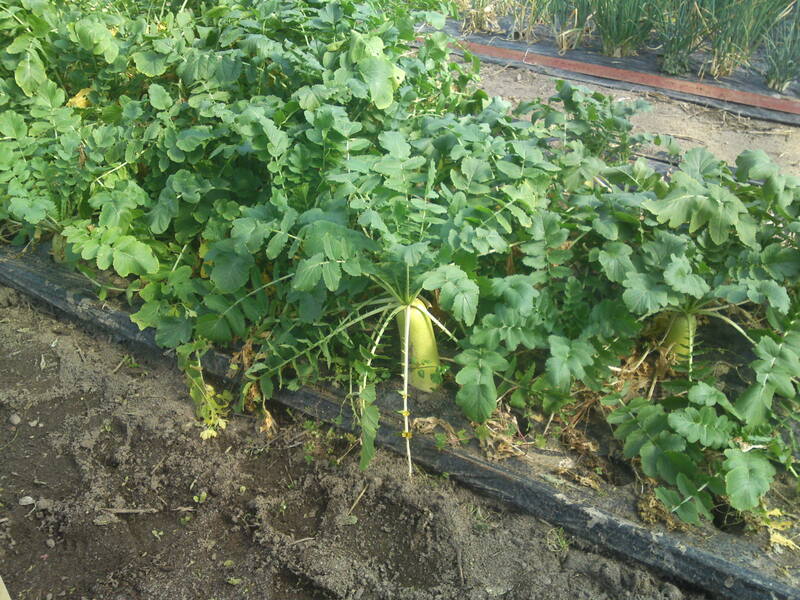 Check their HOMEPAGE for orange varieties, prices and orders! As explained in my previous article I was back on the bicycle trail on Saturday with the difference was that I reached the place in record time in spite of the oppressive heat! 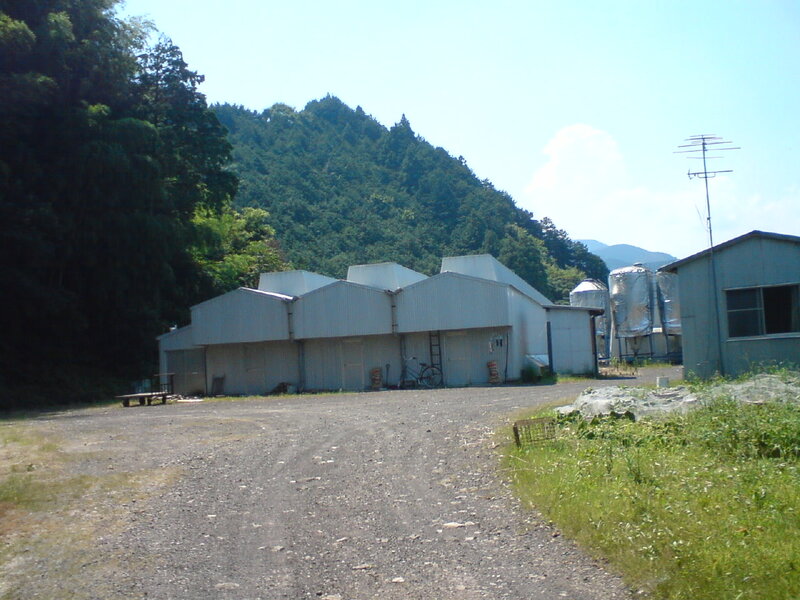 I wonder how many tonnes of feed are contained in these silos and accordingly, how many birds are inside the coops! 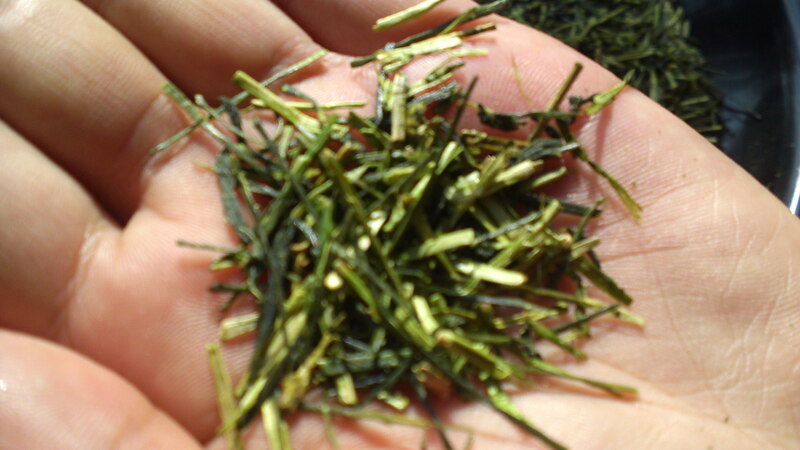 After all, the whole place covers no less than 1,500 tsubos (4,300 quare meters), big for a single producer in Japan! 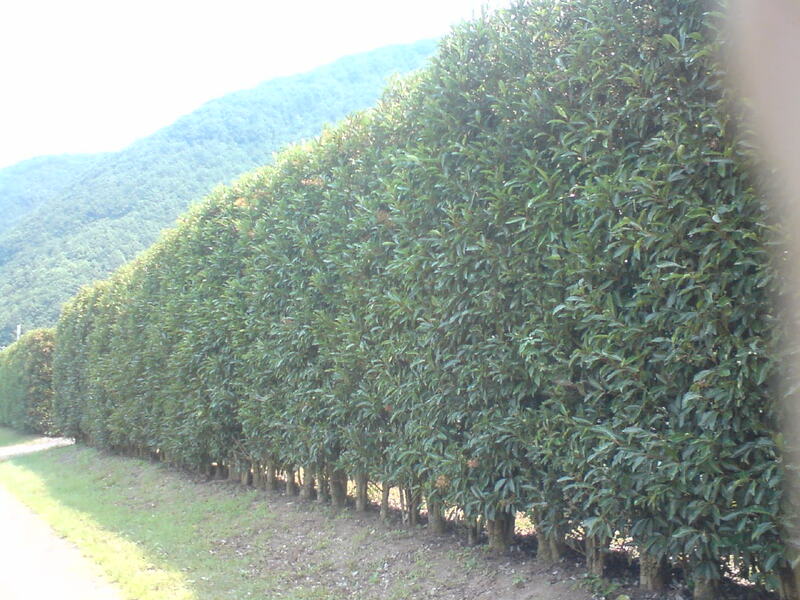 The whole complex is surrounded by a tall hedge to protect it from the wind and help control the ambiant temperature. 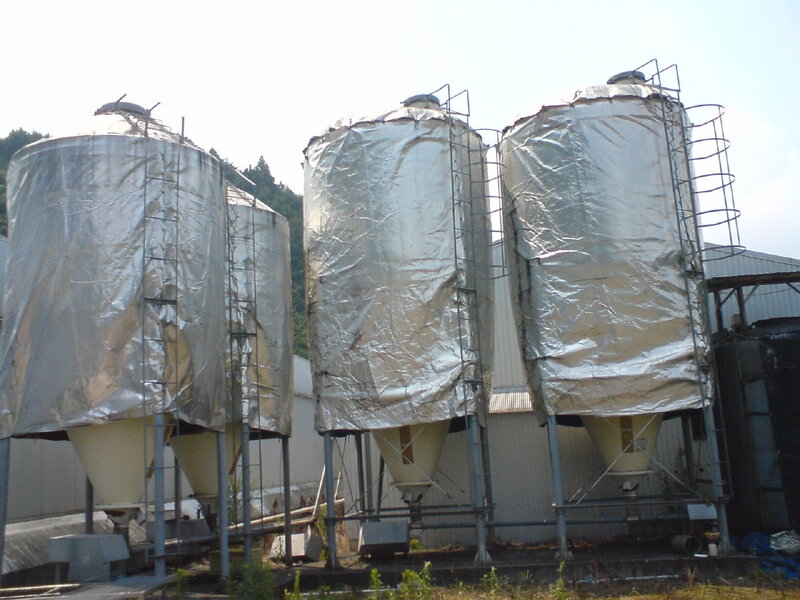 Incidentally, I noticed that the silos were also protected against the variations of temperature. I finally found the real entrance to the compound which opens at the very back, away from unknown eyes! 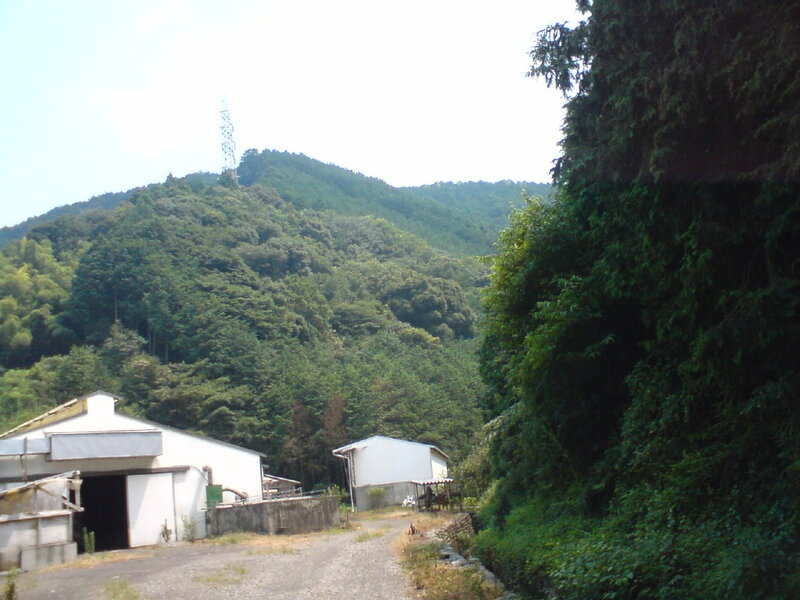 It is located very much in the middle of the nature with a beautiful mountain background. 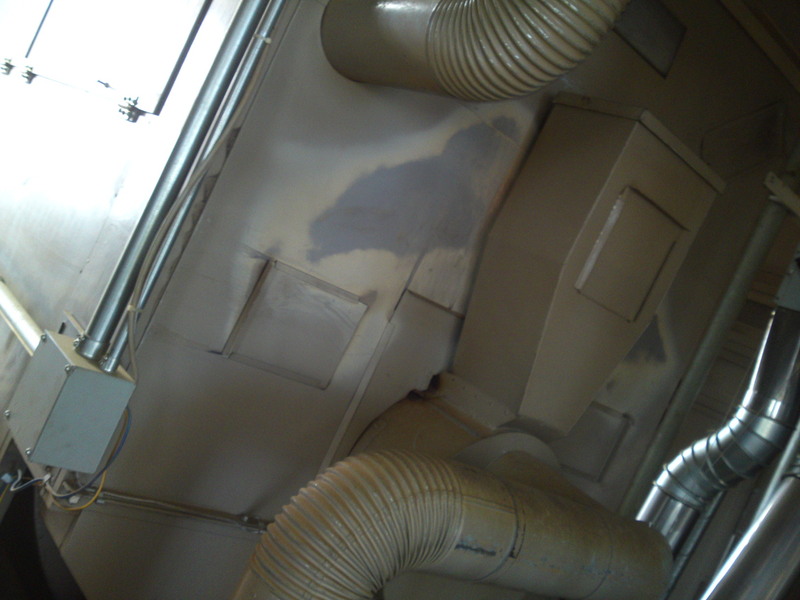 I was finally admitted inside, and knowing we were limited in time, I started firing questions. 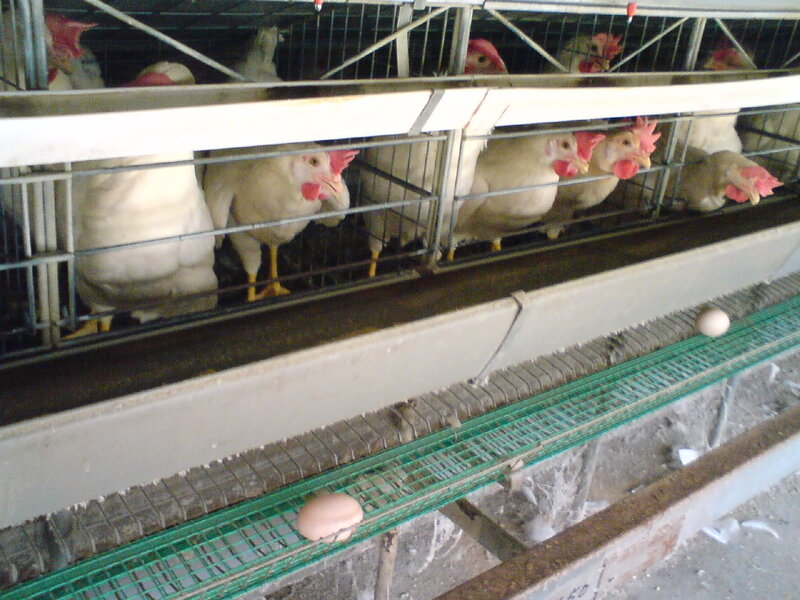 -When was the egg farm founded? -How long have you been actually working in the business? -Let’s see. I’m 57. I started at 25. 32 years! -When were you awarded a brand name for your eggs? -In 1996 (that was quick!). -How many hens (no cockerel needed whatsoever. I didn’t know!)? I had trouble keeping my hands off these beauties. -Then how many eggs do you produce a day? 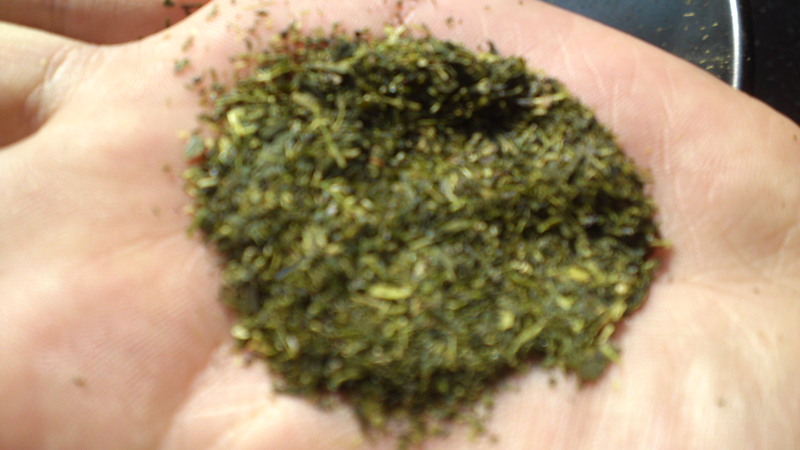 -About 1,200, but that’s little compared to industrial farms. 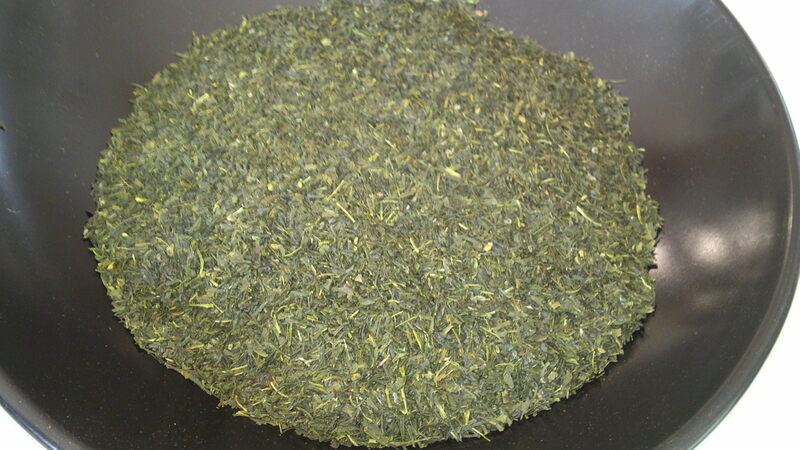 We strive for quality, not quantity (even so, that’ s a lot to me!). 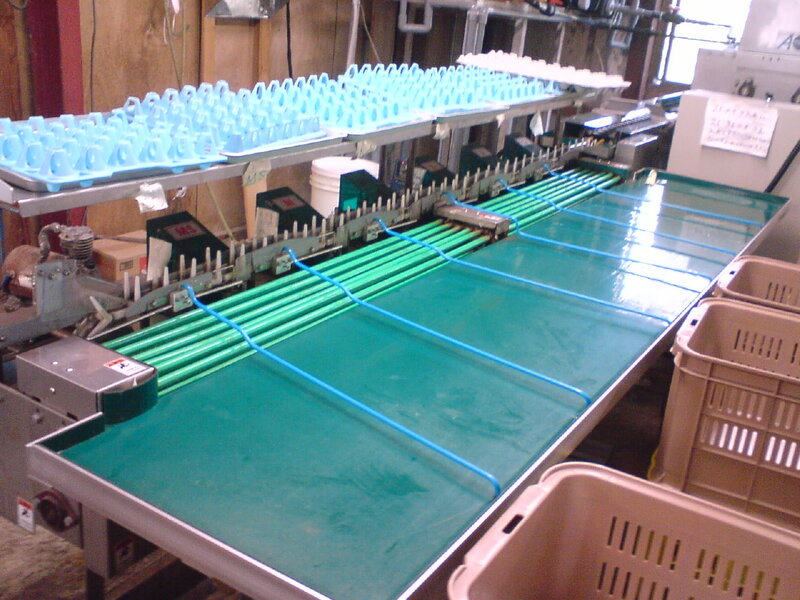 We expect each to produce between 280 and 300 eggs. -You need quite some staff, then? -We are 10 in all. 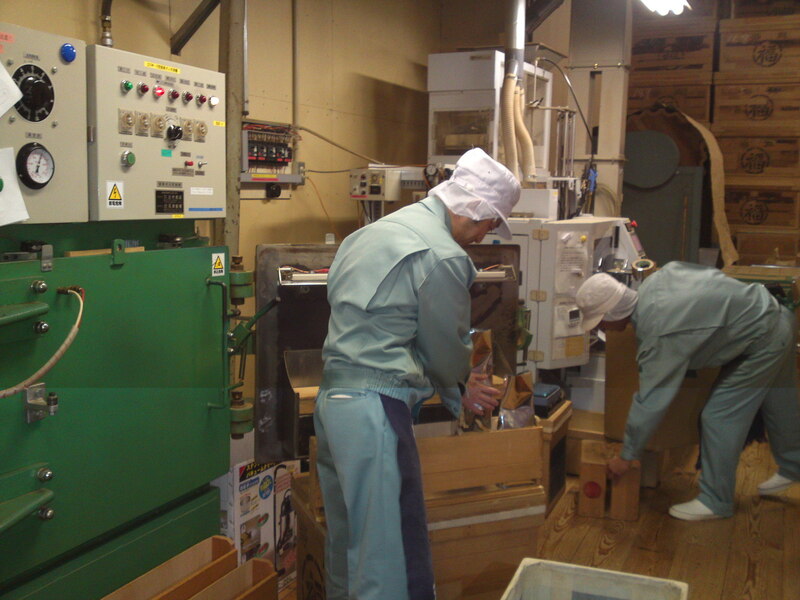 That’s enough, although we do have to work in shifts (that was said with a knowing smile, meaning Mr. Shimizu was working all day!). -How long lasts a working day, then? 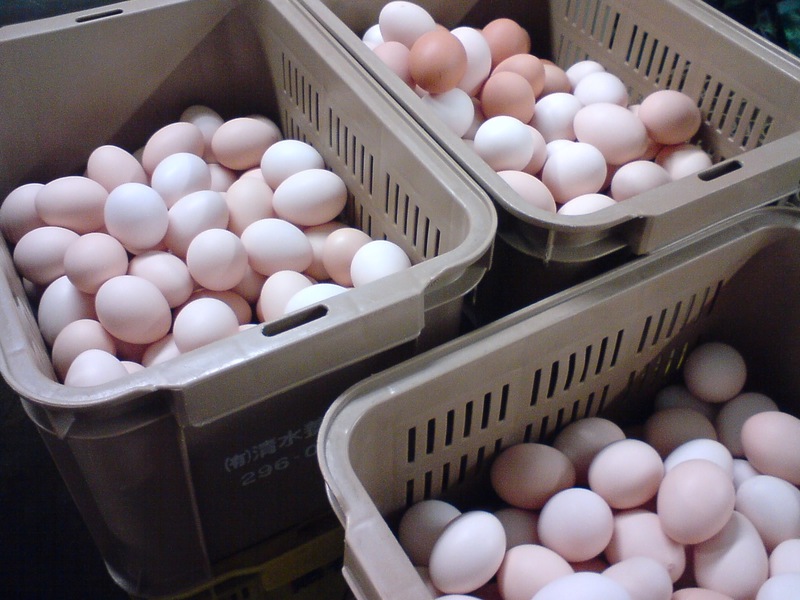 -How do you grade your eggs? -By size first, into 7 different sizes. The largest are reserved for cake-shops and restaurants. 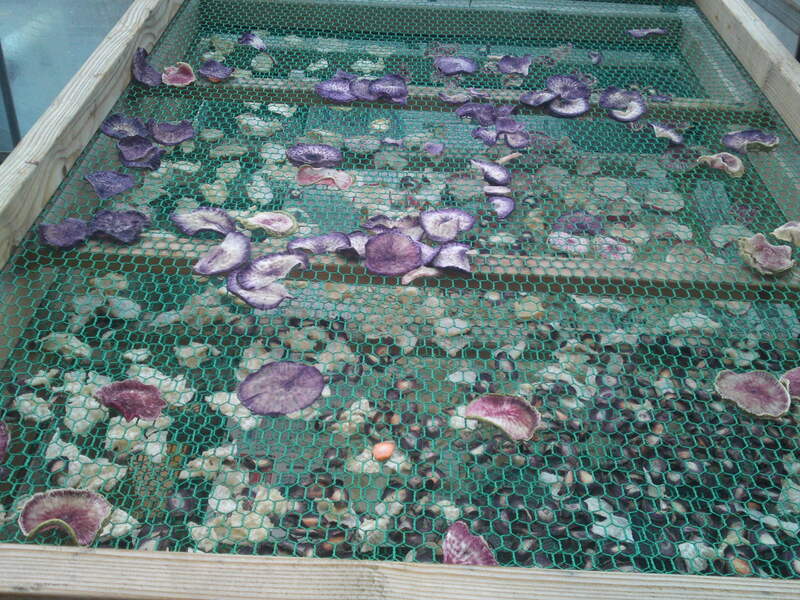 The shell quality has to be the same, and the only way to check it is by touch, sight and experience. -How many kinds of hens do you breed? -Two only, Sakura and Momiji. It is enough since we strive for only one kind of yolk, whatever the color of the shell. -That is a lot of hens, still. How long is their life span? The hens must naturally stay healthy. 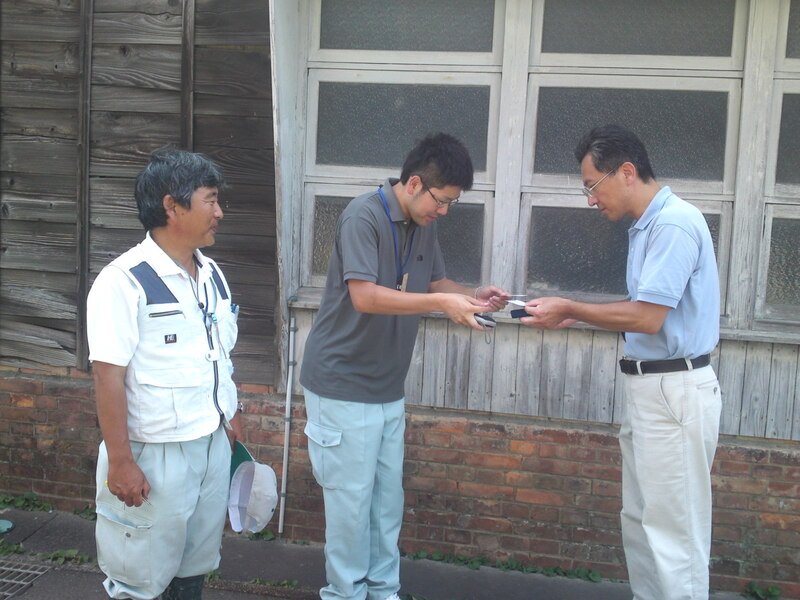 We personally check them everyday. 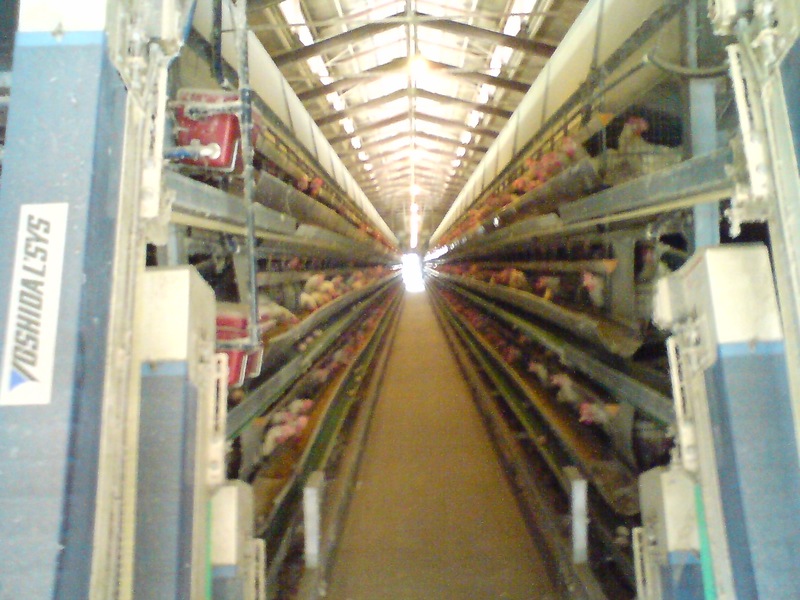 This is not an industrial farm where productivity is placed above the animals’ comfort. They are actually penned in smaller numbers than usual. Interestingly enough, the hens were not nervous at all. 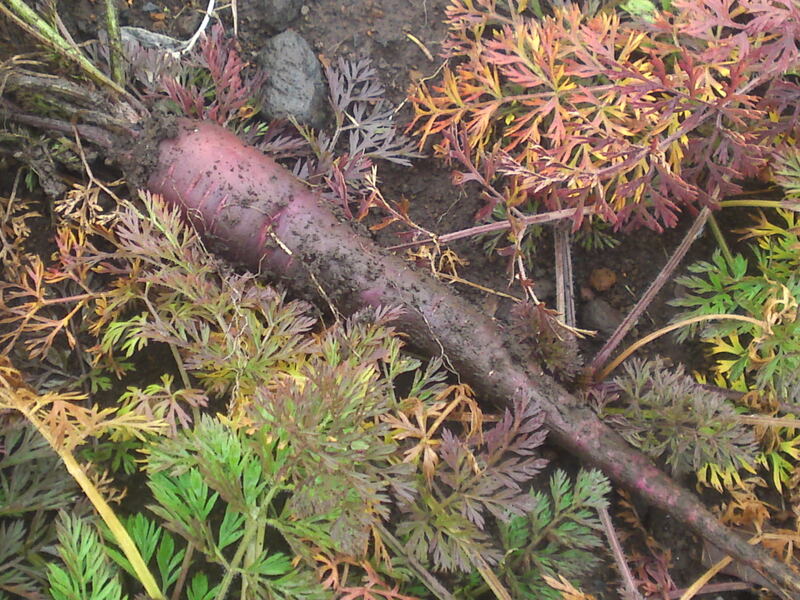 Their crests looked so healthy! 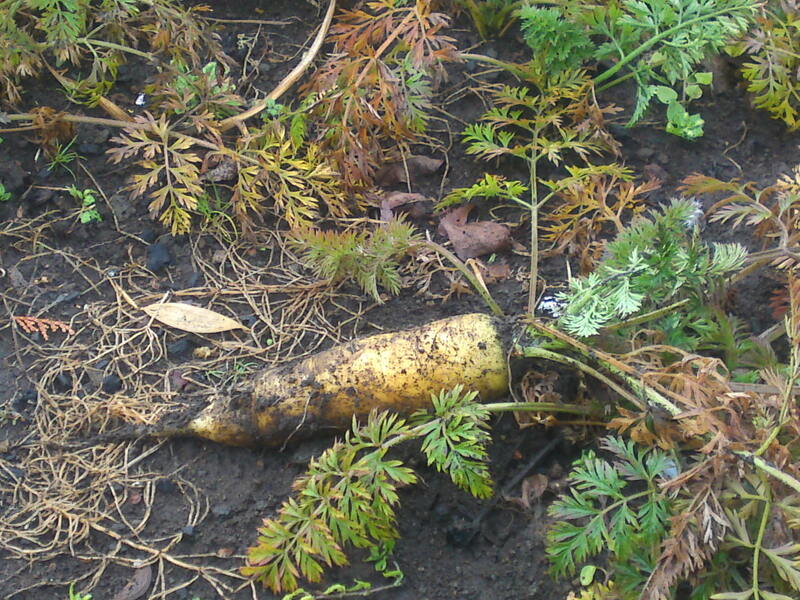 -How do you dispose of the droppings? 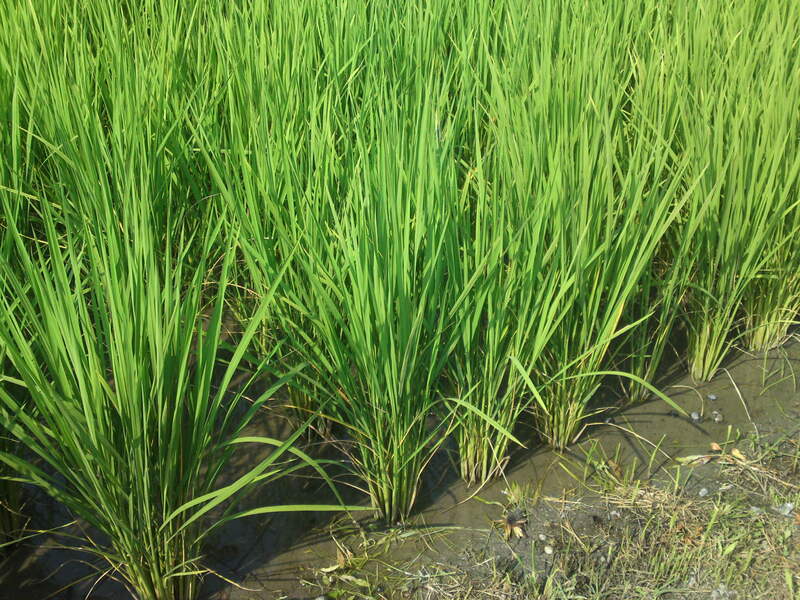 -Mixed with other ingredients, they will become fertilizer we sell to local farmers. -What about the hens which die on the way? 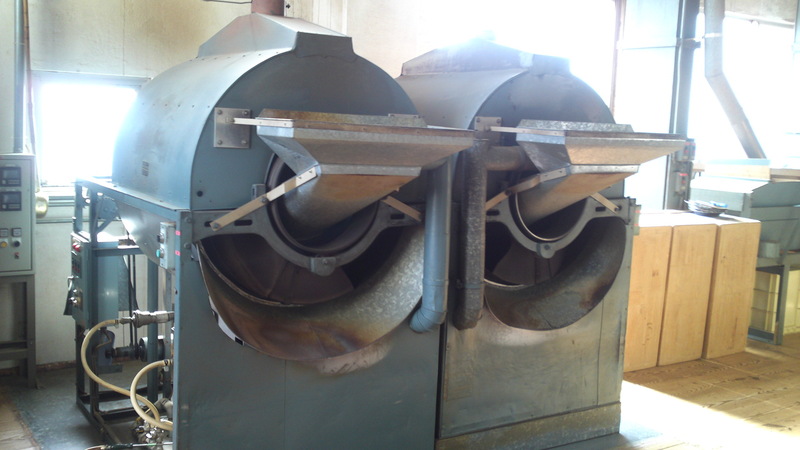 -We ask a specialized disposal company to take care of them. 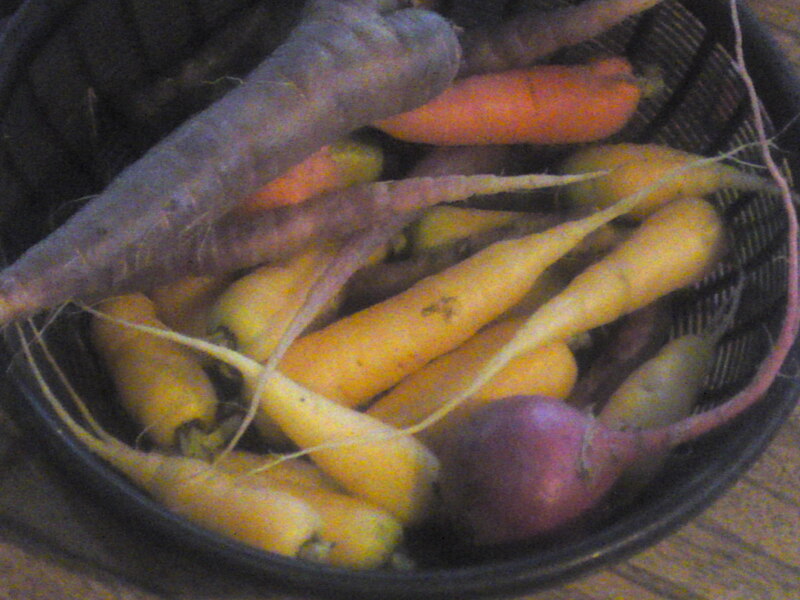 -What do you do with the hens after the year has elapsed? -We sell them to a specialized butcher. -That’s not much, isn’t it? -What kind of feed do you nourish them with? -A recipe of our own only. Mr. Shimizu handed me then a pamphlet with all the ingredients clearly stated. 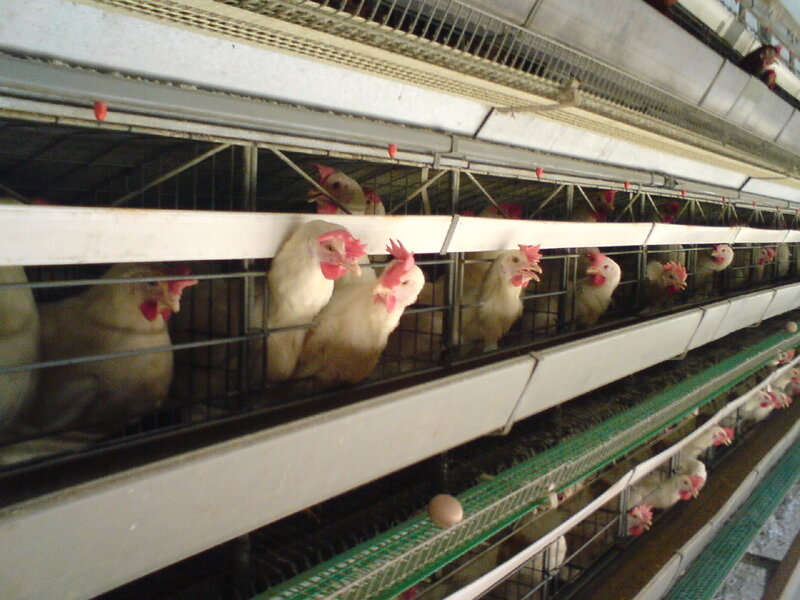 I counted no less than 22, 12 of them not found in industrial egg farms. Enumerating them would be fastidious but I have kept the pamphlet for your questions. It is certainly impressive! 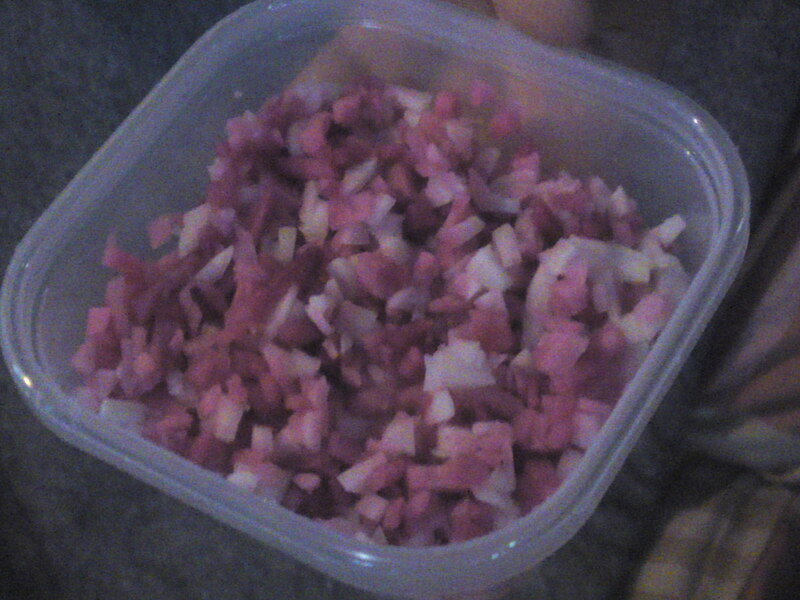 At least I can affirm that the corn used is not GM and that some ingredients include garlic and paprika! The egss! I came too late. They had already been collected! One thing is for sure: a soft shell wouldn’t take that shock. 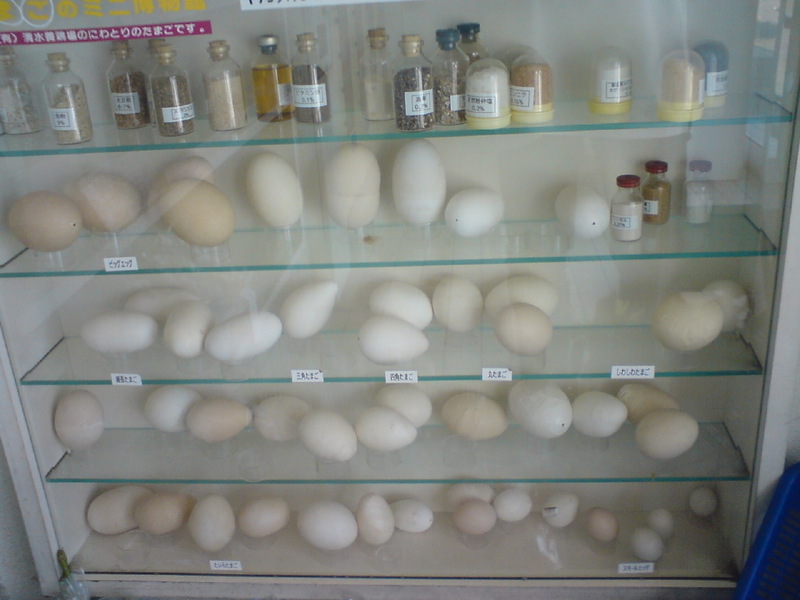 No wonder Mr. Shimizu’s eggs are so popular! 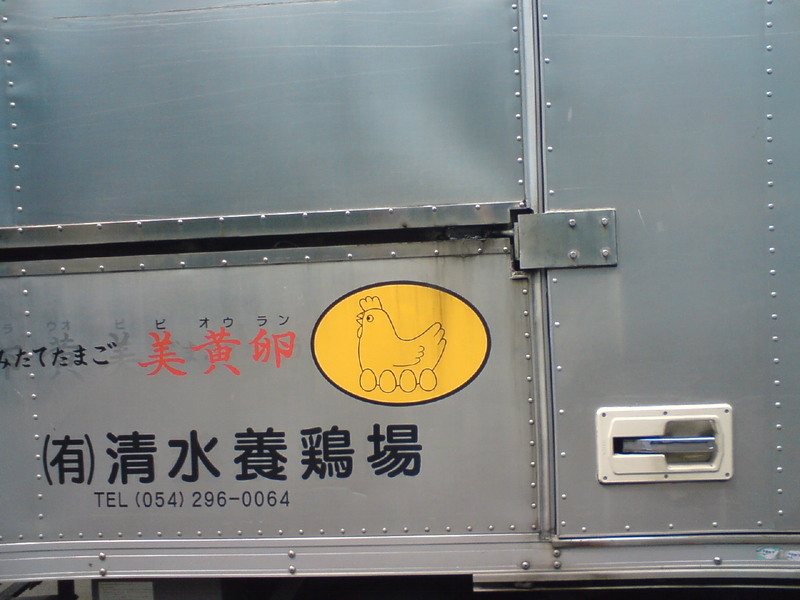 The eggs are transported in a cute van! 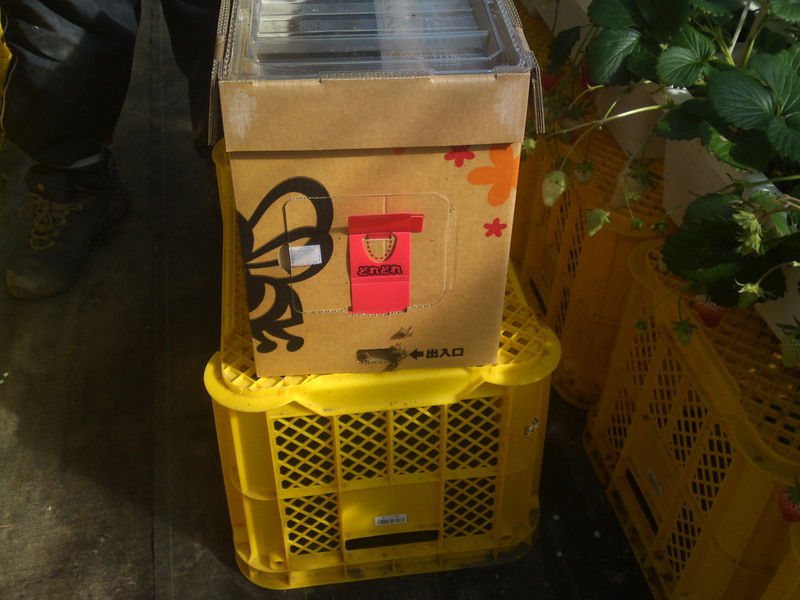 Mr. Shimizu delivers his eggs to no less than 21 main distributing shops and to no less than 40 restaurants and cake shops. I counted them, but I’m pretty sure they do not include special customers! 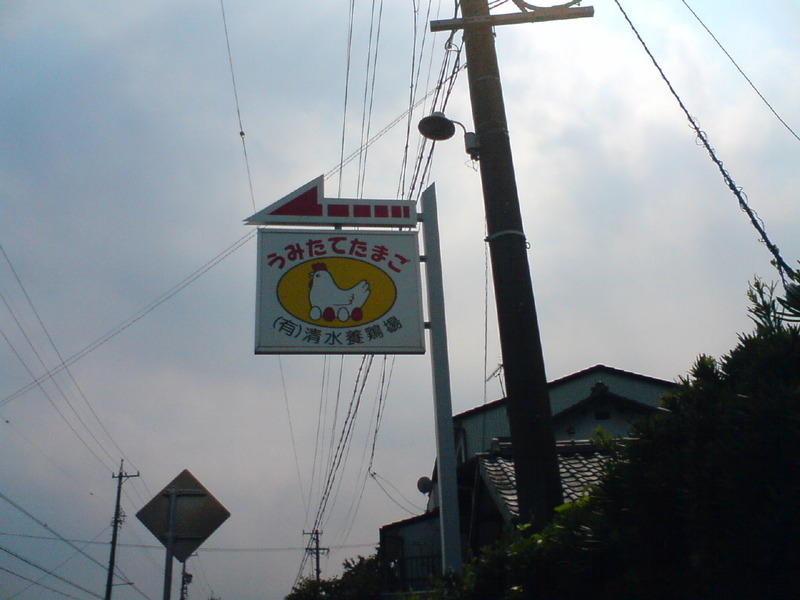 The sign to the original shop! Please remind me I have to buy some for the Missus’ tamagoyaki! Eggs do come in many shapes, don’t they? 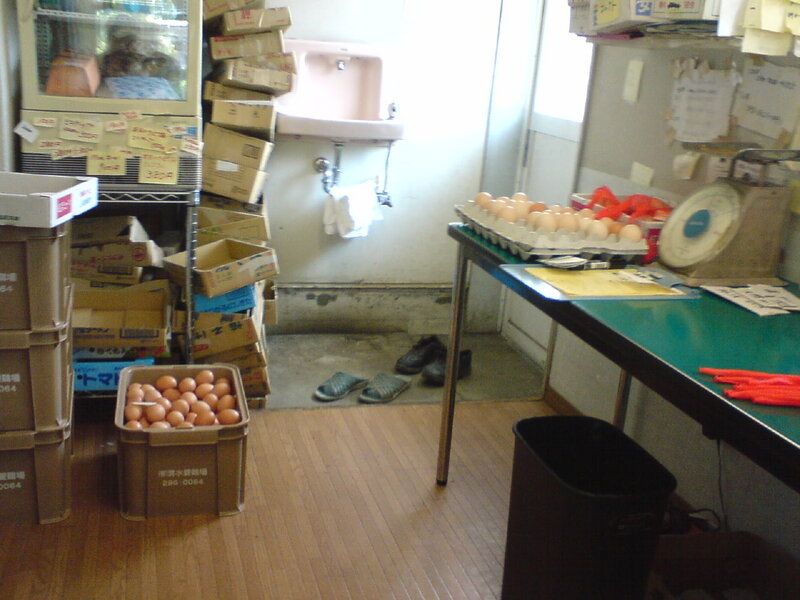 The Japanese have always eaten of lot of eggs. 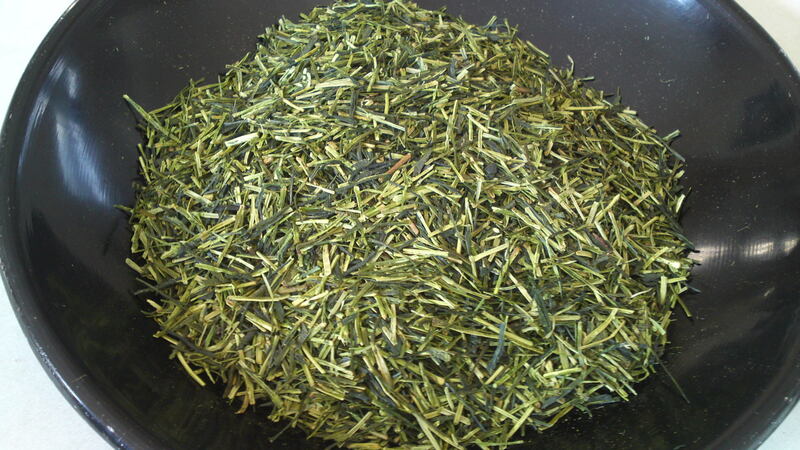 Not so long ago, in the Edo period,they were even considered as a rare delicacy. 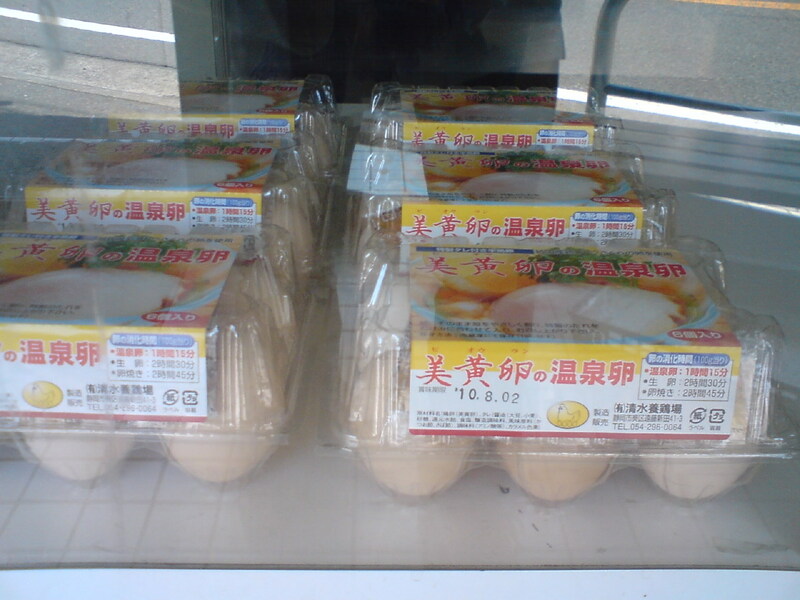 Since then, with the abundance of high quality eggs the Japanese have turned this supposedly simple farm product into many world-known delicacies: tamagoyaki, dateyaki, oyakodon, onsen tamago and so on. 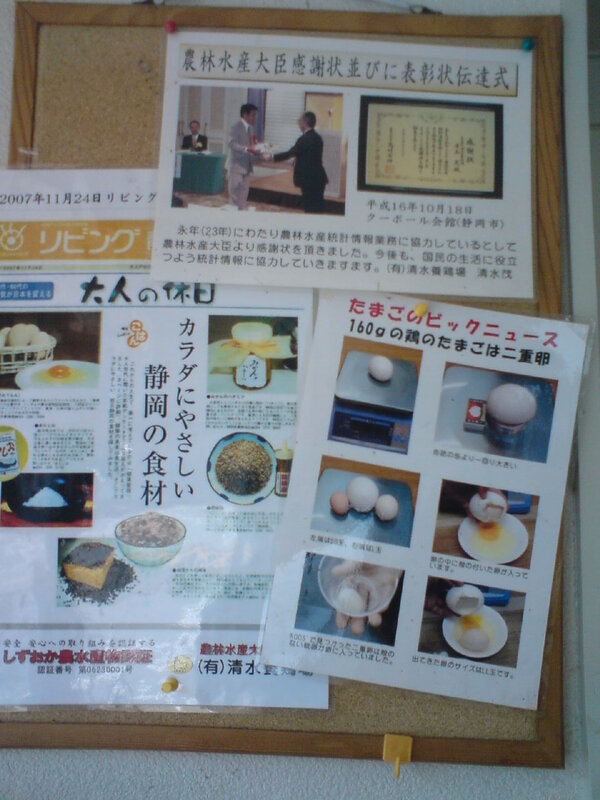 On the other hand the same Japanese have increasingly become more exigent and precise about their eggs, requesting for better shape, color and quality. 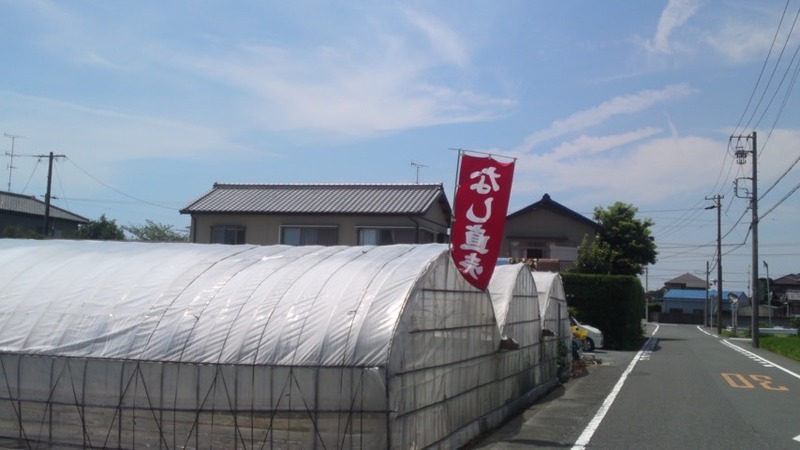 For a long time I have been intrigued by the above sign I regularly passed along during my bicycle trips to Miwa along the Abe River in Shizuoka City. 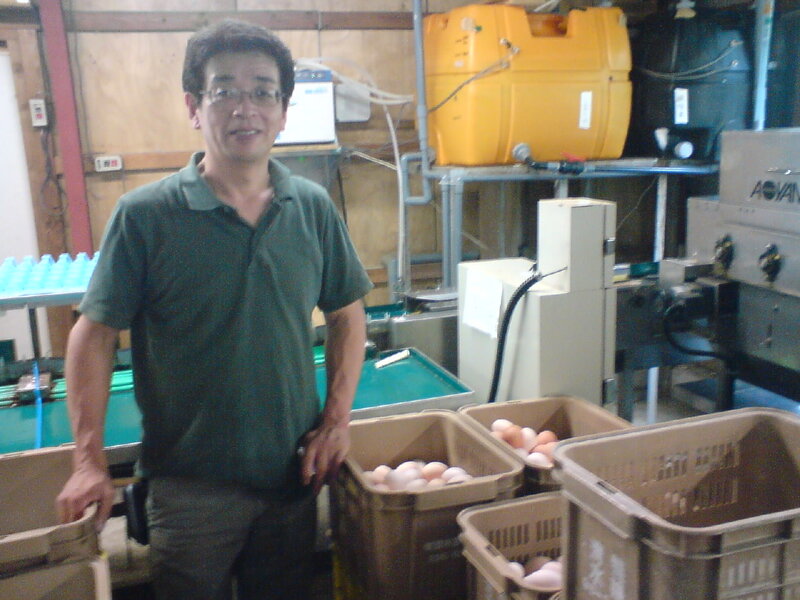 After some belated enquiries, I found out that the eggs produced by Bi-Ou-Ran/美黄卵/Beautiful Yellow Eggs Farm are not only top-class in this country, but that they have also been awarded a brand name/controlled appellation by the Japanese Government! An investigation was long due! 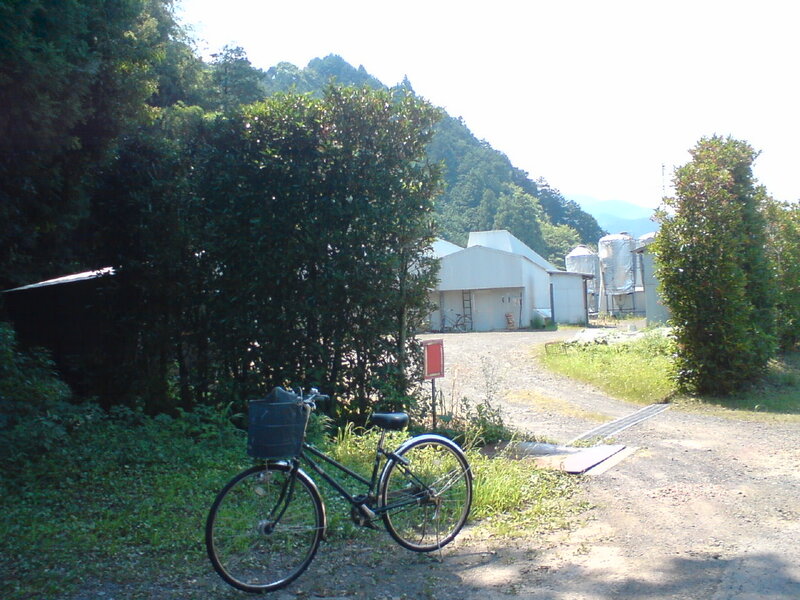 After lunch yesterday I took the bicycle and first rode to their small shop (a lot of their eggs are directly distributed all over the country from their farm) up in Miwa (a good 30 minutes ride from my work place). A small shop it is, but interestingly enough you can buy eggs there through a vending machine almost all day long (that is until everything has disappeared in spite of being re-filled regularly). A look at the praise received in many neswpapers and TV interviews. 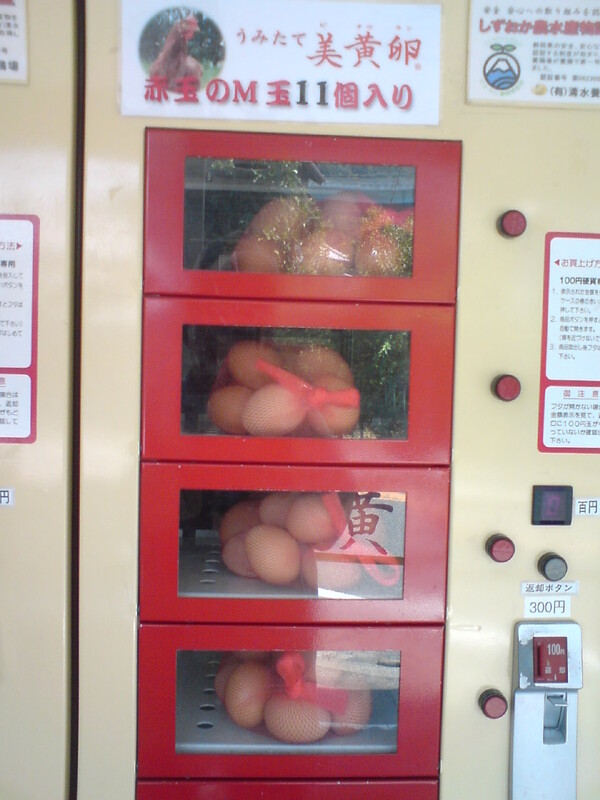 Beautiful eggs inside the vending machine! 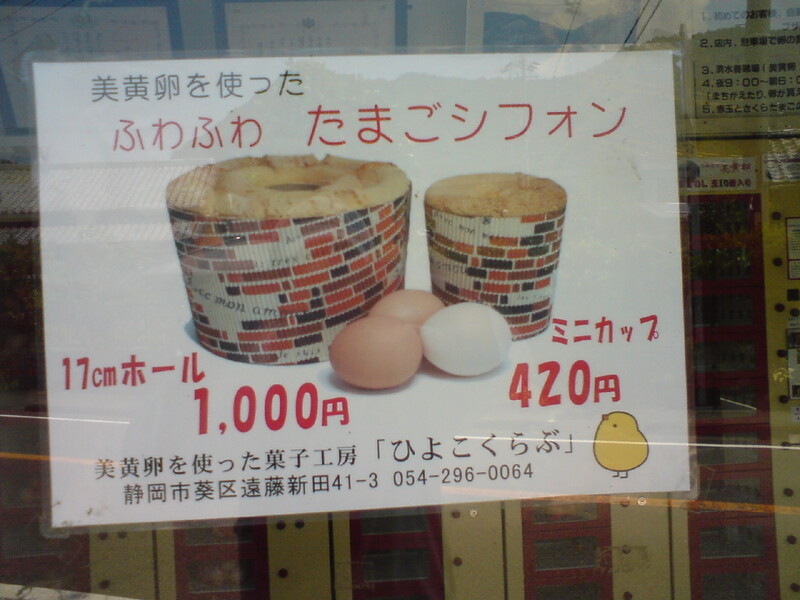 Onsen tamago: Eggs slowly cooked into running yolk soft-boiled eggs. A delicacy! Home-made chiffon cakes on sale! 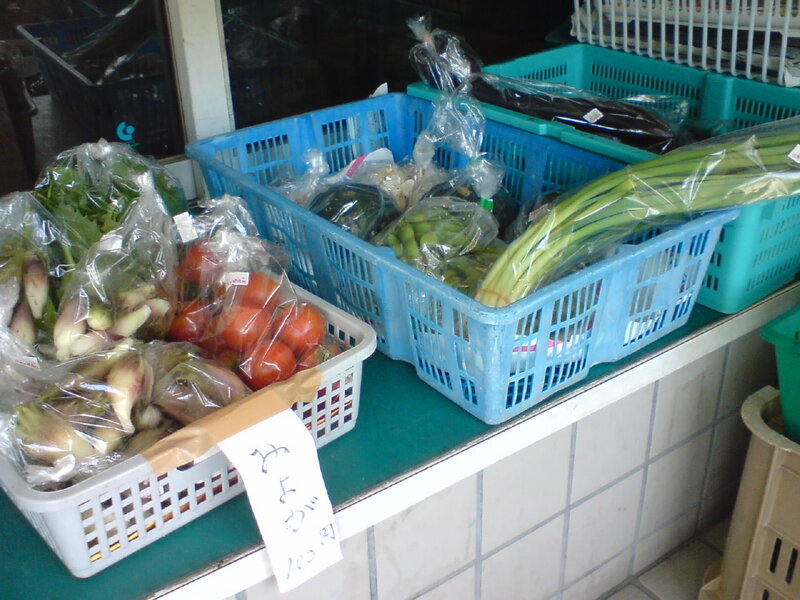 Very eclectic: they also sell fresh products from neighbors’ gardens! 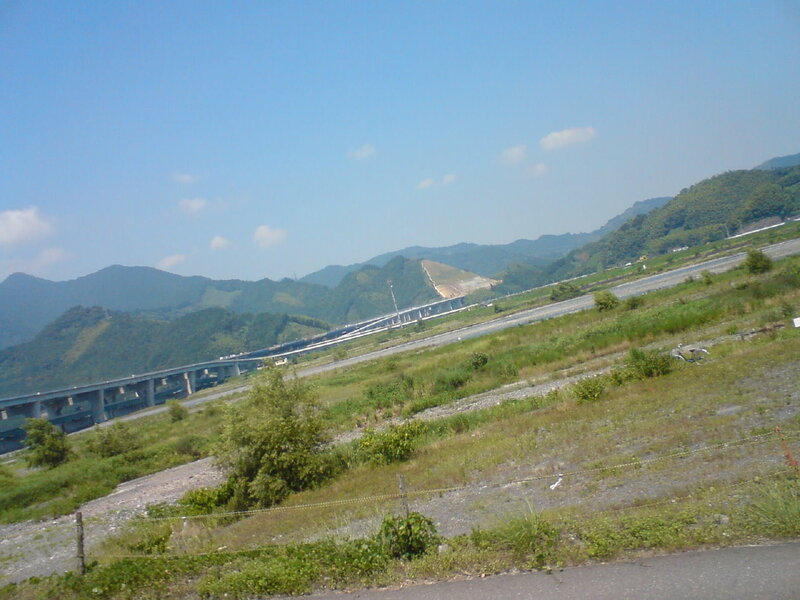 From the left bank of Abe River in Ashikubo District. People/employees at the shop were very kind. 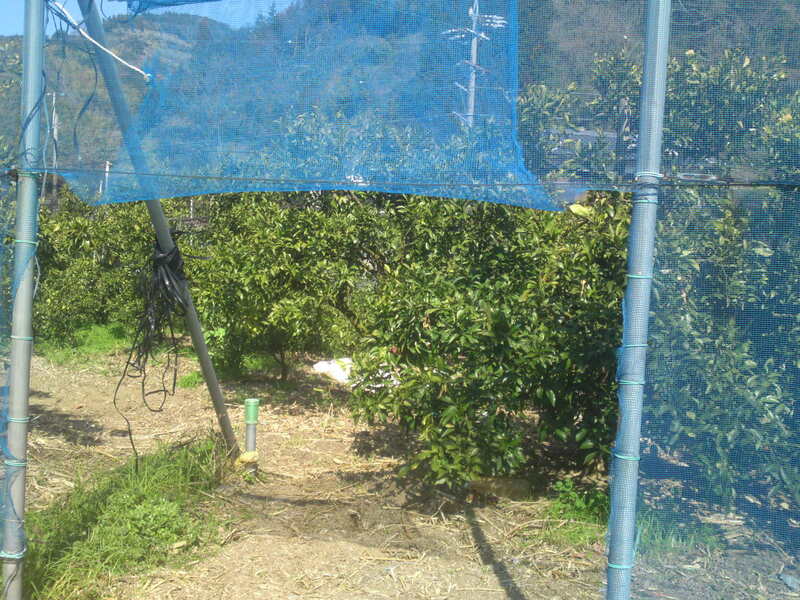 They put me through to the farm where Mr. Shimizu and employees are raising their chicken. Interviewing on that very day was not possible. Wrong time! They were busy at something I couldn’t catch on the phone. 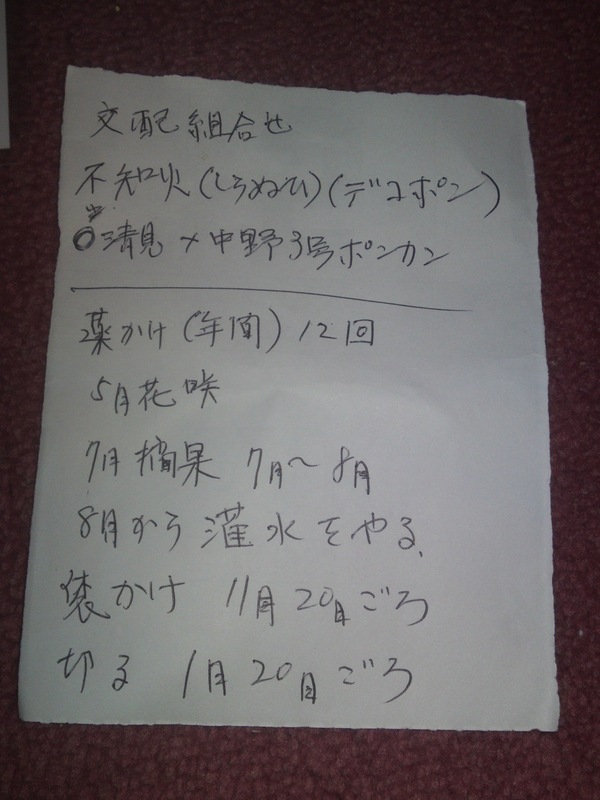 Nevertheless, Mr. Shimizu, who didn’t seem to understand much of what I was trying to tell me agreed on an interview at the farm tomorrow, Staurday, at 13:30! Their farm is still a 10 more minutes ride up river. Knowing myself and having some time on hand, I decided to find the farm as directions were a bit scant. 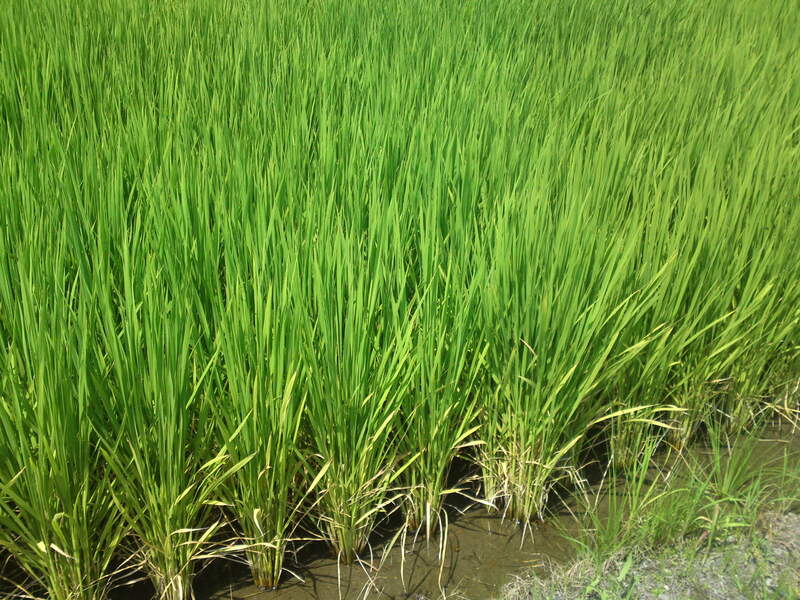 Even knowing the address is not much help in the country where almost nothing is indicated. 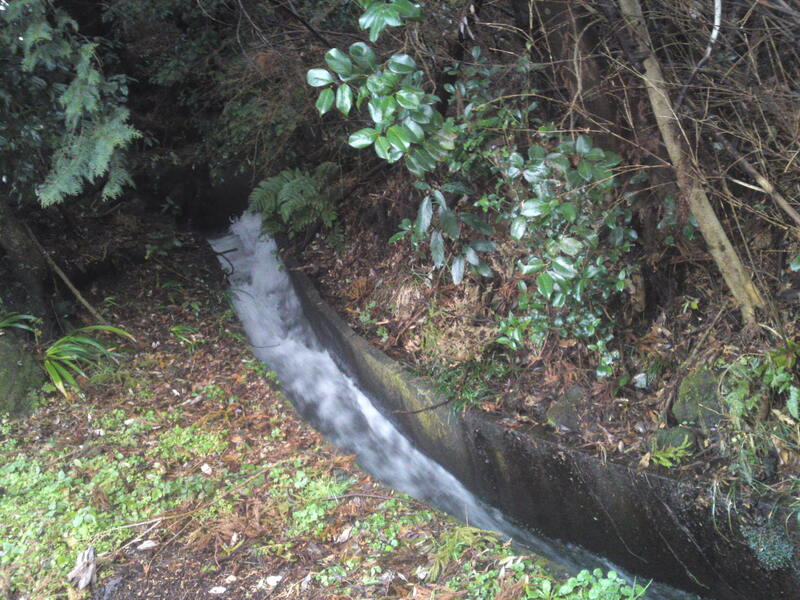 At least the Ashikubo River was easy to find. That did not prevent me from venturing onto the wrong bank of the river! But riding a bicycle has an enormous advantage: it does not matter how many times you get lost, you will eventually find your way around, whereas by car would tax any driver heavily! As I said I took the wrong (larger) road. 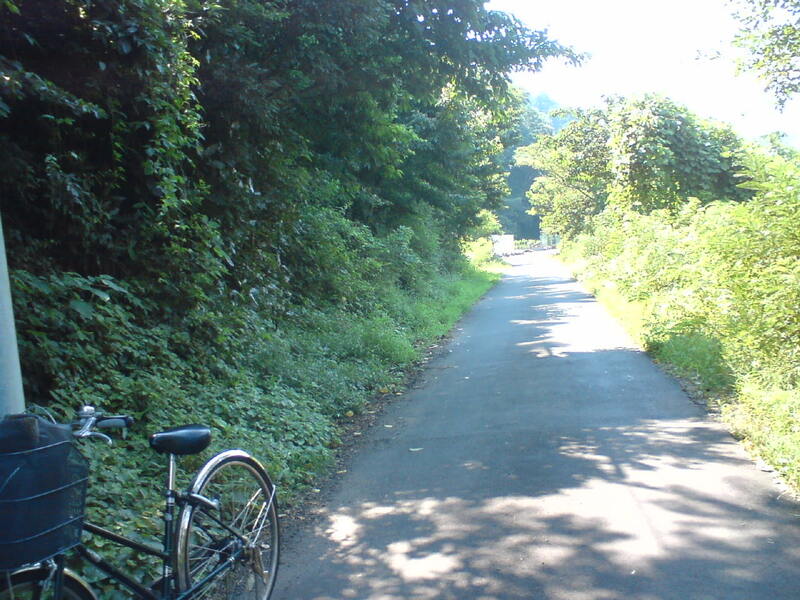 So I turned back and enetered th very narrow road along the left bank of Ashikubo River. 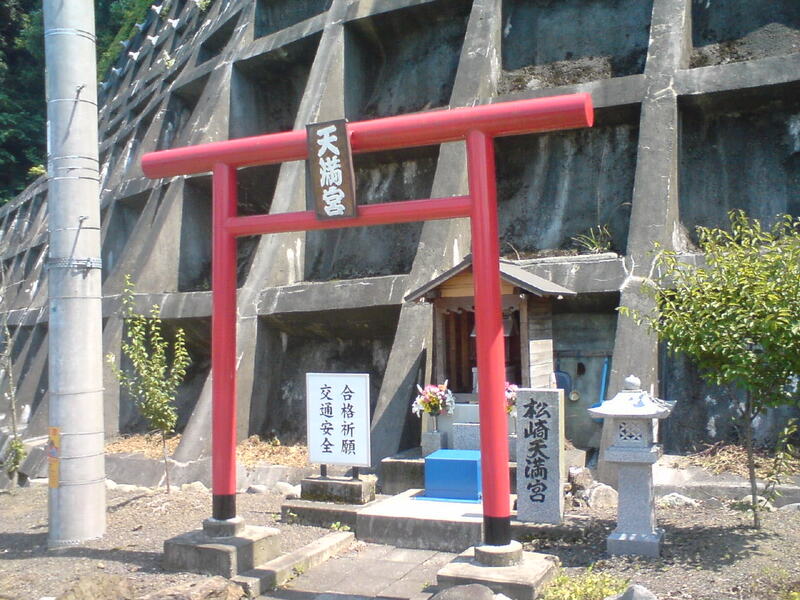 I can’t miss it on Saturday thanks to the little red Shinto Gate (Torii) at its entrance! 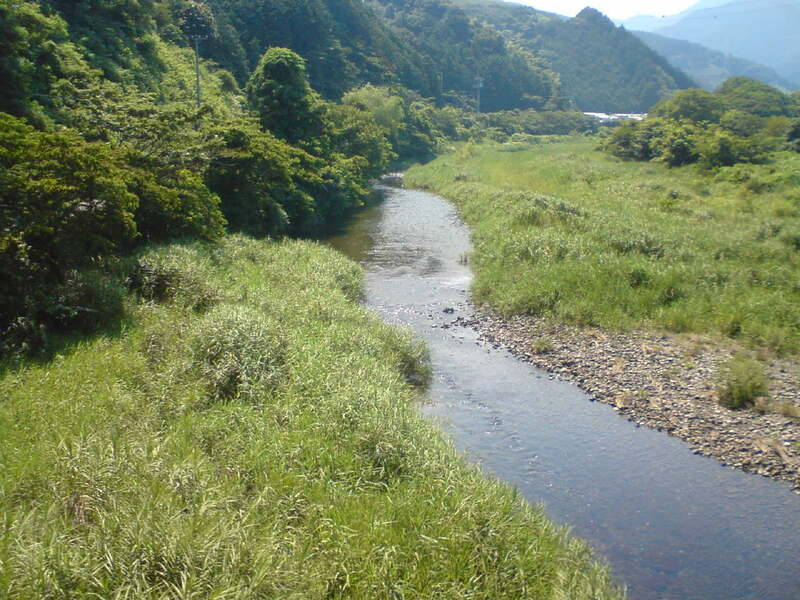 Neither wide nor long, the Ashikubo River is renown for for its great water coming down the nearby mountain slpes all year round. 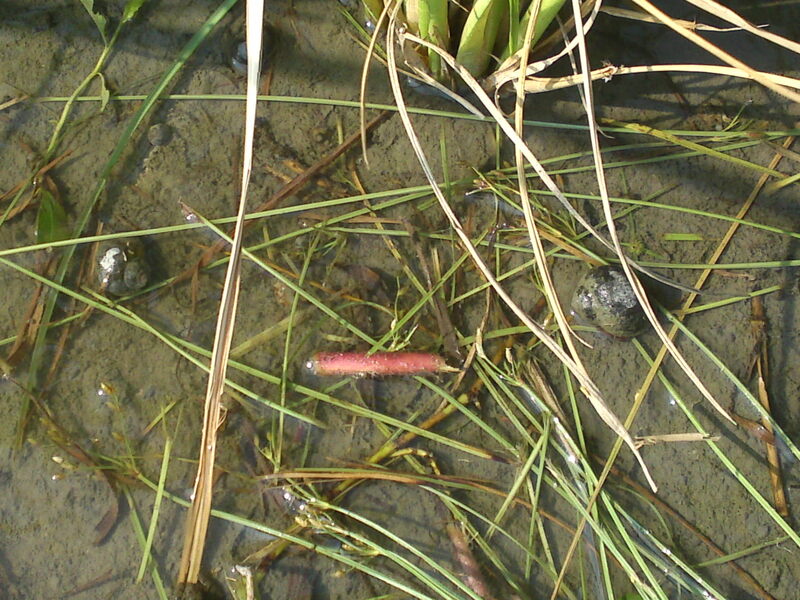 The Abe River might get completely dry, but not this little river. 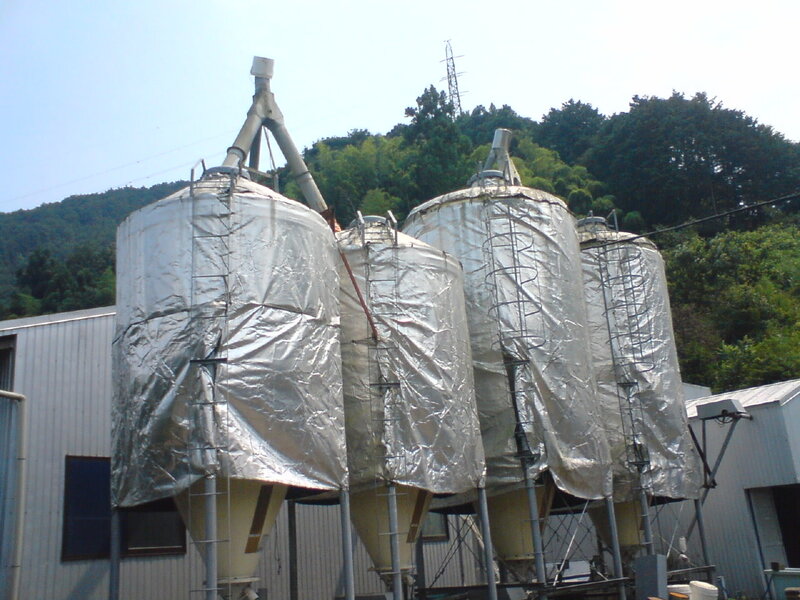 Even now, many local Sake Breweries come here to collect water in large tanks! No wonder that the farm has chosen this location. 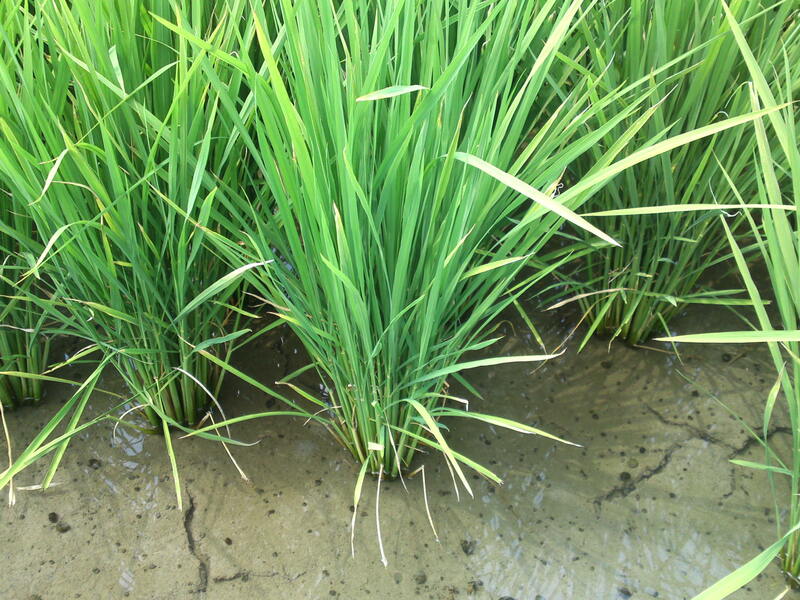 A constant supply of water ought to be vital! Still a long way to ride. Two cars would be in real difficulty if they happened to meet halfway. 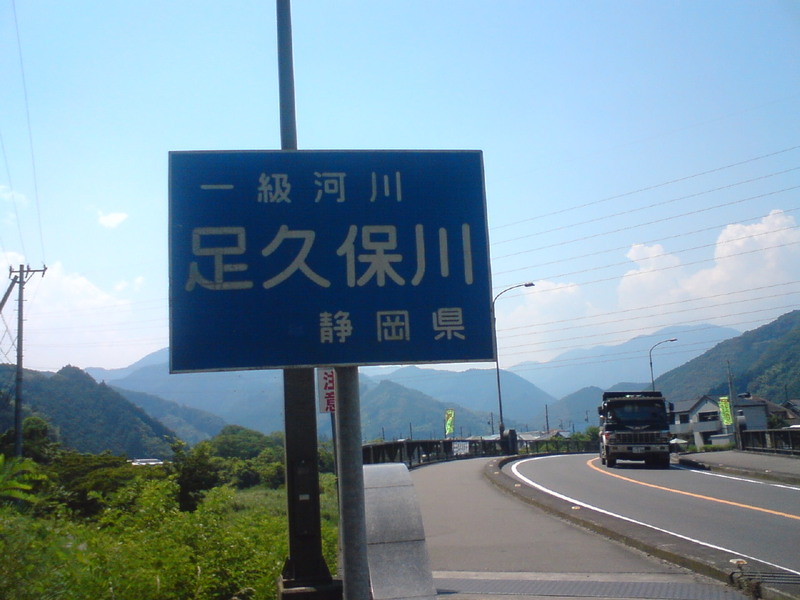 I finally reached my destination, although I didn’t know for sure at first! 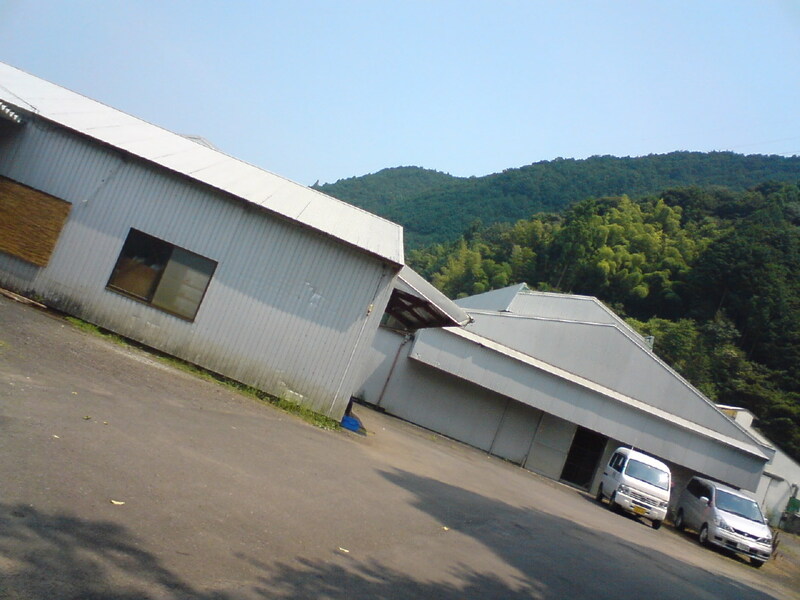 No sign at the entrance, and no clue of how such a farm should look like from the outside. But the fact I was born in farmland did help me as I noticed some silos obviously used to store feed. But I couldn’t see any bird in spite of the imposing size of the farming complex. Bear in imd I was in the middle of nature without a homestead within sight (that is on the left bank). 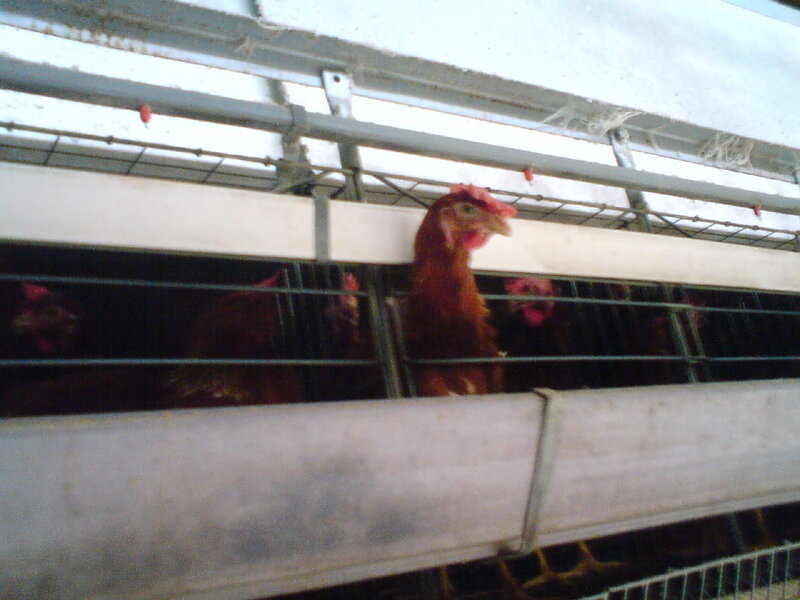 The heat was a scorching 35 degrees by then and I wondered how chicken scould be kept inside. 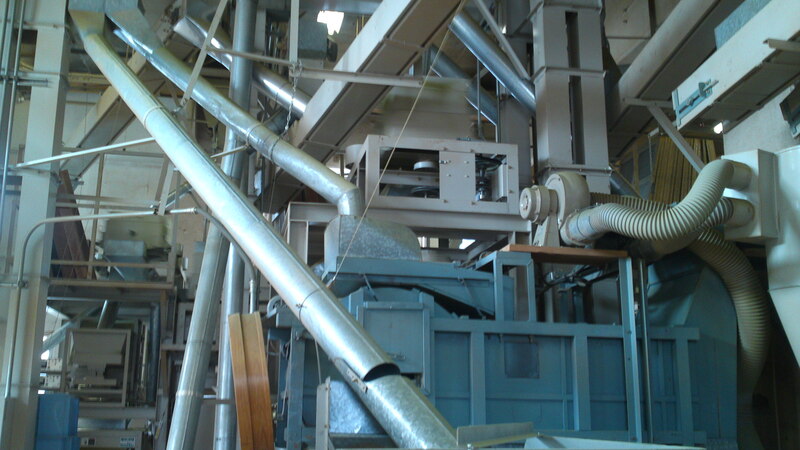 But,… I also noticed large ventilators here and there. I couldn’t be wrong (if I were I was in for a long frustrating search!)! 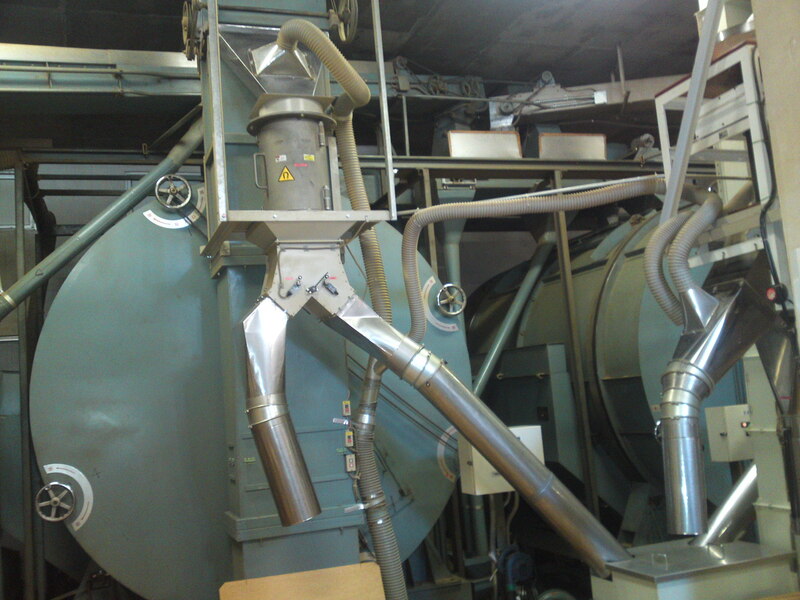 Since the appointment was not not for that particular day and knowing people working there were very busy, I rode a few seconds on until I found a side entrance,… and heard the unmistakable sound of chicken amid the roaring of the giant ventilators! I certainly felt relieved knowing it would be a faster ride thanks to my little investigation next Saturday! An employee did notice me and came to me without being asked to check if I was looking for something or somebody. I explained (after a polite greetings and taking off my shades) that I would come on Saturday and was just checking my way. 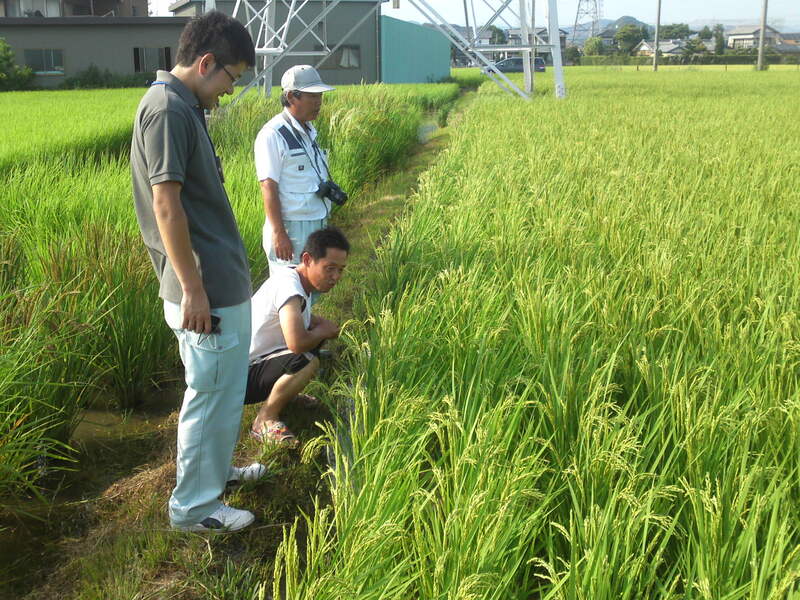 Shizen No Chikara Organic Farm: Visit by “47 Japanese Farms” in Shizuoka City! Ms. Roshni M. Nirody (from New Jersey) and Ms. Sara Harriger (Alaska) employed by the U.S. Department of State working for the Foreign Service Institute, Japanese language and Area Training Center at the U.S. Embassy in Japan paid us a visit in Shizuoka City! Not only these young ladies speak very good Japanese on top of their native language but even more languages, a undisputable proof of their ability for their jobs! 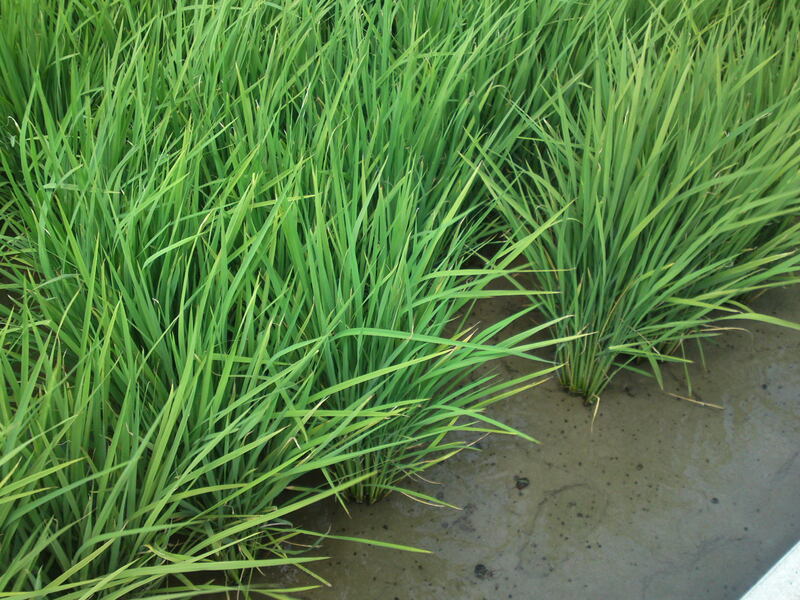 They have initiated their own grand three and a half year project at 47 Farms to examine Japanese agriculture through interviews and working farm stays with farmers in each of Japan`s 47 prefectural entities! Read more HERE, it is certainly worth a very long look! 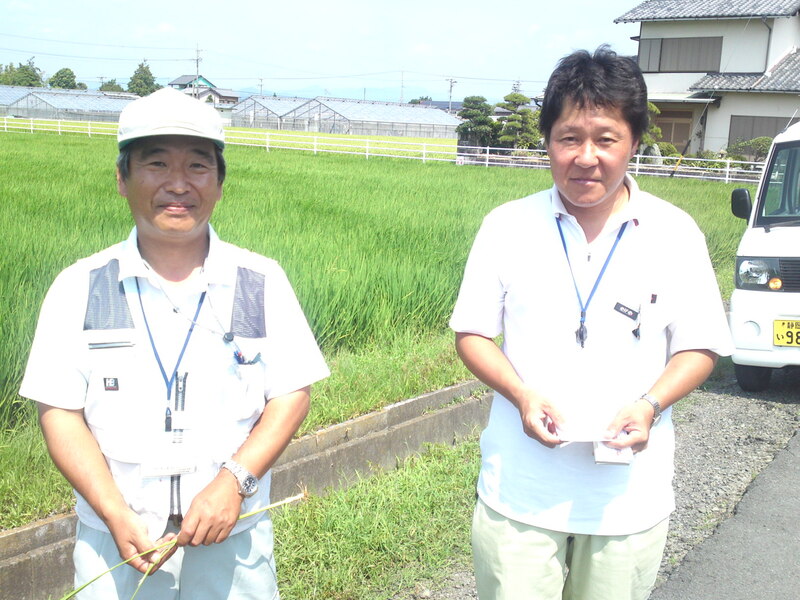 To cut a story short they contacted me as they wanted to discover what Shizuoka Farms had in store for them! 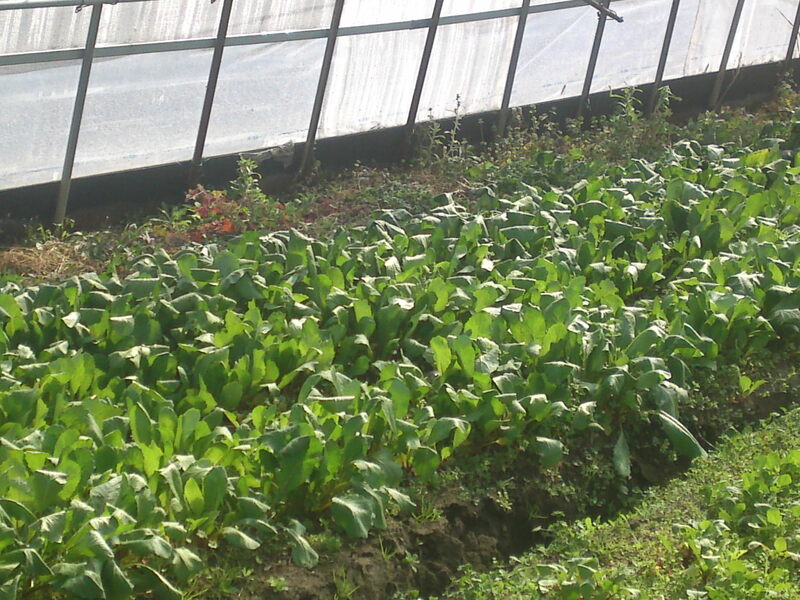 Actually Shizuoka does have a lot, but to make easier for their first visit I and a staff at M2 labo decided to take them to new but already very influential Organic Farm in Shizuoka City and Prefecture called Shizen No Chikara Farm. 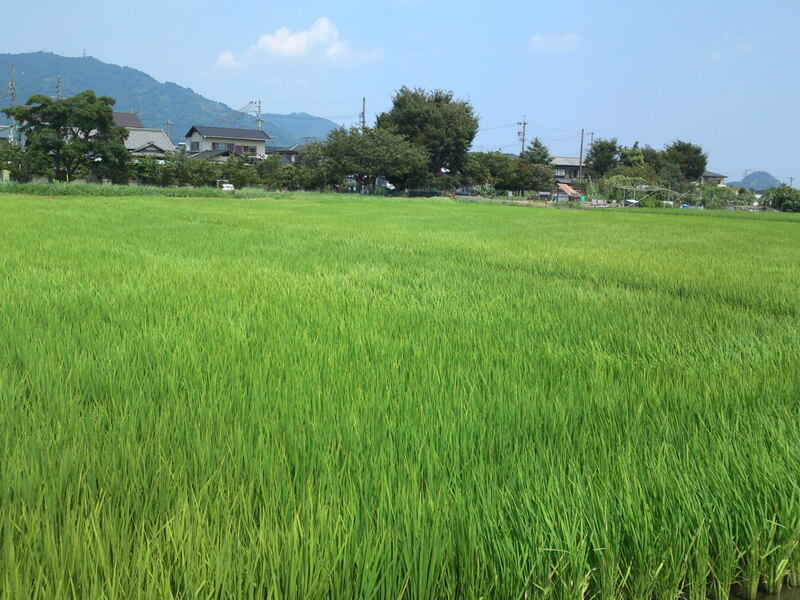 Shizen No Chikara Farm has plots in Sena, Shimo, Nippon Daira and many others in the Prefecture. 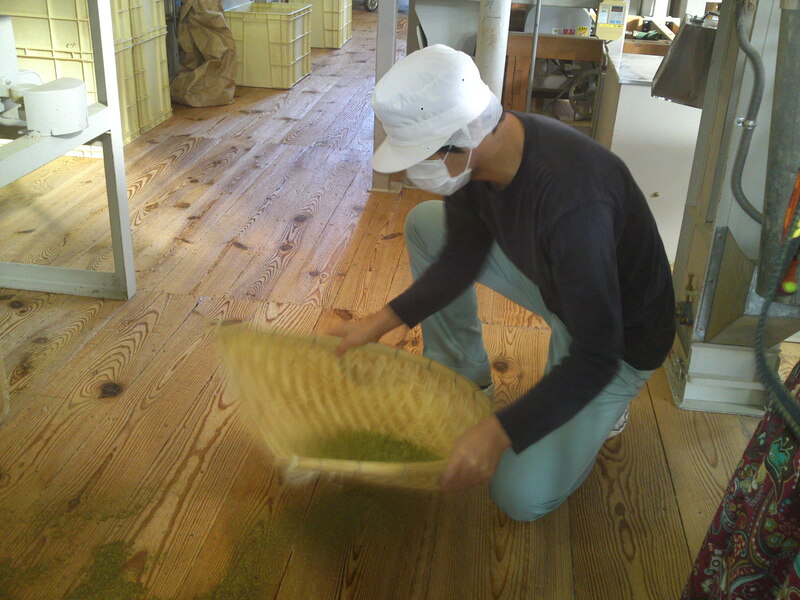 We took them to Sena where the man in charge, Syunsuke Sano/佐野俊介 was kind enough to explain his crafts and answer quite a few very pointed questions from our lady guests! 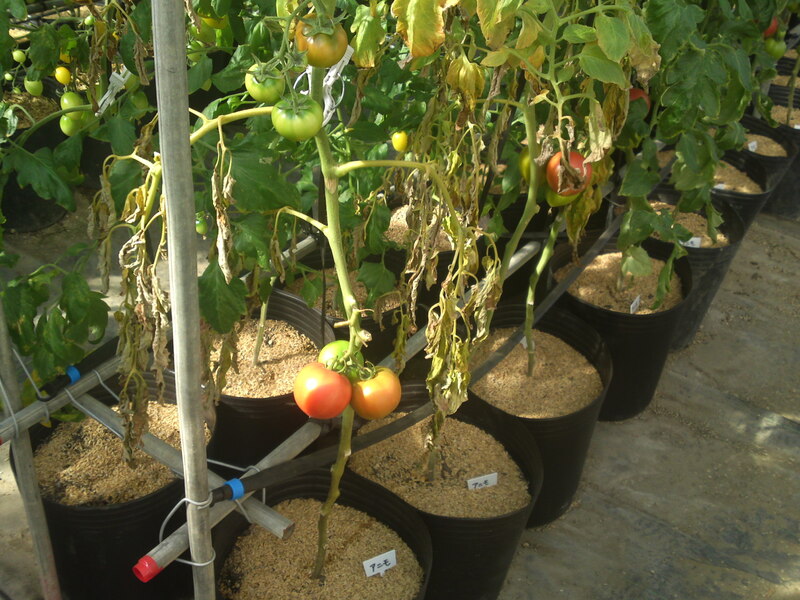 All the cultivation is organic in the strict sense with no insecticides, or any agrichemicals. The insects are fought off with natural repellents concocted by the farmers, catch fly sticky tapes or with natural enemies such as ladybugs! 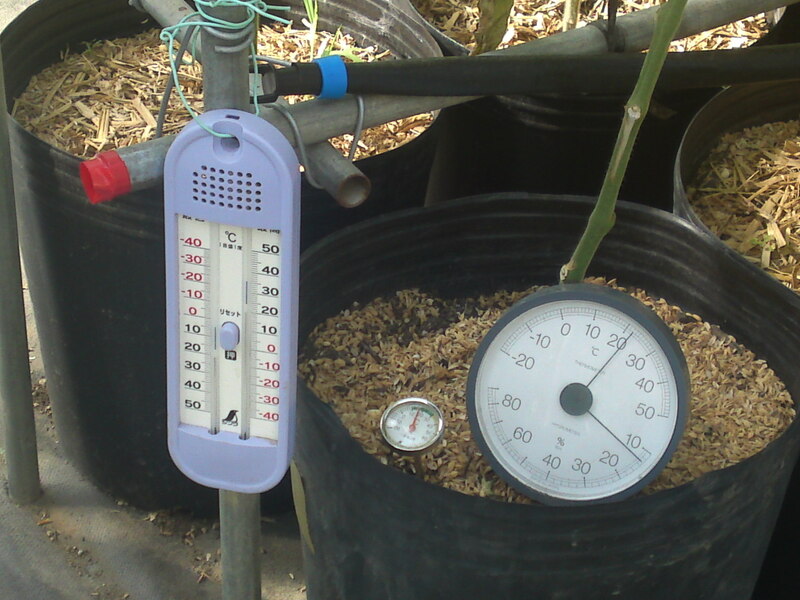 Temperature and humidity are constantly checked and monitored! 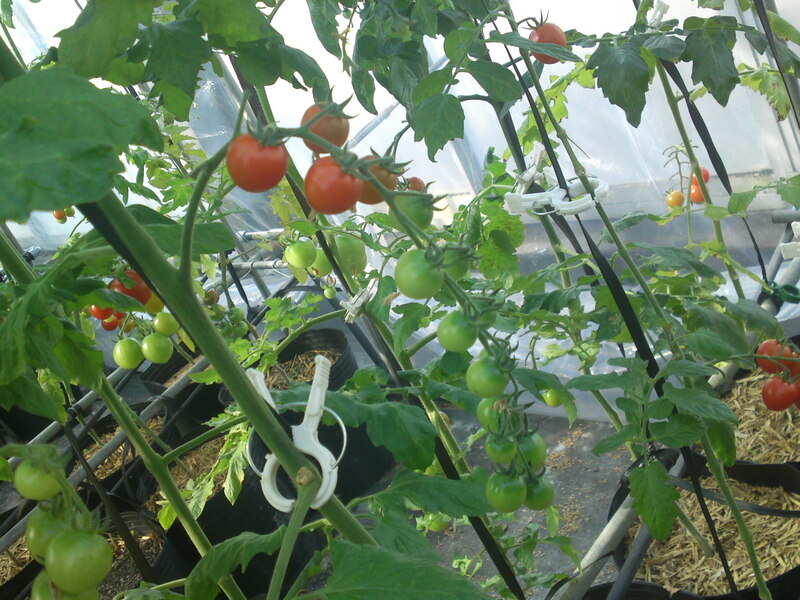 For the moment they grow five varieties of tomatoes there! 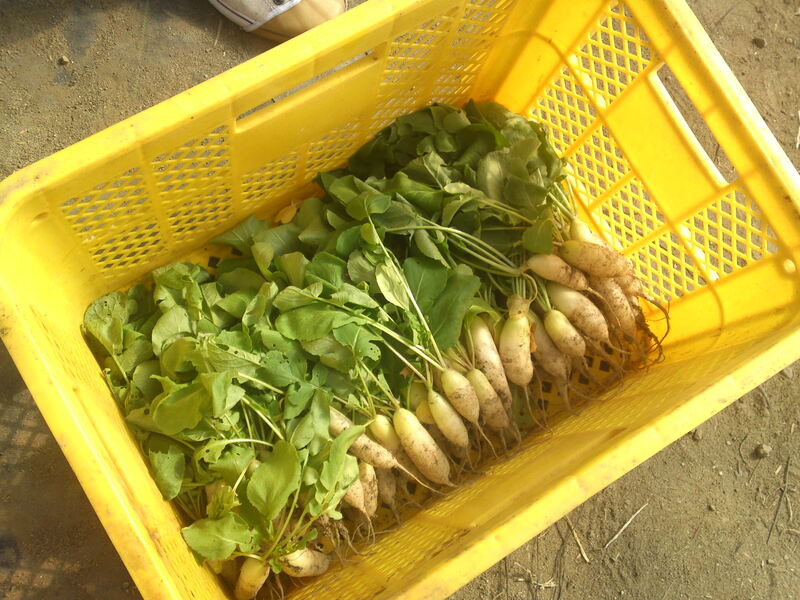 These will go to the top restaurants in the Prefecture! 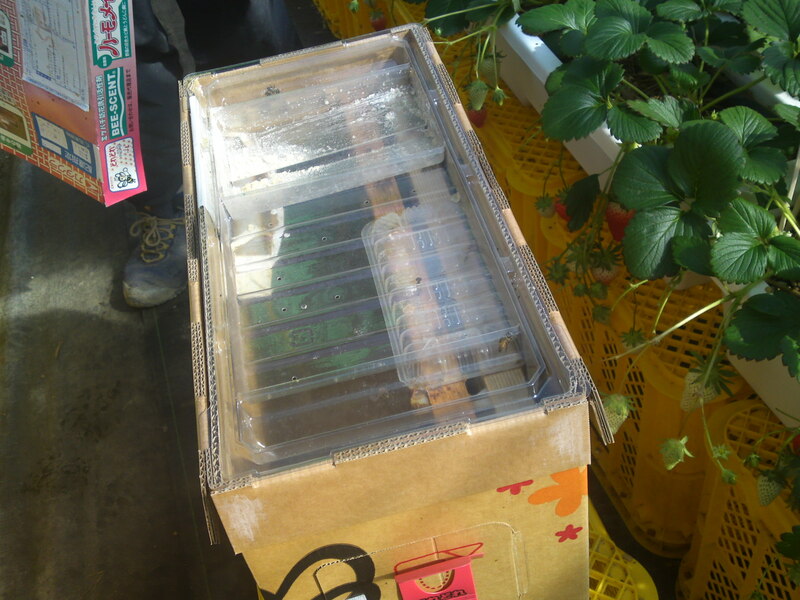 Now, Shizen No Chikara succeeded a very difficult organic cultivation at their first attempt: strawberries! 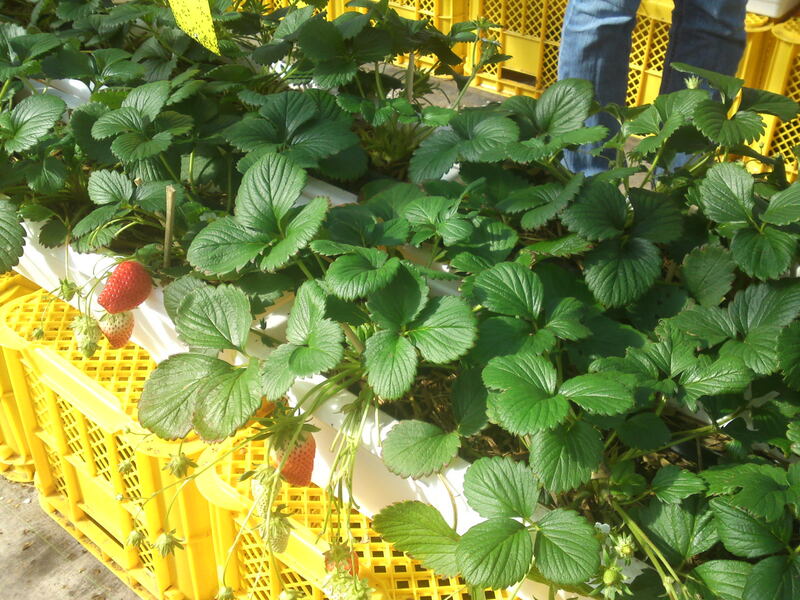 The strawberries are not allowed to come in contact with the floor or soil! No need to mention this is all daily back-breaking work! 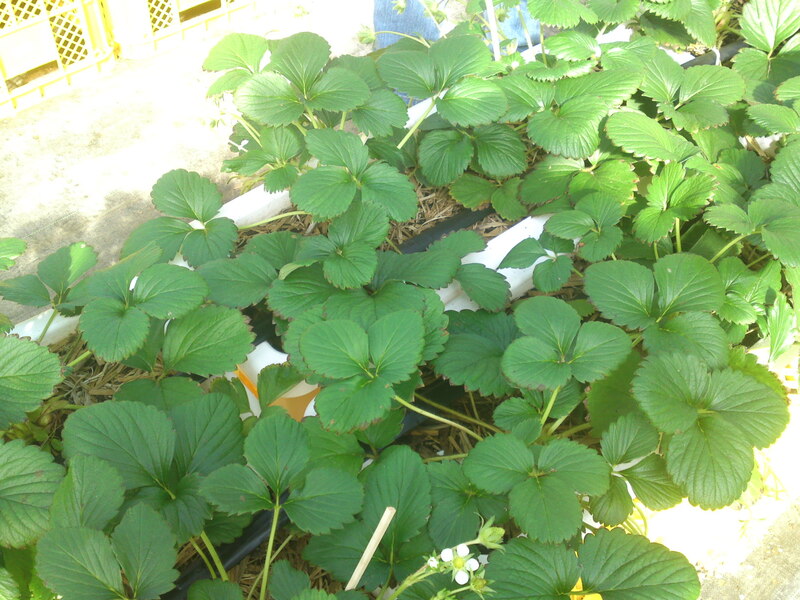 The greenhouse has its own beehive! 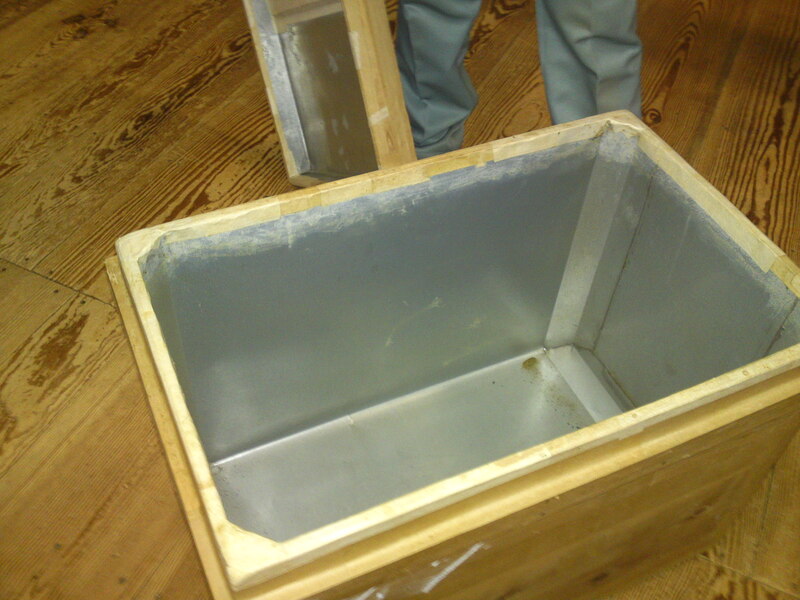 Even the beehive is kept super clean! The bees are vital for a regular pollination and beautiful berries! 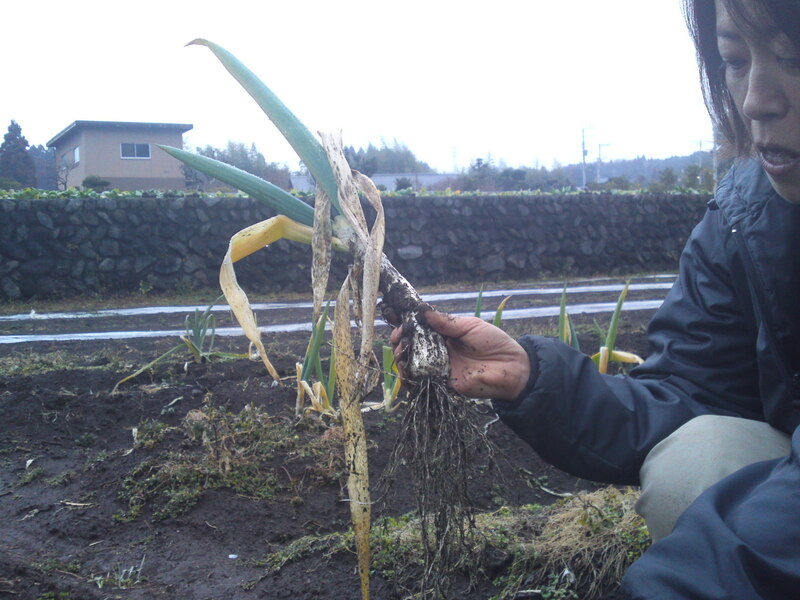 We then proceeded to the plot in Shimo to have a look at the their root and leaf vegetables! 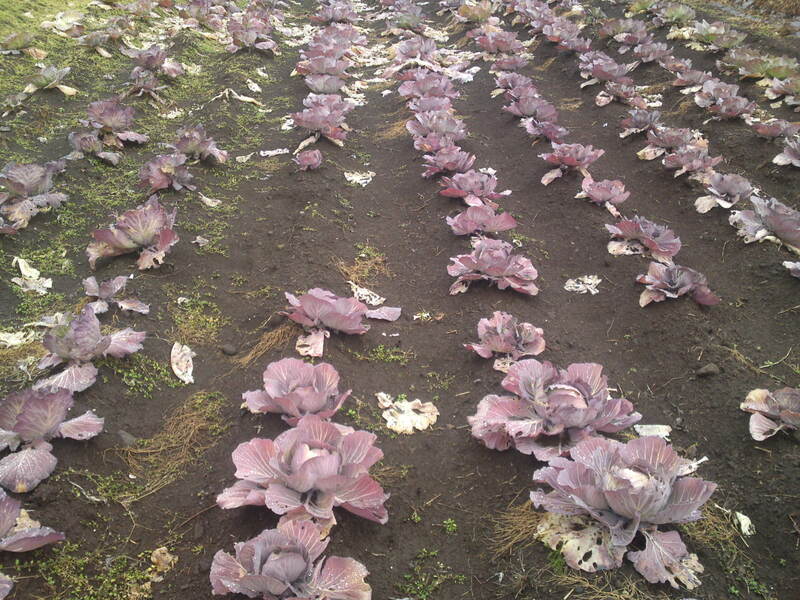 Komatsuna left to look after their harvested rows! Leeks are great to fight common colds! 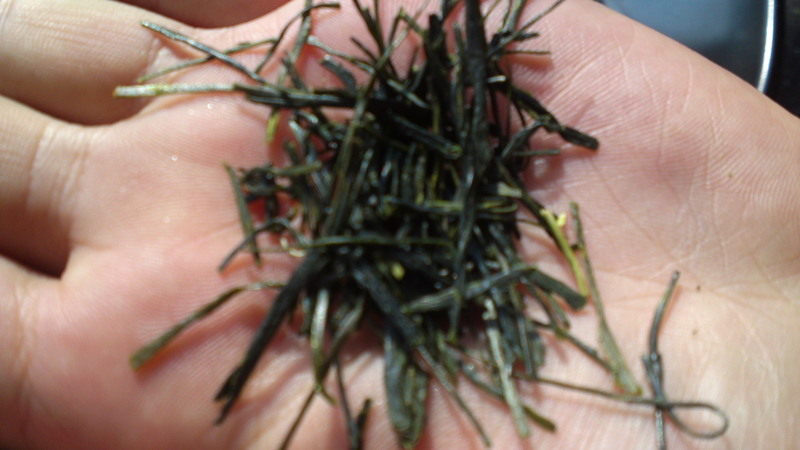 Japanese gastronomy wouldn’t exist without these! 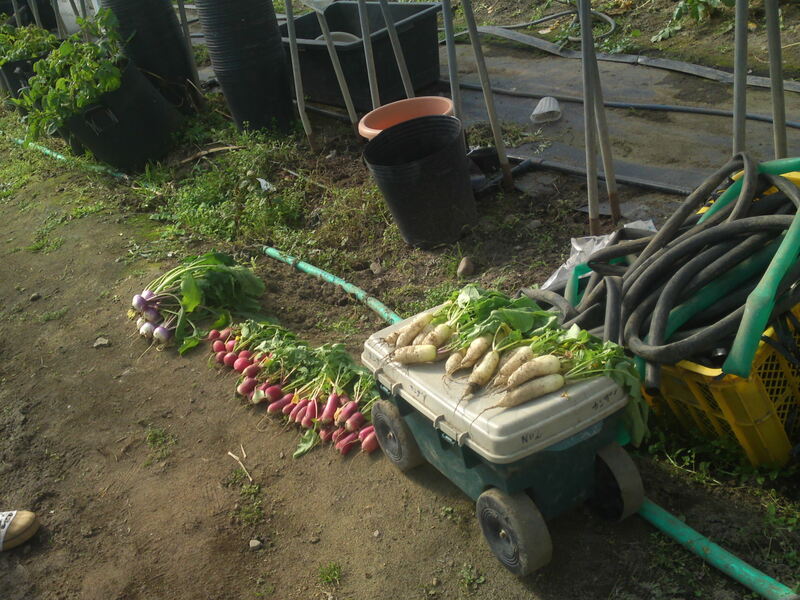 Beautiful radishes and turnips just harvested! 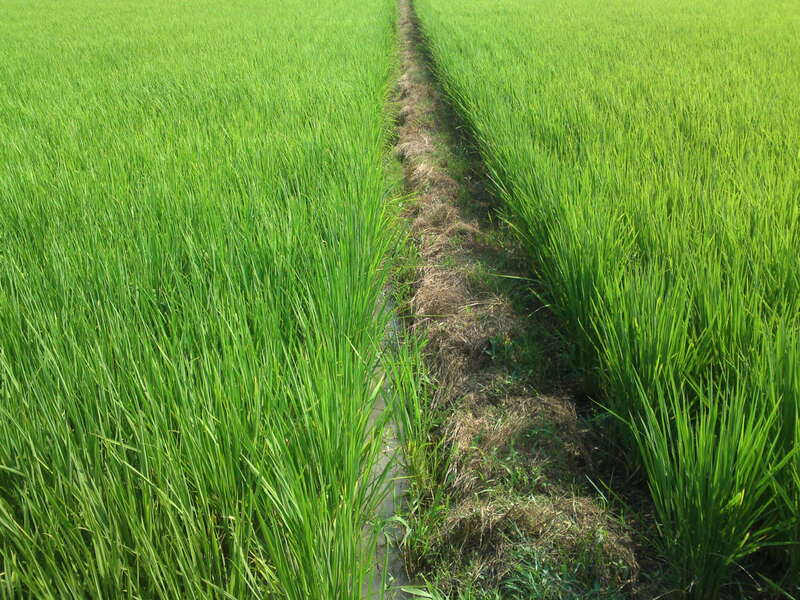 The same in their rows! This visit was all too short for my own satisfaction and I already have invited our sweet visitors to come again as soon as possible! 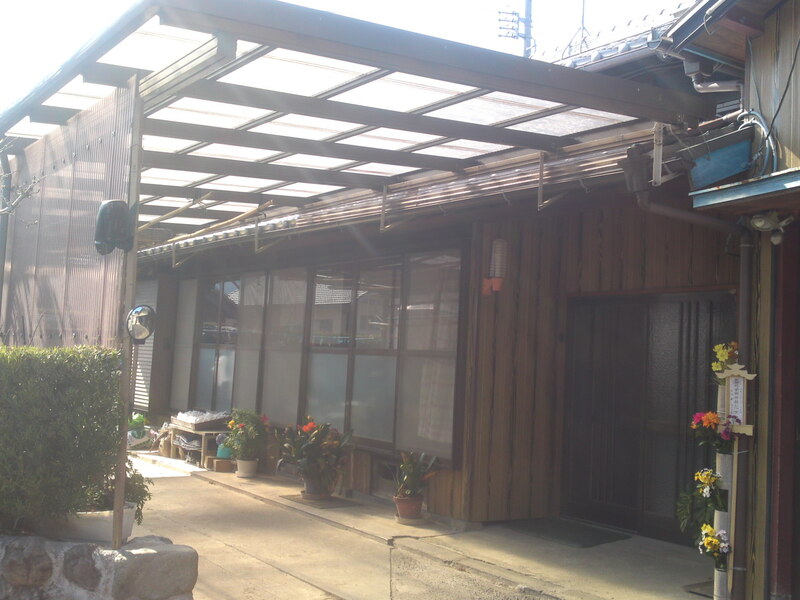 I’m already planning visits to Numazu and Fujinomiya Cities! 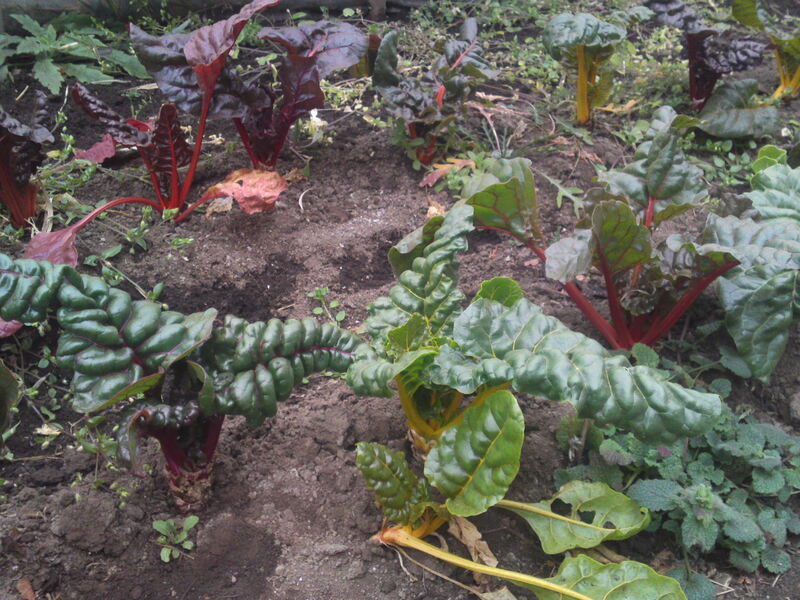 Our two ladies are not only lovers of agriculture but also gastronomes. 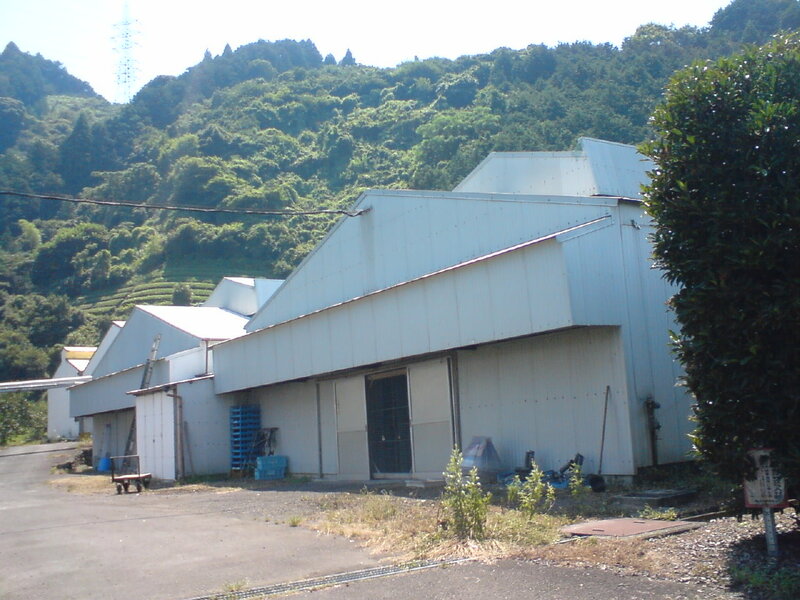 I have a few breweries and izakayas in mind for them! 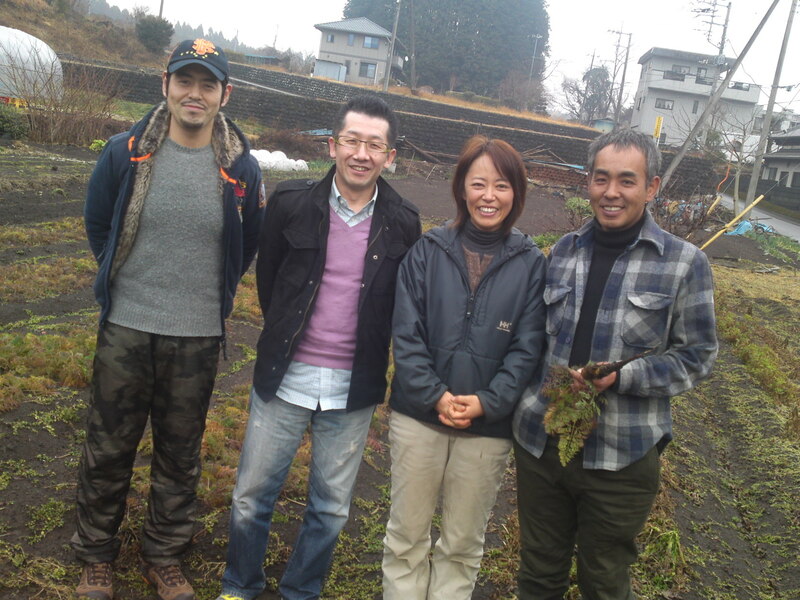 Kitayama Organic Farm: Great Chefs meet Great Farmers in Fujinomiya City! 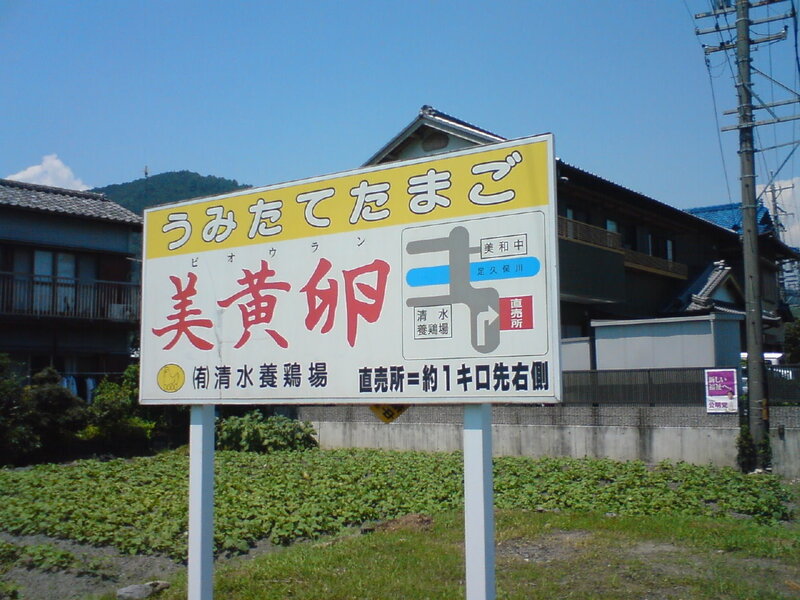 Fuminori Nishitani/藤谷文紀 of Nori in Fujieda City, Tooru Arima/有馬亨 of Pissenlit in Shizuoka City and the Hirakakis, Masaaki and Kiko/平垣正明・紀子 at Kitayama Organic Farm/北山農園 in Fujinomiya City! Today I finally had the honor and pleasure to introduce two of the very top chefs in Shizuoka Prefecture, namely Fuminori Nishitani/藤谷文紀 of Nori in Fujieda City and Tooru Arima/有馬亨 of Pissenlit in Shizuoka City to the Hirakakis, Masaaki and Kiko/正明・紀子, owners and producers at Kitayama Organic Farm/北山農園 in Fujinomiya City! This had been long in the offing and the three of us decided to drive this Tuesday all the way from Shizuoka City to Fujinomiya City at the very foot of Mount Fuji to visit the Organic Farm of the Kitayamas not only for a formal meeting but also to establish a gastronomic event to take place in the very near future! 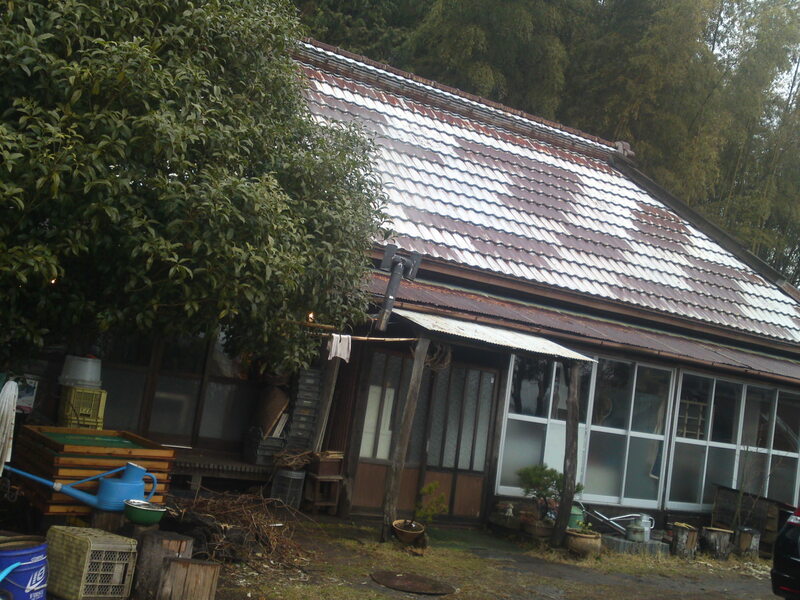 The Hirakakis have refurbished this ancient farmhouse on their own! Both were professional photographers before deciding to venture in organic farming! 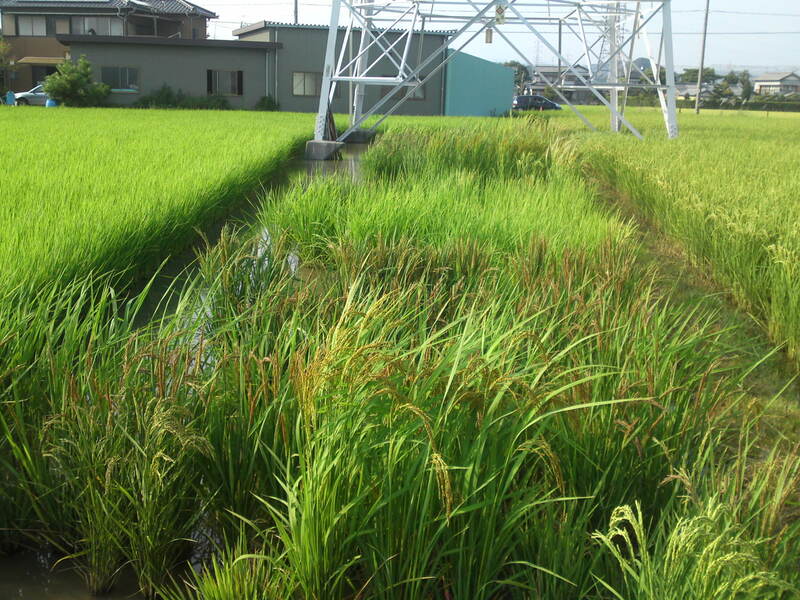 Pure water gushing down the slopes of Mount Fuji is one reason why Fujinomiya City is so celebrated for its superlative agriculture! Having gone through the necessary introductions I made myself scarce after a while to let them discuss their plans. 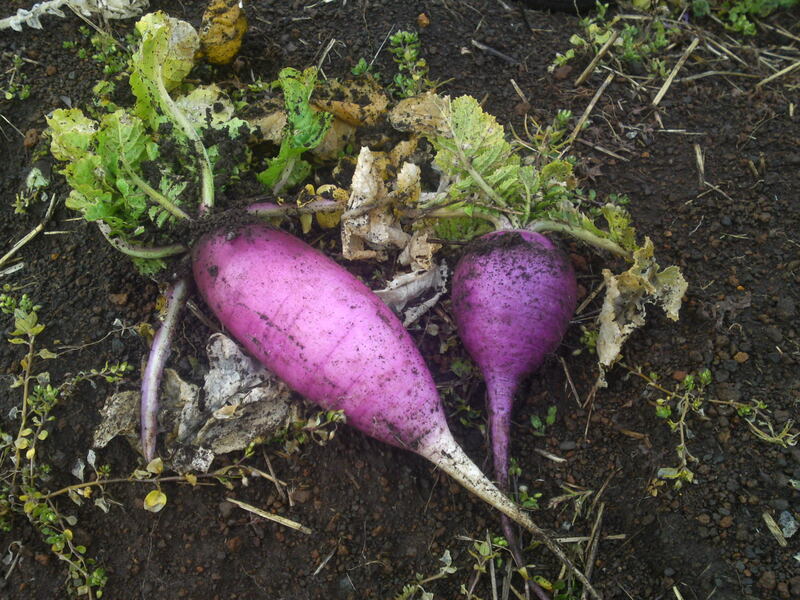 The two chefs had struck on the idea of a collaboration dinner at Restaurant Pissenlit on the 10th of March based on the vegetables grown by the Kitayamas whose merits I had praised for some time. 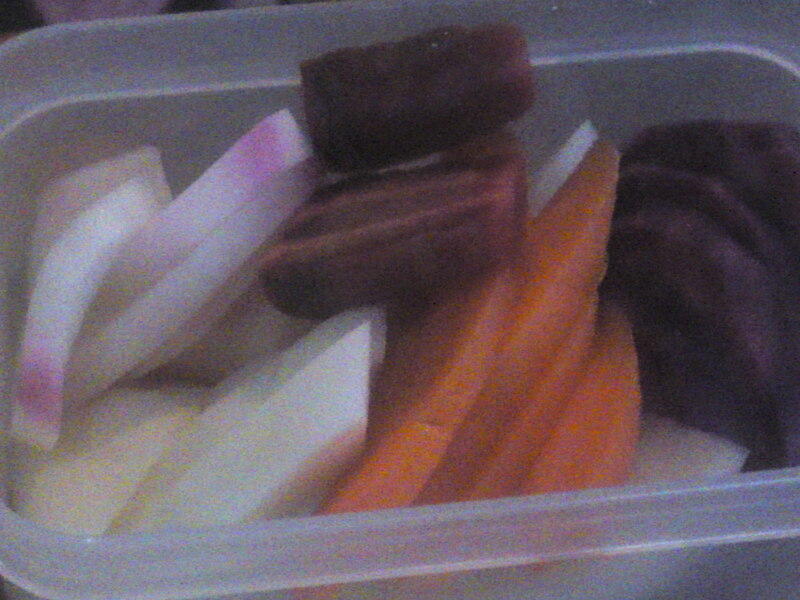 Delicious pickles from the same vegetables. Sorry for the fuzzy pictures but it was very dark inside the farmhouse! 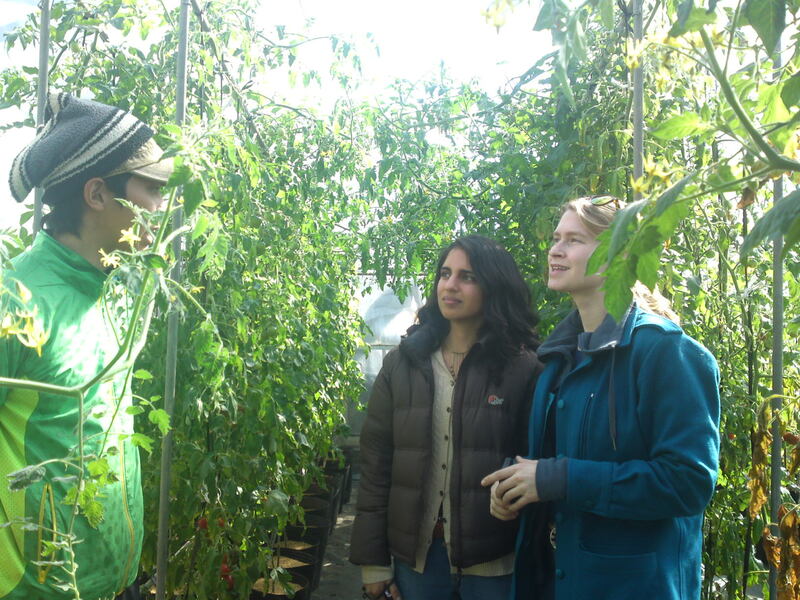 While they were deep in talks I took a peek inside a greenhouse behind the farmhouse. 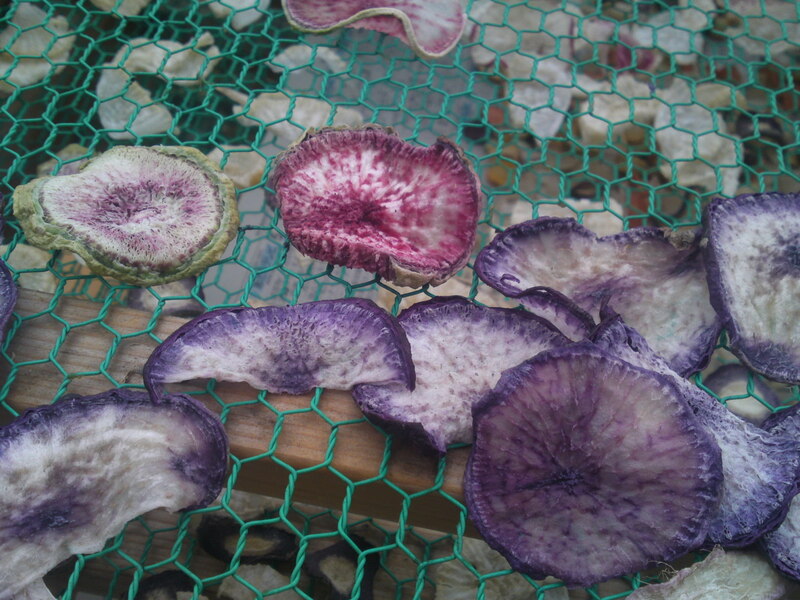 All kinds of sliced radishes and turnips left to dry! I came back to find them snacking on dried sweet potatoes! 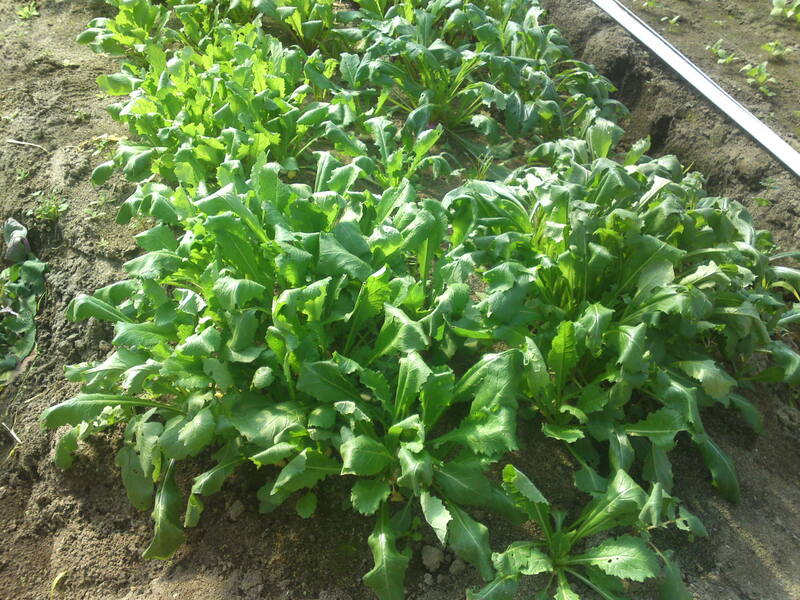 Artichokes that will be harvested beginning of next summer! 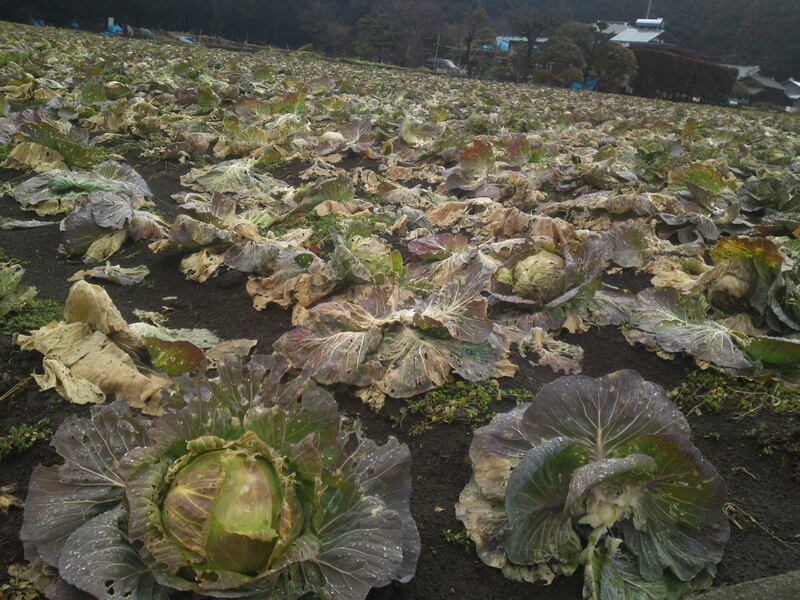 Time had finally come to make a grand tour of the 3 ha where the Kitayamas grow more than 190 varieties of organic vegetables at different times of the year! To be frank, there were so many kinds I didn’t have the time to write down their names! 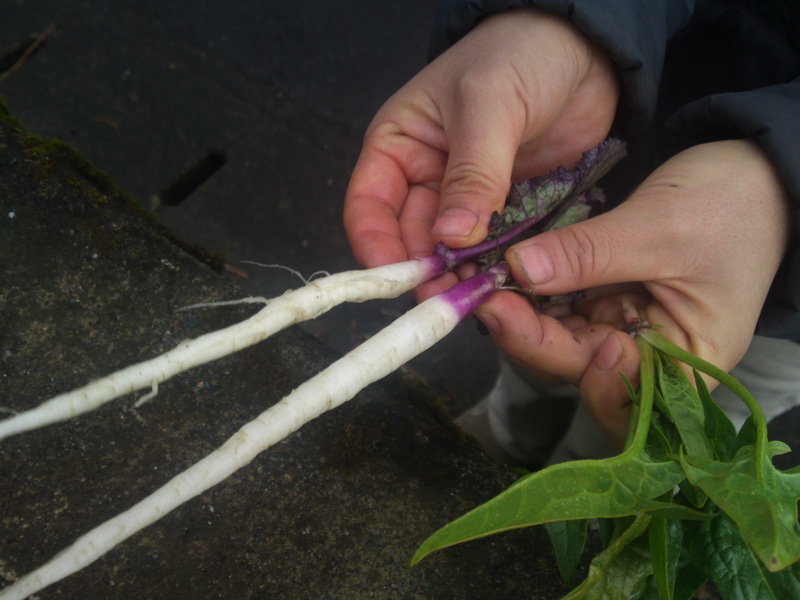 Shall we call these mini thread purple and white daikon? 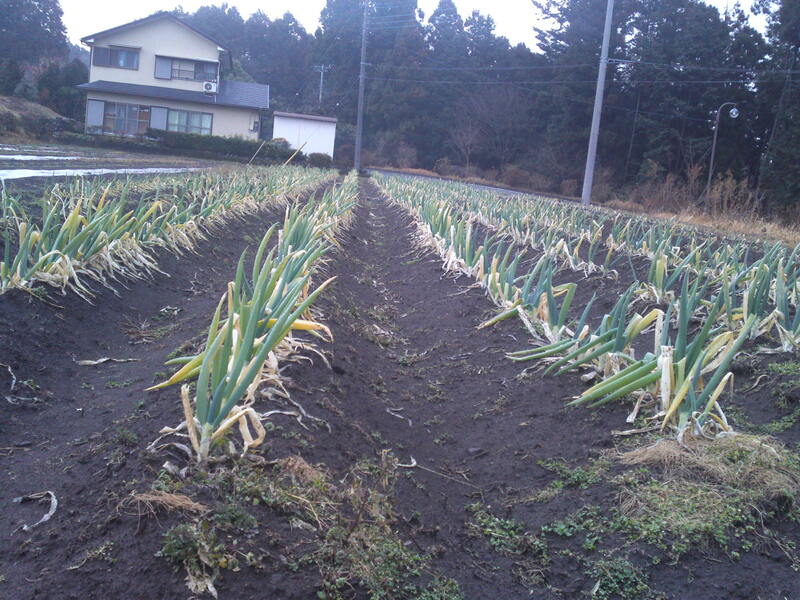 Highly valued variety of leek in Japan! Some of the beauties I took back home! 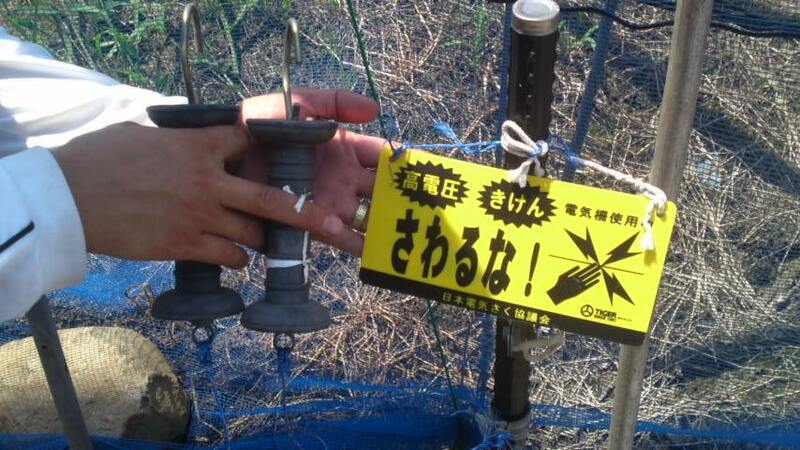 Looking forward to visiting the Kitayamas again next spring! 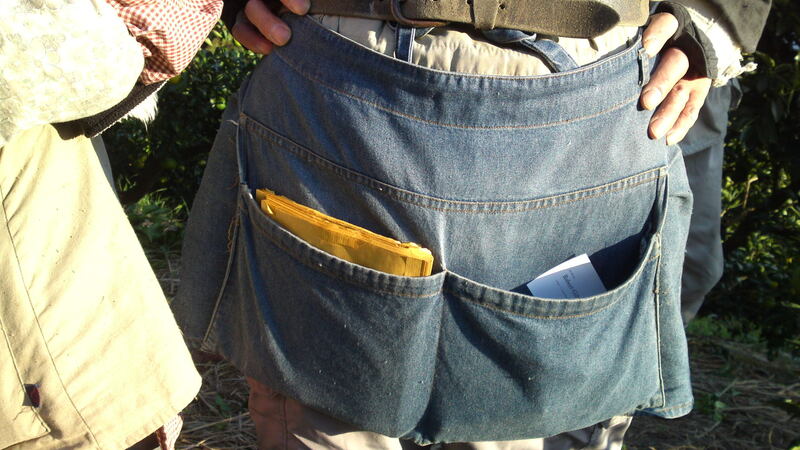 Private orders welcome over the phone! 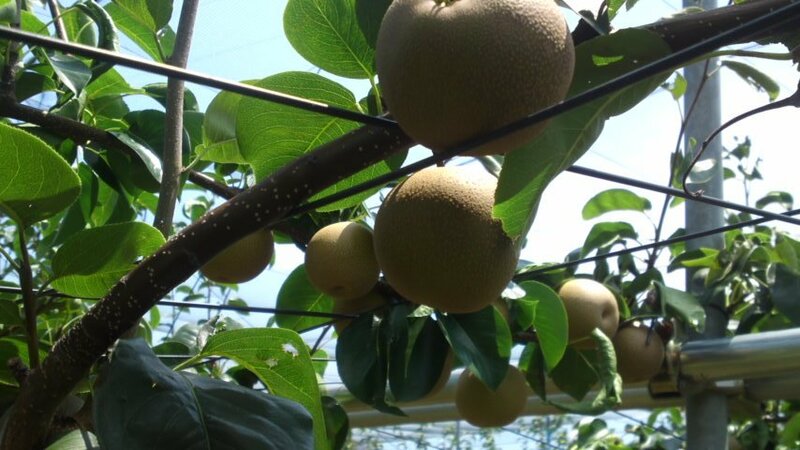 Nashi-Japanese Pears at Ichikawa Garden in Iwata City! 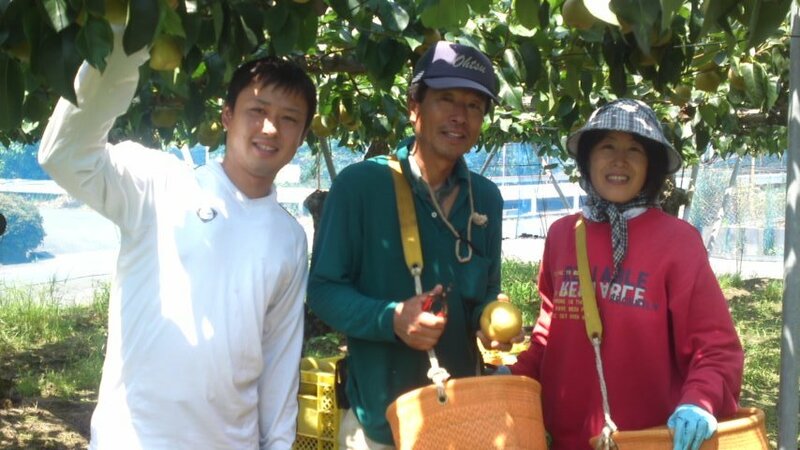 Two generations of Japanese Pear growers: Takeshi and his parents, Toshiyuki and Kumiko Ichikawa/市川、利行、久美子さん! 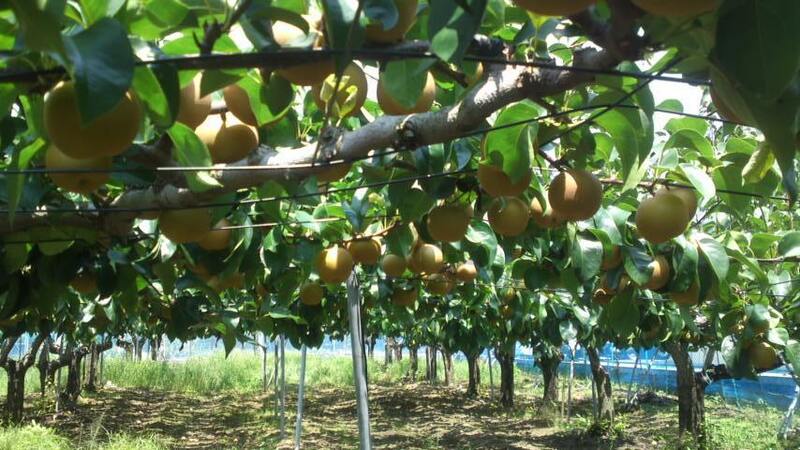 Nashi/梨/called Japanese Pears, Nashi Pears or Sand Pears and many other names are the fruit of hot summers par excellence! 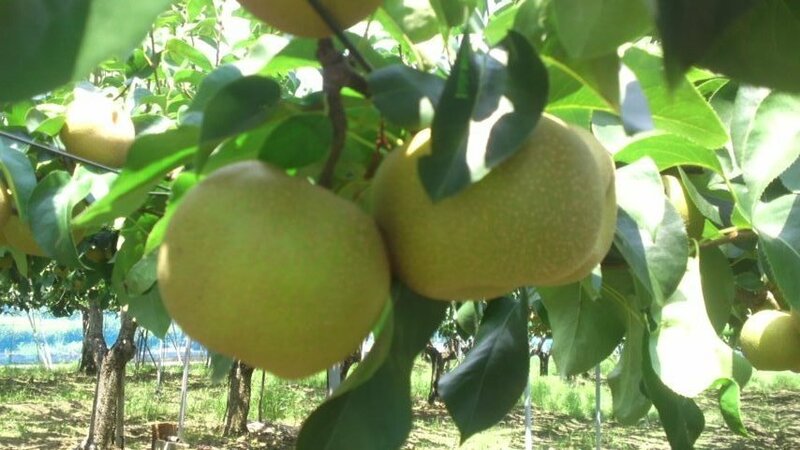 One has to bite into one of these crunchy and extremely juicy, and absolutely delicious, fruits once to understand why Nashi Pears are also venerated as the true fruits of life! 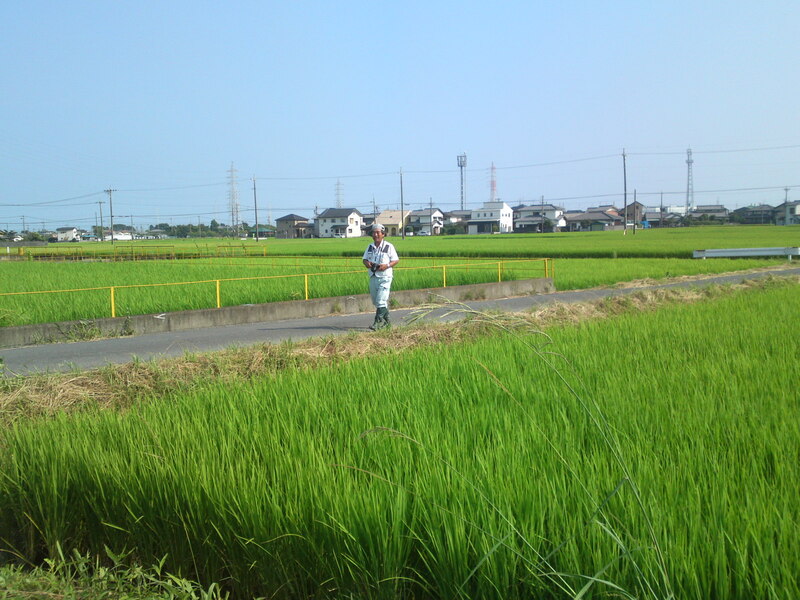 It was another blinding hot day again yesterday and I was certainly grateful for Takeshi San to come all the way to Toyoda Cho Station and then to take me all the way again to their fields and house! 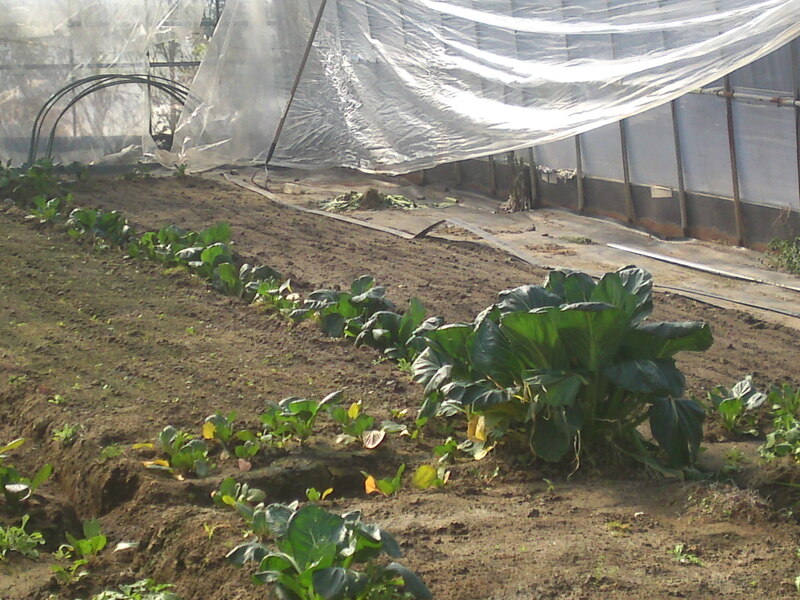 The same fields are heavily protected by nets for all kinds of obvious natural reasons! 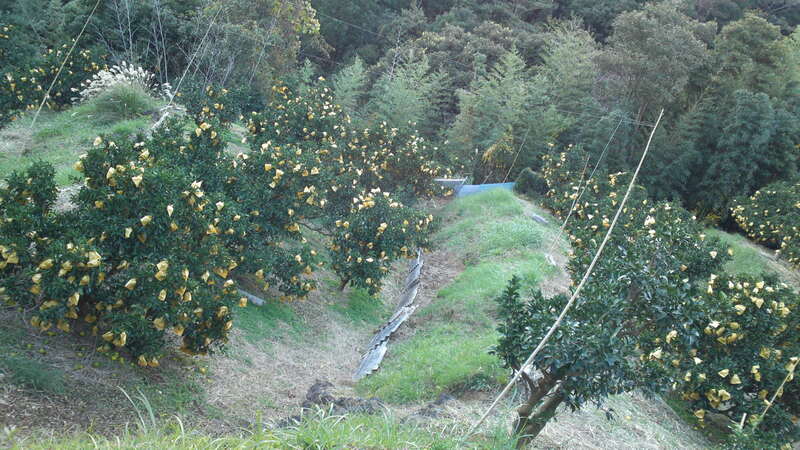 The Ichikawas mainly grow two varieties of nashi pear, Housui/豊水 and Kosui/辛水, the former ripening in August and September and the latter in full production right now. 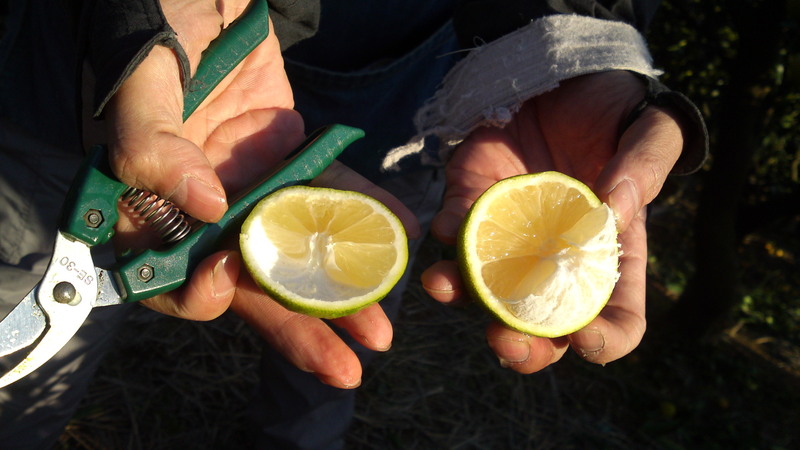 Both are extremely juicy and tasty! Hosui Pear, still comparatively small. 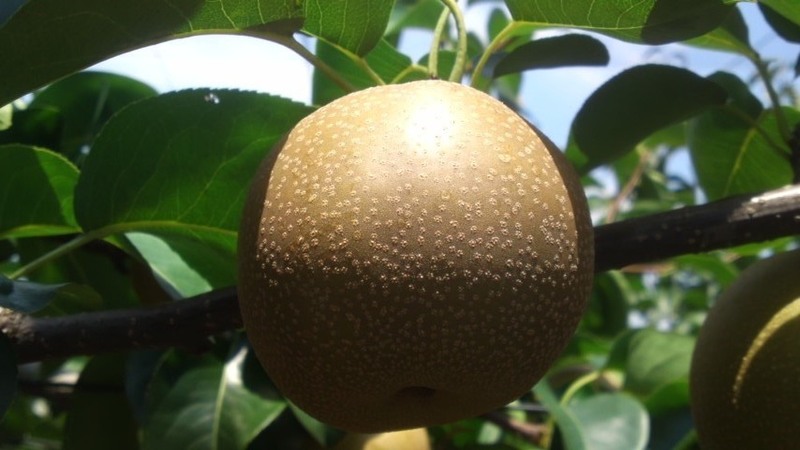 The Kosui Pears are lighter in color wth a different skin pattern. 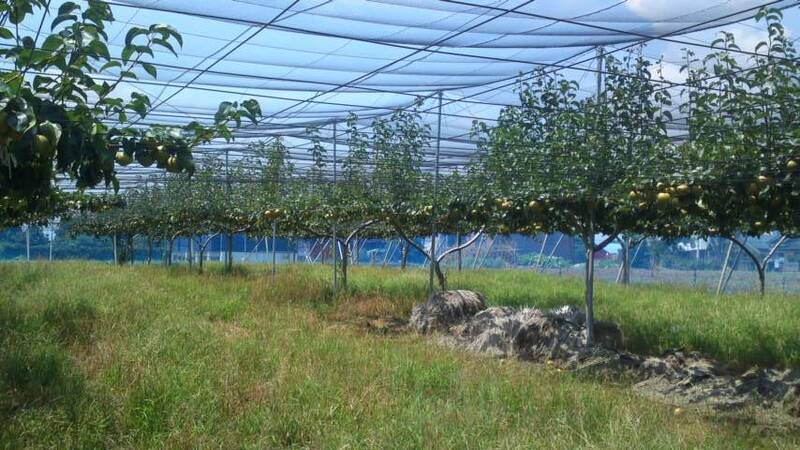 Growing nashi pears organically at sea level is practically impossible but all that grass proves that the Ichikiwas use only the strict minimum of pesticides! Actually, they have cut all ties with official “Agriculture Associations” so as to conduct the agriculture they think is right! 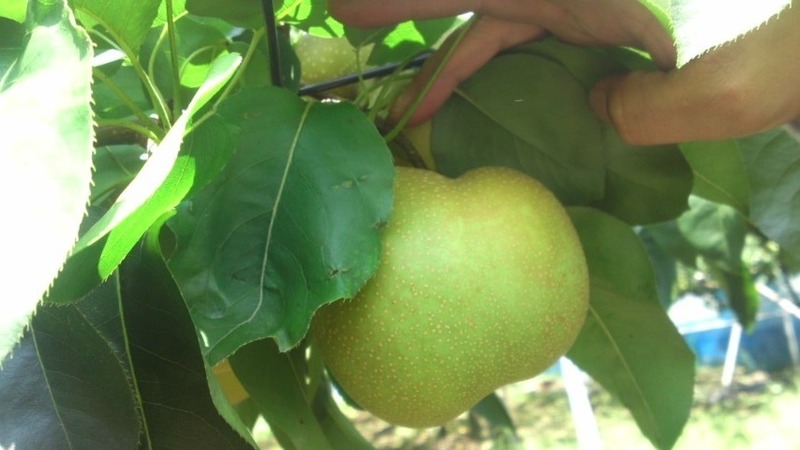 A lot of pears fall naturally and they will be included with other natural fertilizer to be mixed with the soil when they till the ground between the trees in winter. 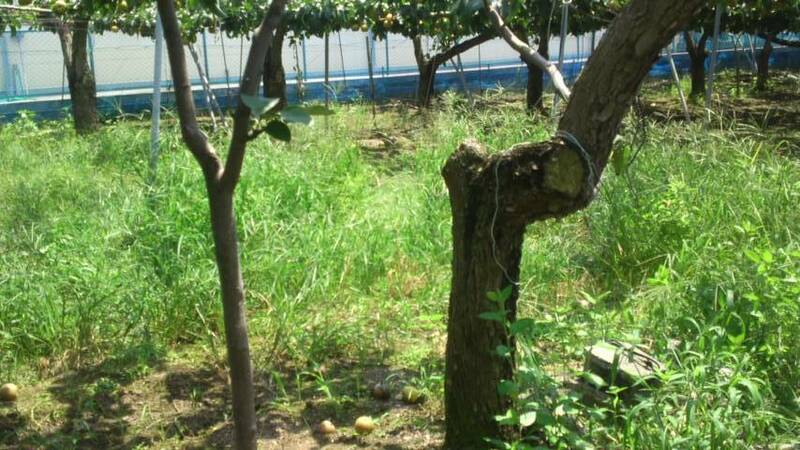 I can assure you it is tough work to keep these orchards clean in their three locations for a total of 40 acres, what with typhoons and other unpredictable weather conditions! 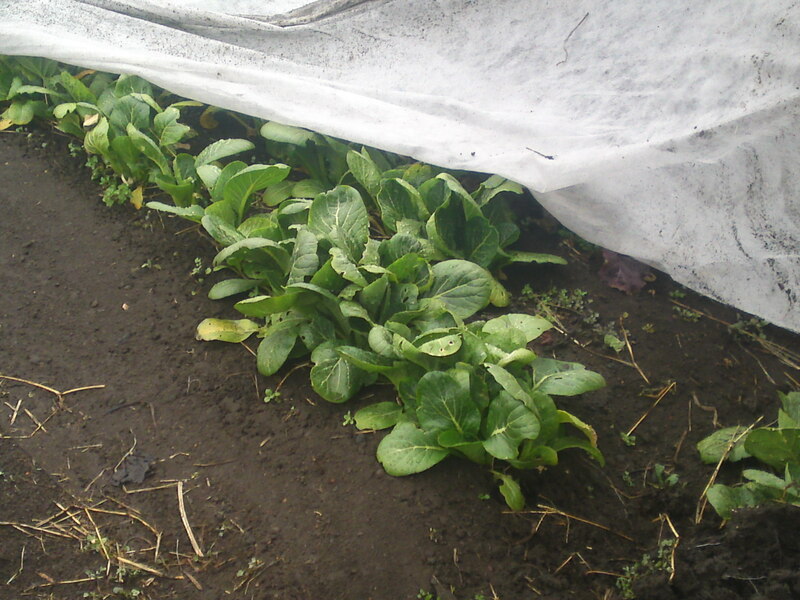 For all the hard work harvesting lettuces in winter, corn in spring, pears in summer and rice in autumn, they never stop smiling! 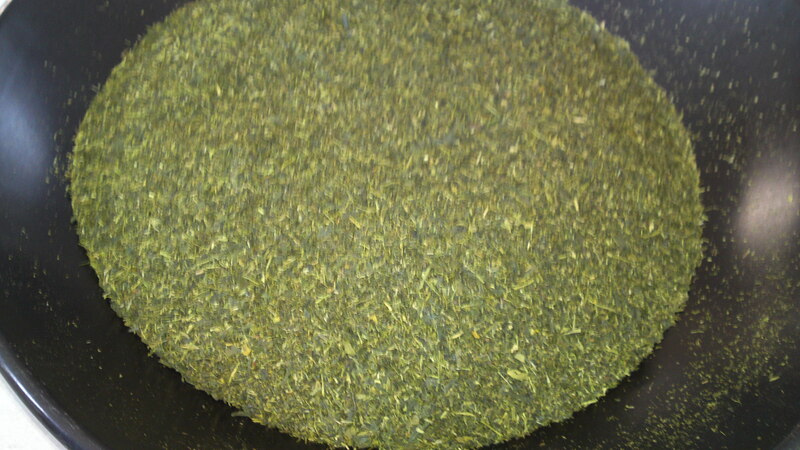 The crop of the day! A lot of manual and mechanical work involved! 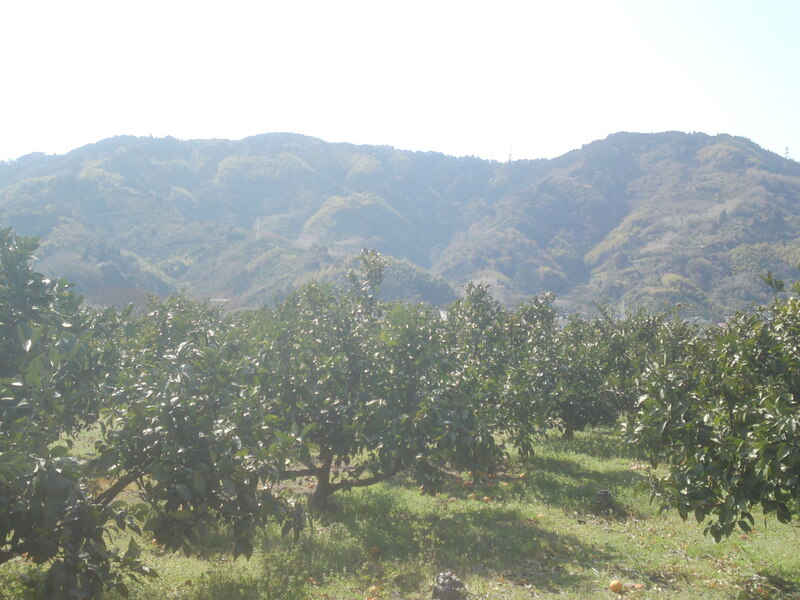 Takeshi’s father started his orchards 30 years ago and gradually replacing all these trees takes time and care. The above have a difference of more than 25 years! The old one is actually about to collapse! 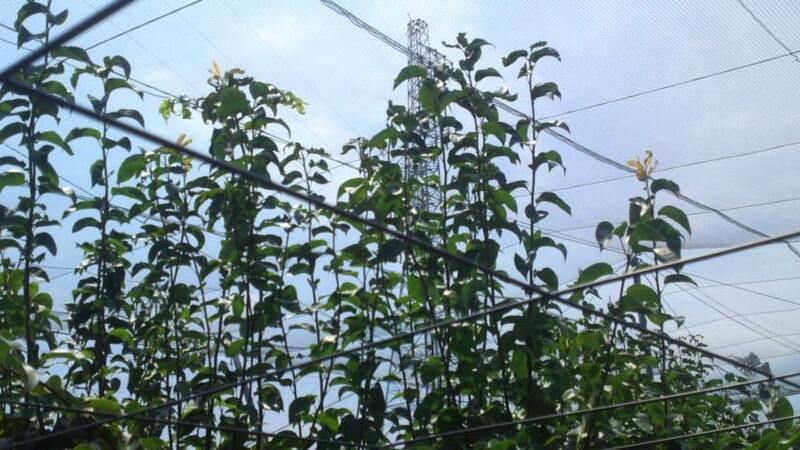 The orchards have to be protected not only with nets against birds but also with electric wires against civets! 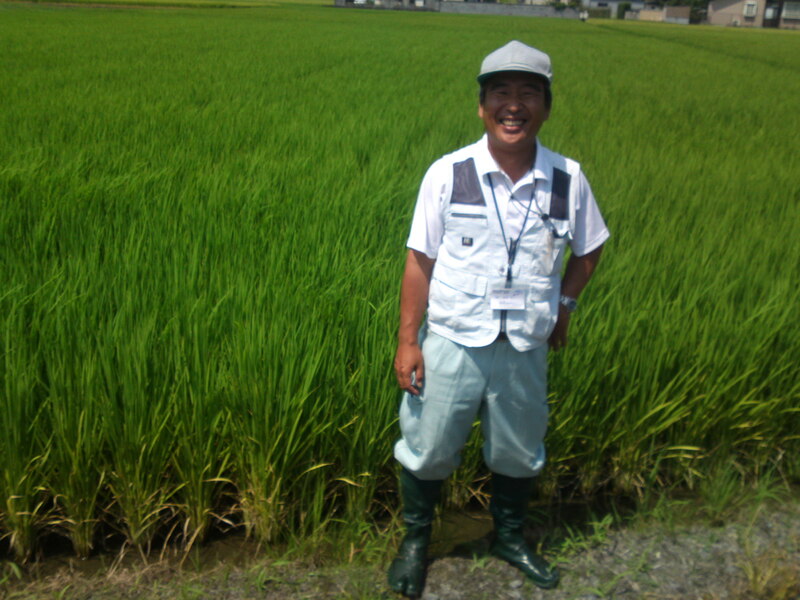 Takeshi san took me to another field where new trees had been planted 5 years ago and bore their first commercial crop! A lot of investment is involved there! 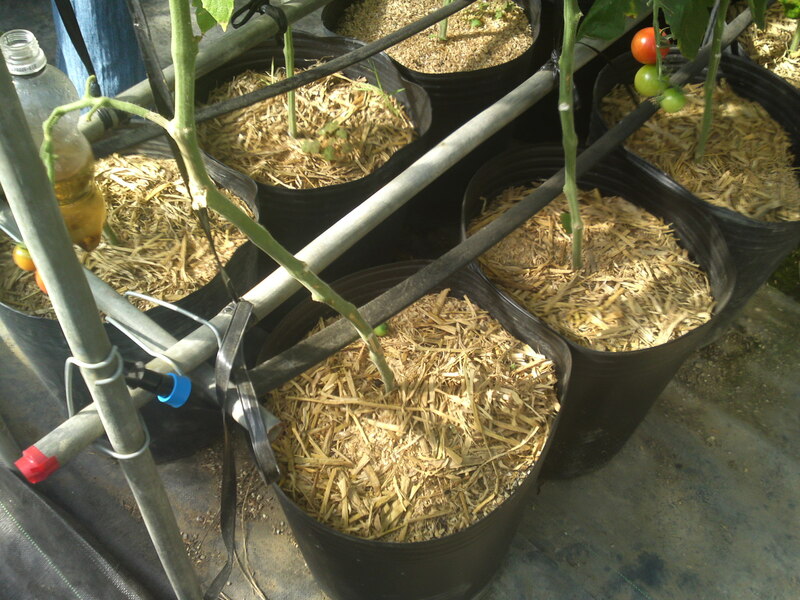 These new branches will be bent down into a canopy at head level for better reach and control! 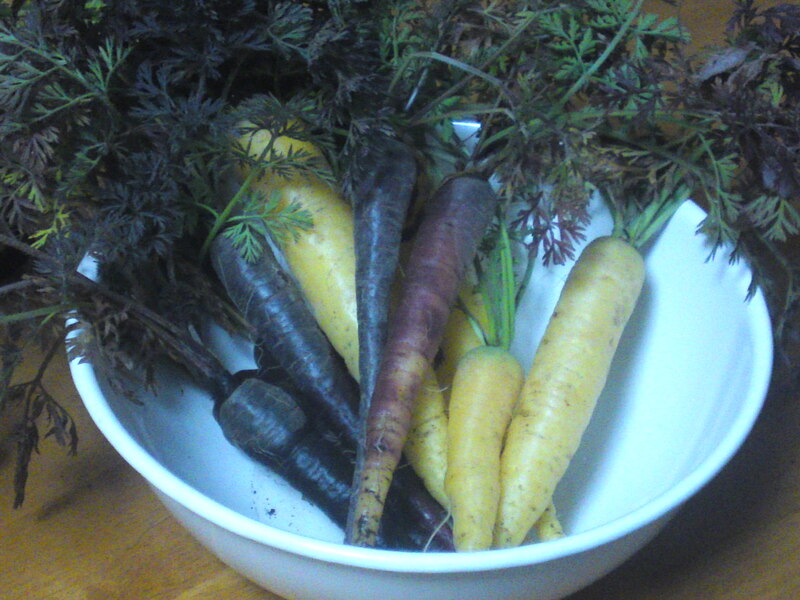 These are actually a new variety called nikkori/にっこり that matures as late as October! 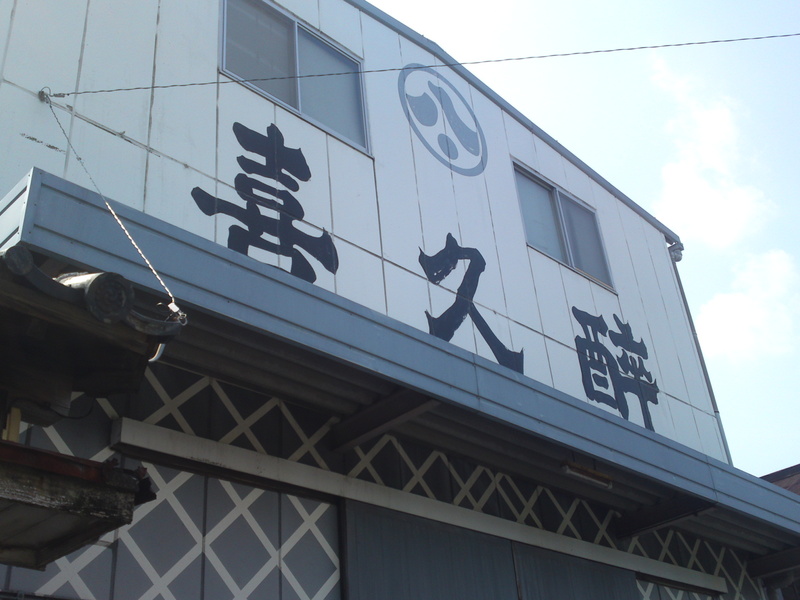 You will not find the Ichikawas’ pears in any shop as they sell them only directly at their orchards or from personal order! Even so they have a hard time satisfying all the demand. 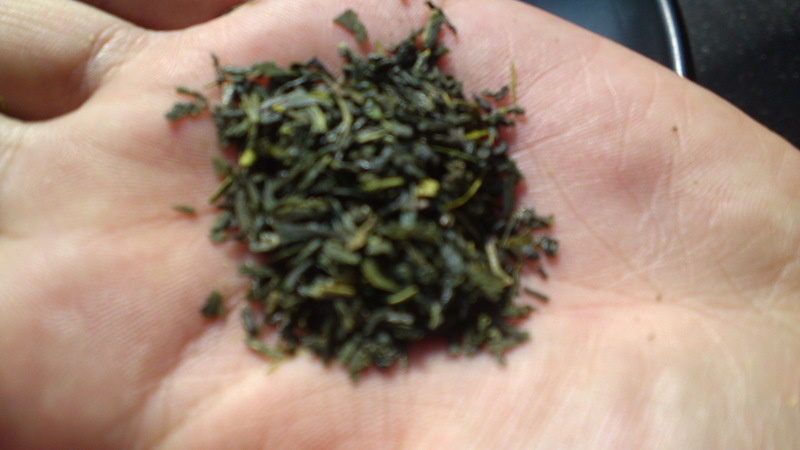 A proof of the extravagant quality! Already all packed and ready to go! Don’t worry, I managed to get mine! Actually I can help you get them personally! 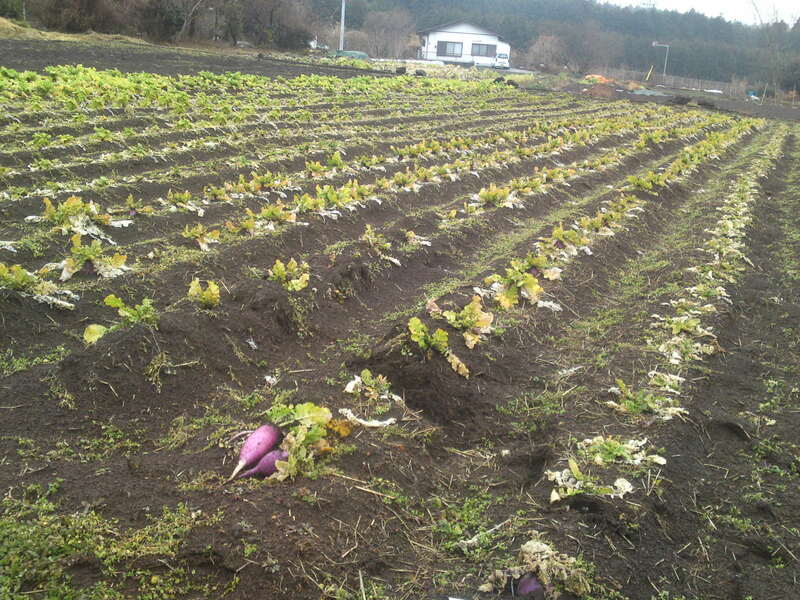 As any farmers worth their salt, the Ichikawas grow all kinds of vegetables for their own use and extra earnings! 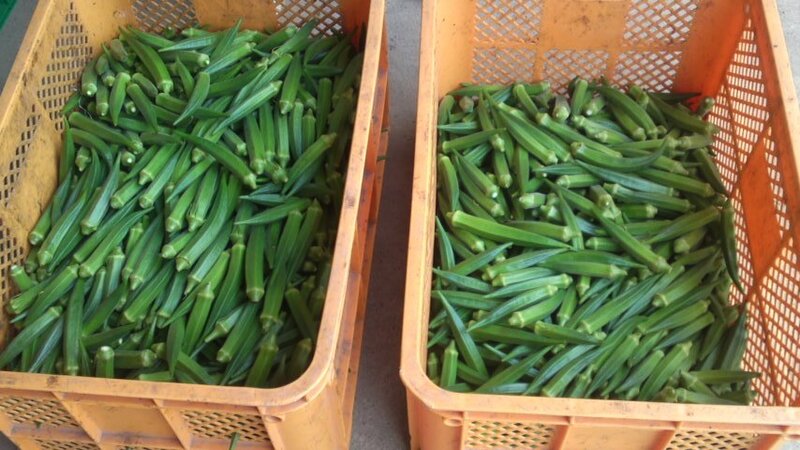 I took a big batch of those beautiful okra back home!